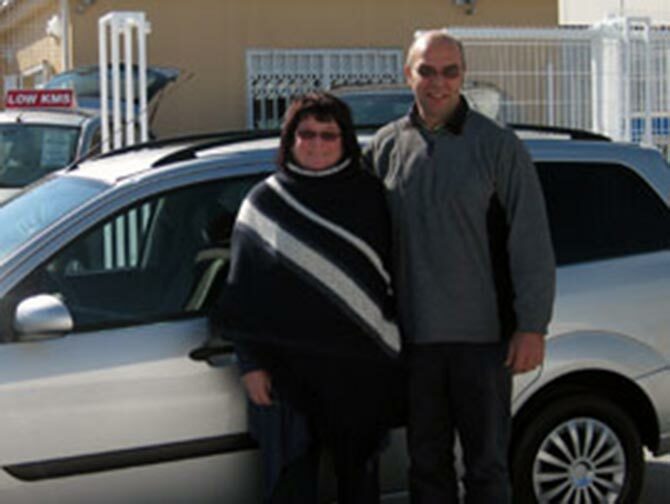 AutosDirect - Testimonials - We love making our customers happy! We love to make our clients happy. That means selling our customers the right car at the right price! We would love to hear from you! the team at AutosDirect in San Miguel. We would not hesitate to recommend them to everyone. 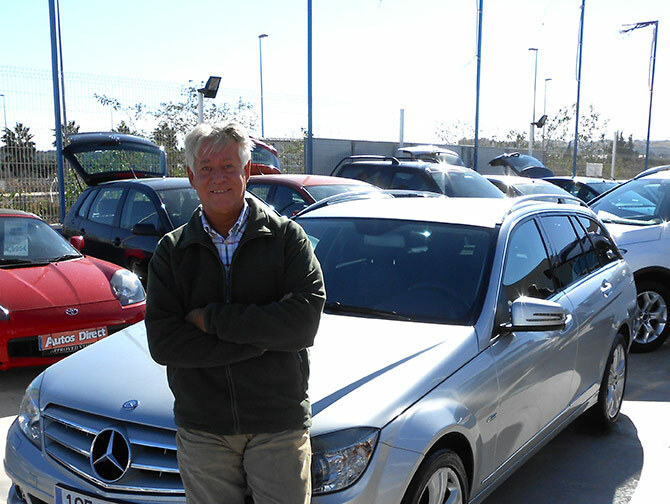 We would like to thank the sales and aftersales team at san Miguel, especially Kevin who really made us feel special. Thanks again I will definitely use autos direct again!! 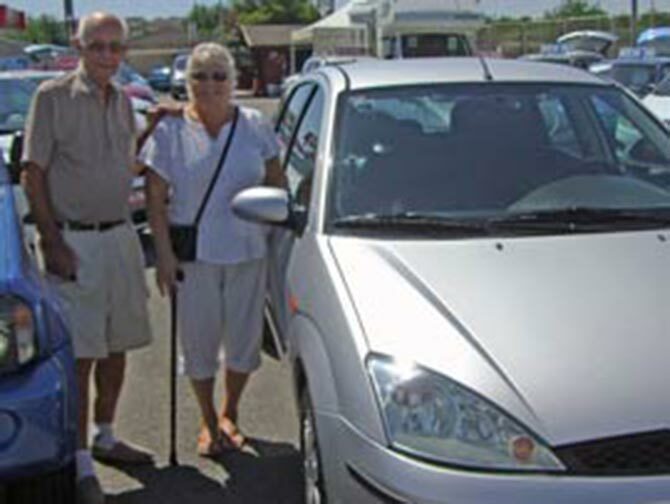 We were treated very fairly by Autosdirect, the insurance was arranged on our behalf, very pleased with the car, the whole transaction was very smooth. Thanks very much. After a lengthy chat we left our requirements and were dropped off at home, we could not believe it when Kevin called the next day having sourced the perfect car for us within 24hrs!!! 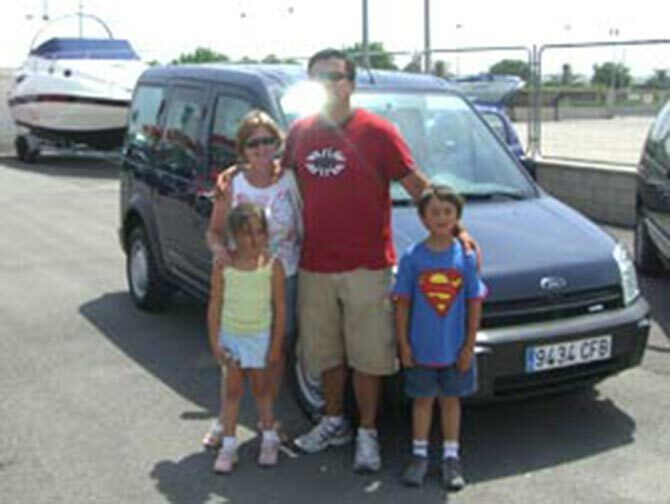 We were collected once again, shown the vehicle, and we knew straight away that it was the perfect car for us. Also, on delivery Kevin brought the car to our house, and what really amazed me was all the car papers were already transferred into my name! Thanks again and if your looking for a new vehicle go and see them at AutosDirect. 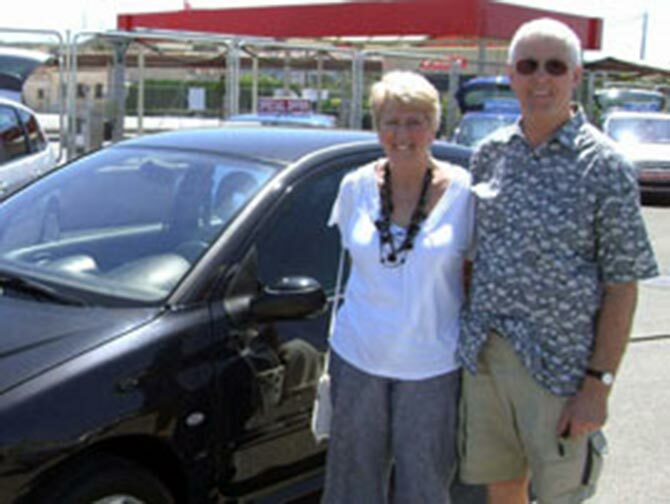 I was most impressed with the efficiency and the level of service I received when I bought my Honda from Autosdirect. 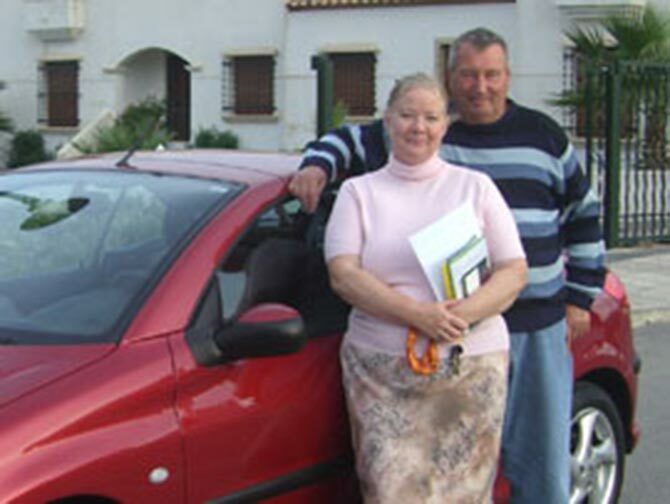 It was great not having to worry about all the legal aspects as they sorted out the tax, insurance and transfer for me. PS, the log book was even back in my name within 24hrs!!! 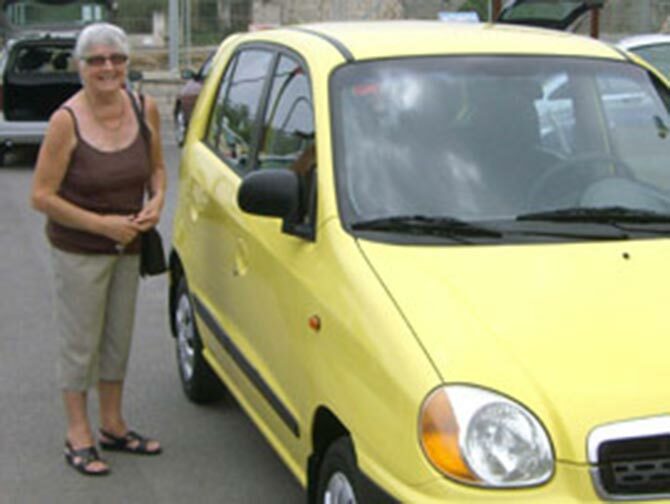 Thank you for finding me a very nice Nissan Micra which suits me very well. 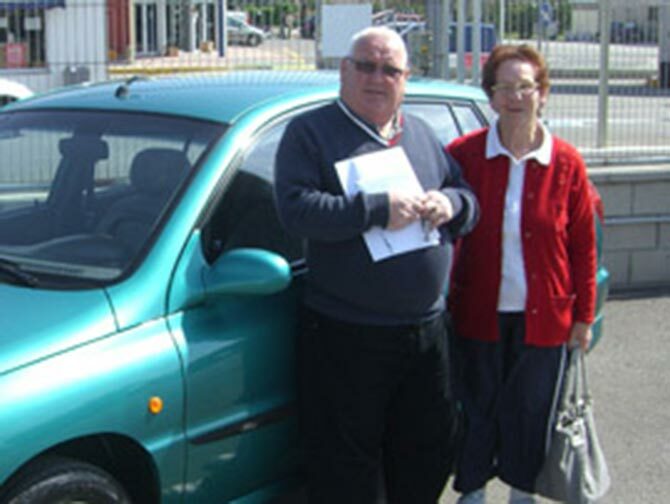 Autosdirect set up the insurance, and took care of all the paperwork which went very smoothly! Thanks to Paul at Autosdirect who dealt with me during my purchase. I received my log book on the day I collected the vehicle, the car was absolutely gleaming, well serviced and cambelt changed. Thanks for really looking after us when purchasing the Galaxy! 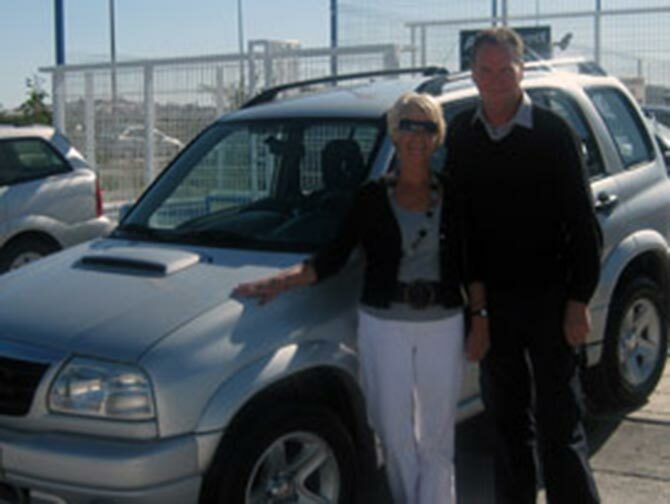 All the paperwork and insurance was taken care of for us, and they even picked us up from Alicante airport! Overall very satisfied, and would definitely use Autosdirect again. 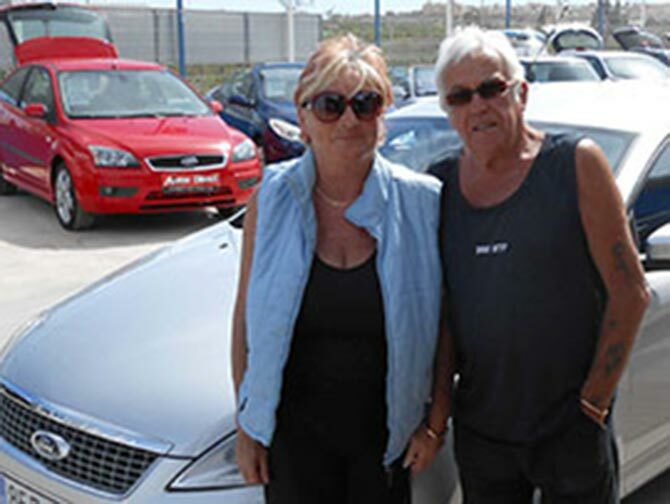 Thank you for the excellent service, and for finding us such a lovely car. 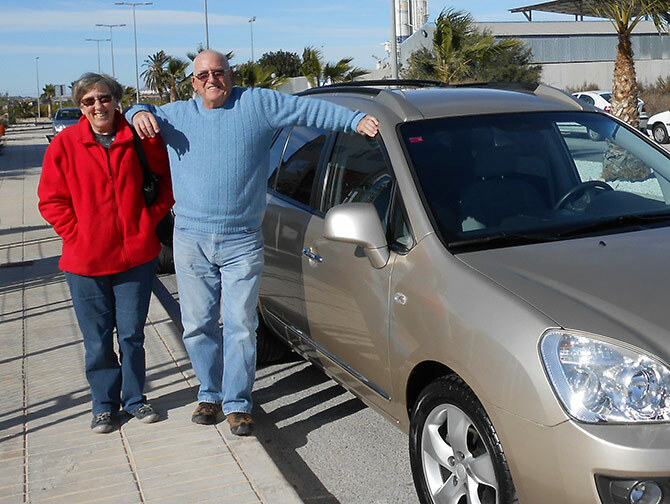 Also special thanks for bringing the car to San Javier airport on a Sunday evening! We will recommend you to all our friends. I can’t thank AutosDirect enough! They arranged everything for us. Our new car was beautifully presented and I was shown all the controls. Thanks a lot. You hear of many different stories about living the Dolce Vita in Spain. 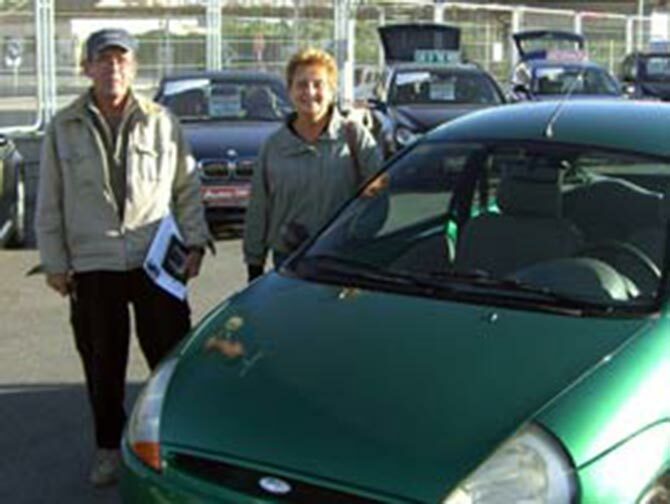 Buying a car is one of them and for us buying a car from Autos direct has been a most pleasant experience. Paperwork, legalities, limits and advice all expertly taken care of, by Paul and Kevin and fully explained. Thankyou so much!! Thankyou all at Autosdirect for the excellent service shown to us on the purchase of our new car. They have been very kind and helpful. What a fantastic company to deal with! Helpful, reliable and very courteous. We dealt with Kevin who did everything for us, picked us up from home, and provided the paperwork and insurance. The car looked like new by the time they had finished with it, and smelt lovely too!!! Highly recommend!! Thanks so much to Autosdirect for their patience in finding the vehicle which met our criteria. 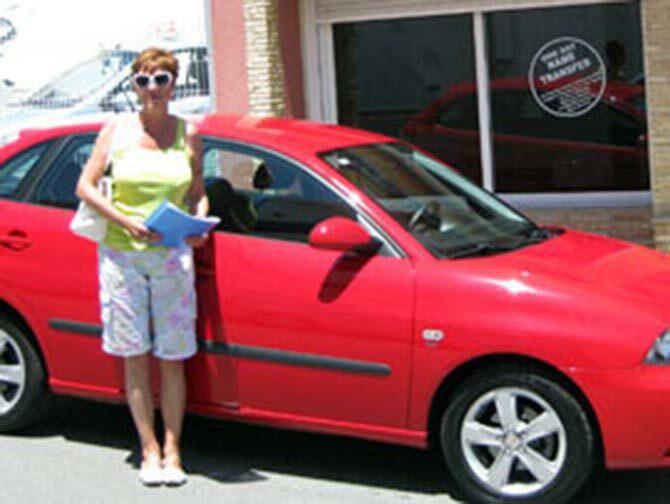 The service was excellent, and I was delighted to have overcome the transfer paperwork which was all completed speedily by Paula and her colleagues. The car was in beautiful condition when I picked it up and I appreciate the extra’s provided. Muchas Gracias. 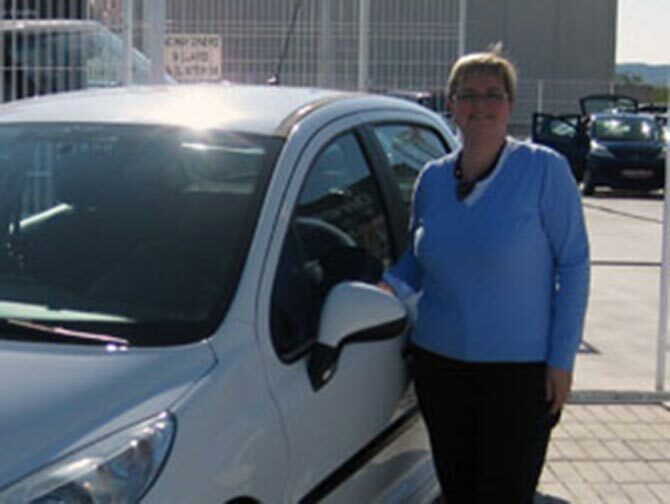 Thank you for your excellent service - very happy with my new car you were all very helpful. Thank you for simplifying the process, and making buying so pleasant, and you were most helpful with the paperwork and insurance, we have already recommended you to our friends. We are delighted with our new 4x4. 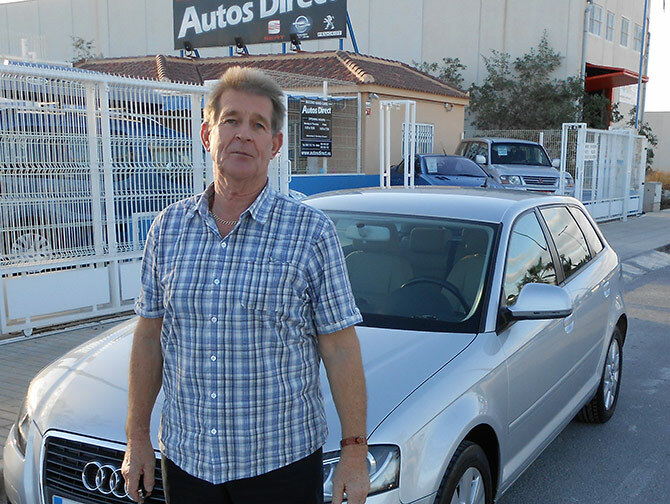 AutosDirect found us exactly what we were looking for and at the right price. The car was beautifully presented when we picked it up. We will recommend you to our friends! 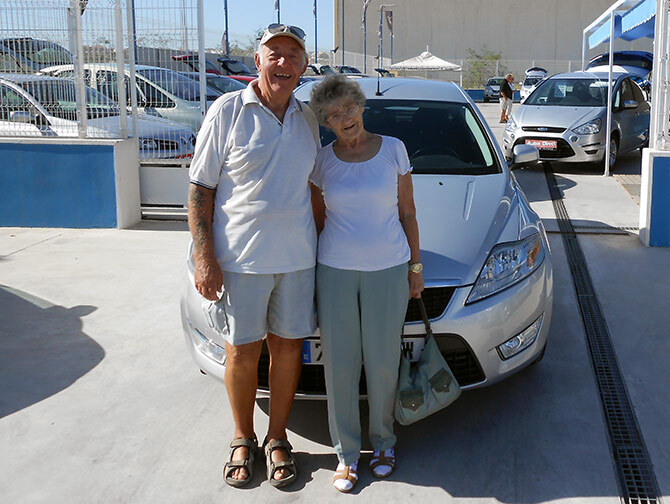 I was recommended to Ad by Mr and Mrs yates who have previously bought two cars from Kevin and Paul, and everything they told me would happen happened, from start to finish they dealt with me excellently , overall very very happy. Thanks to everyone at team Autosdirect overall very satisfied with everything. 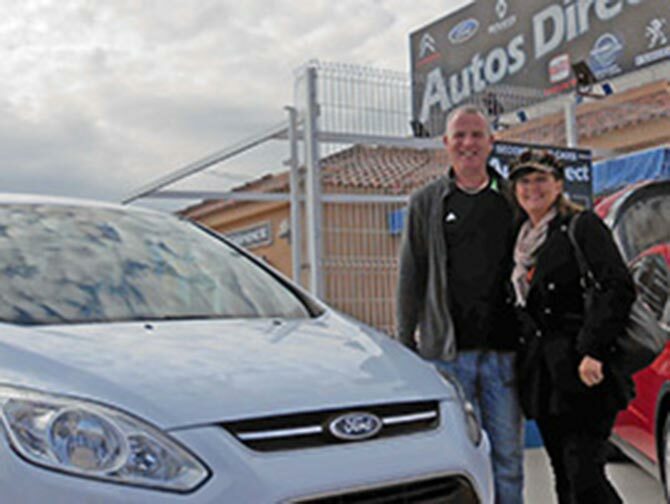 We would like to thank Autosdirect for an efficient and courteous service, making our first car purchase in Spain hassle free. 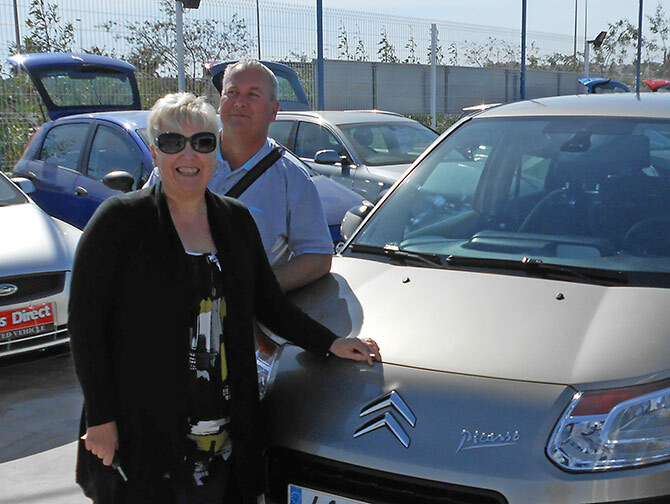 I am Delighted with the Citroen Picasso purchased from Autosdirect, I found them honest and trustworthy to deal with. Autosdirect gave me a good deal and provided me with the type of low mileage car that I had asked about. I will do business with Autosdirect again. 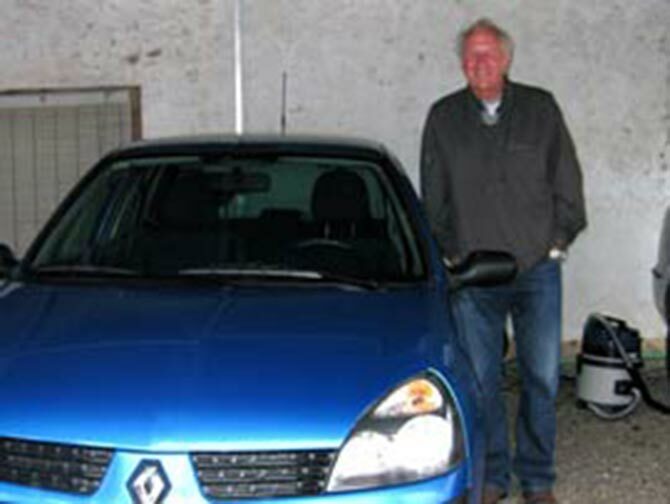 I am very delighted with the car I have bought from Autos Direct, the car runs beautifully. It was a pleasure to deal with the company Autos Direct who were charming. This is the second car we have bought from AutosDirect. We are more than happy with the service we have received from the staff at AutosDirect... from the initial purchase of the vehicle through to the aftersales dept nothing is too much trouble for them. They really care about their clients. 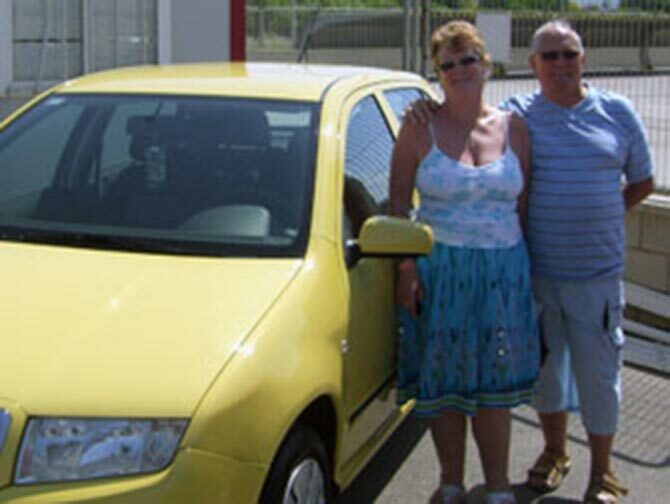 We have no hesitation in recommending AutosDirect who make car buying a pleasure. 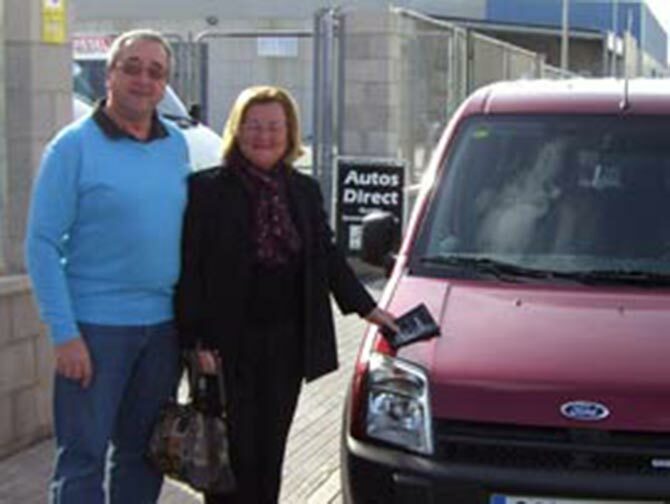 We have been very happy with the service from AutosDirect. We had quite specific criteria which they were able to match (hooray!!) The purchase process was hassle free. We are delighted with our (nearly) new vehicle, and would definitely recommend Autos Direct to our friends and neighbours. Just would like to say that you receive only the best of attention from AutosDirect. There was no pressure put on us, but lots of sound advice and help. So whatever type of car you may be looking for give AutosDirect a call. 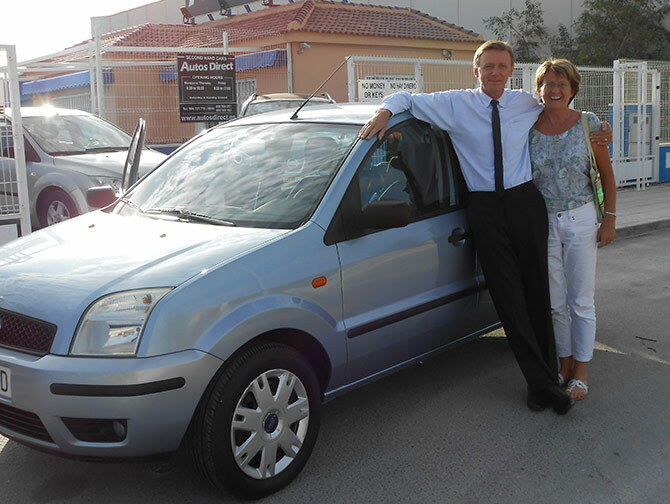 A big thank you to the team at AutosDirect for all their help and assistance in buying our car. They were very friendly and gave us good sound advice about the requirements. With thanks and best wishes.. This is the second car I have bought with AutosDirect. Need I say more? 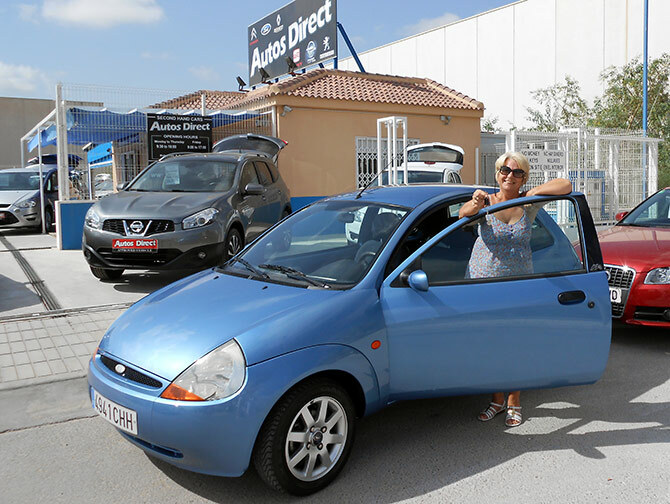 We have just purchased a wonderful low mileage car from AutosDirect, they were the most helpful and friendly used car sales people we have ever met. 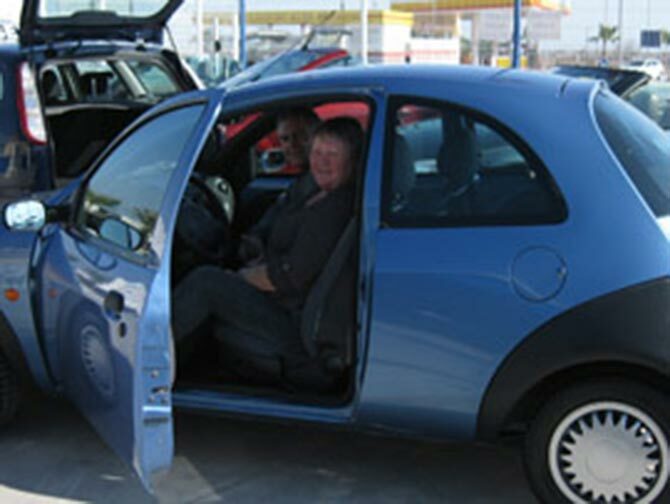 No pressure, helpful tips and a good price for our part exchange, as well as finding the car we were after with automatic gears for the wife. Having been in business ourselves for 45 years we appreciate a good company to deal with. 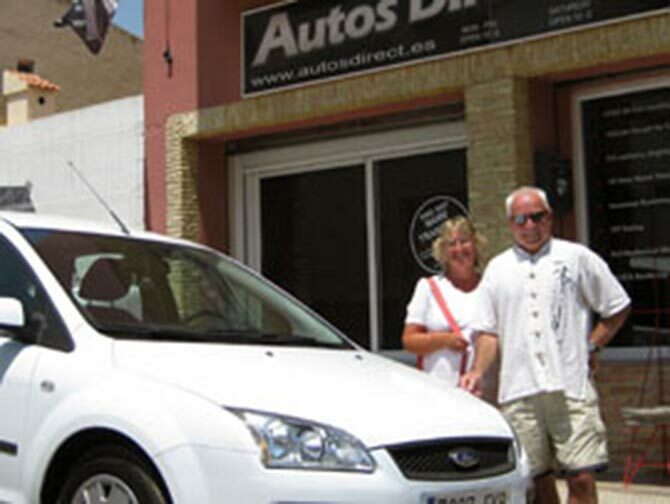 We would have no trouble recommending AutosDirect to anyone looking to buy a car in the Costa Blanca area. 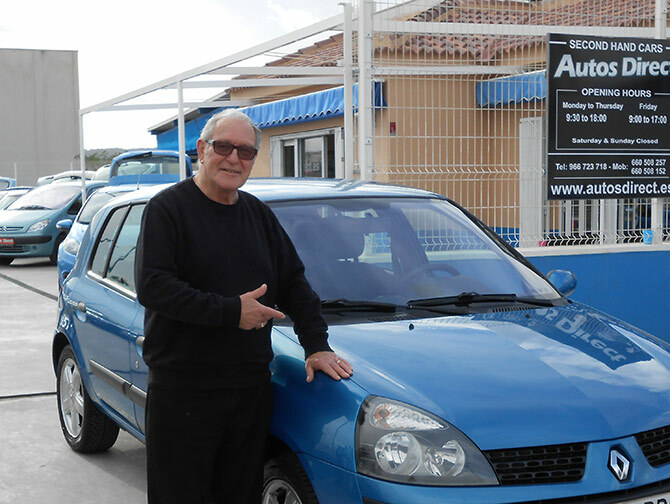 I was impressed by the friendly staff and how keen they were to ensure that the car was checked and working to my satisfaction and have no hesitation in recommending AutosDirect. This is our second car from AutosDirect! Everything ran like clockwork. The staff were very helpful and always willing to go the extra mile. We will continue to sing their praises and will be back in about three years for our next car. 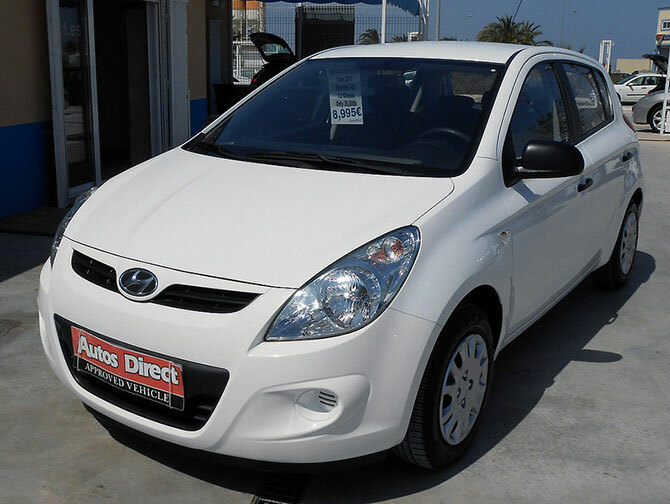 This is our first car from AutosDirect. Everything went very smooth including all service from the staff. This is our first purchase through AutosDirect. They listened to our requirements and found just the right car for us. They are polite and very professional in their work and we would not hesitate to recommend their services. The car itself has proved to be perfect and although there were a few teething troubles in the beginning, Autos Direct dealt with them in a very satisfactory manner. This is a Company that cares, not many of them around nowadays. Thanks to all at AutosDirect for a very quick and easy service. Very professional run company. Everything was taken care of with 100% efficiency. Alan dealt with everything and answered all our queries with honesty. 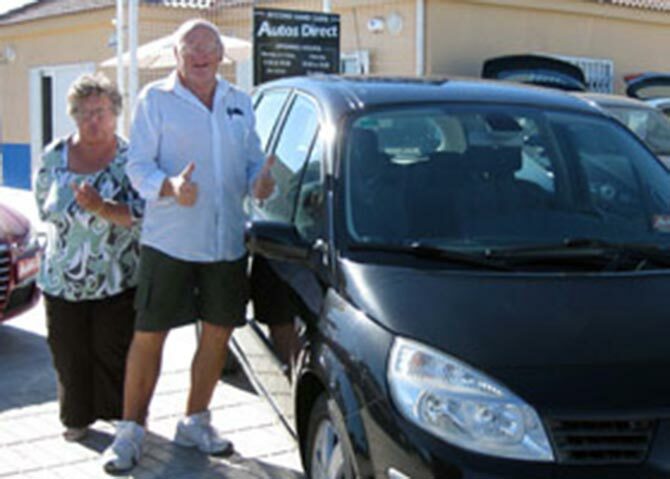 We would recommend AutosDirect to anyone who wants to buy a car without any hassle. 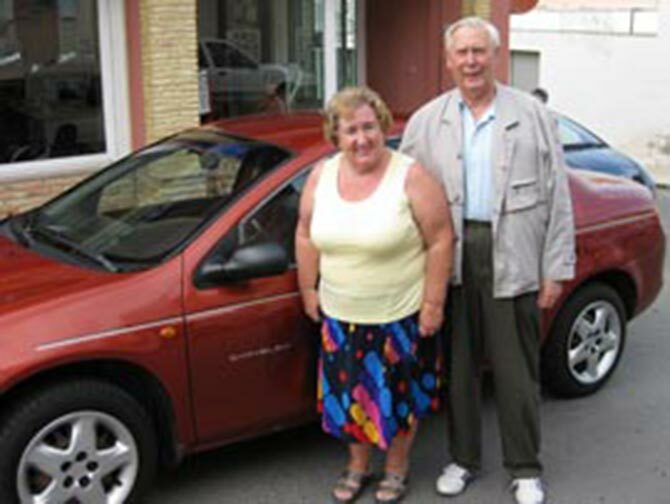 We were recommended to AutosDirect by friends and have found them to be reliable, courteous and helpful. 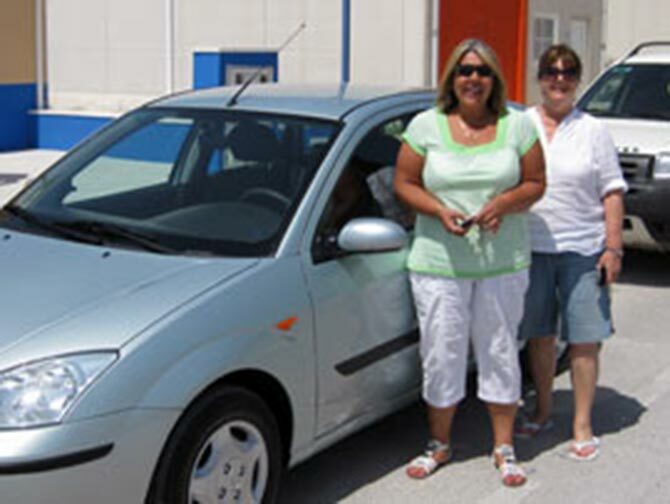 This was our first experience of buying a car in Spain. We were very pleased with the service we received from AutosDirect and would have no hesitation in recommending them to friends. From start to finish, first class service. After our first contact they supported our request and kept us informed while in England. On collection all the paperwork was sorted and ready, with no problems. Thanks for all your help! Many thanks to AutosDirect! 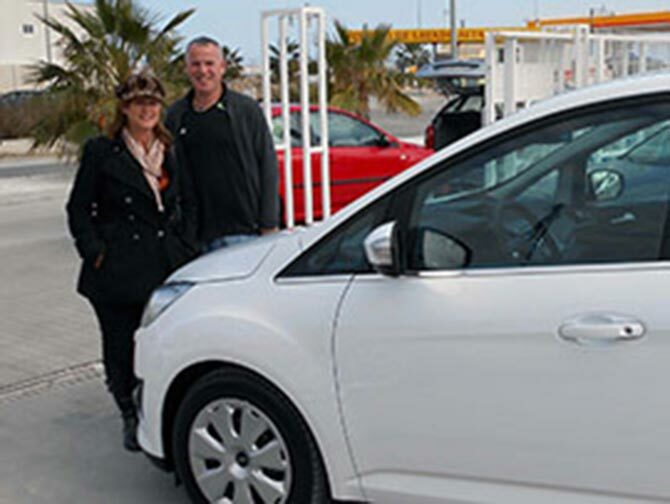 The whole process of purchasing a car in Spain was made simple. AutosDirect took care of all the paperwork, and everything they promised was delivered. We have no hesitation in recommending this "five star" service to family and friends. Thanks again! 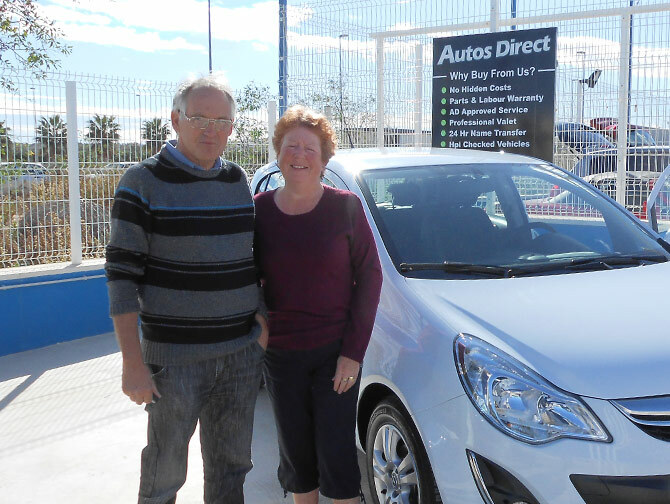 We were recommended to come along to see Autosdirect when purchasing our first car in Spain. From start to finish we have been over the moon with the service. 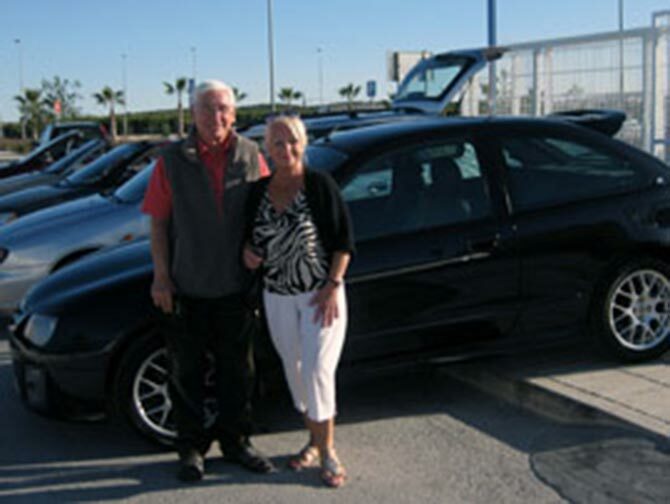 They were extremely helpful and very knowledgeable regarding driving and owning a car in Spain. First class, speedy service, and we hope the start of a long term relationship with AutosDirect! Thanks! 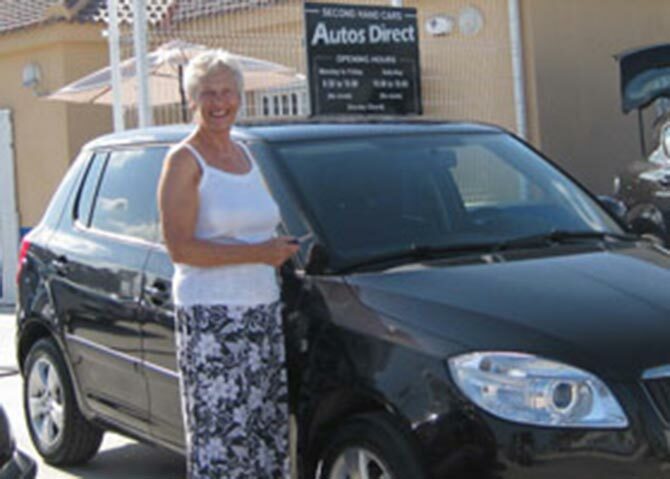 Really impressed that buying our car from AutosDirect was such a straight forward and pleasurable experience. 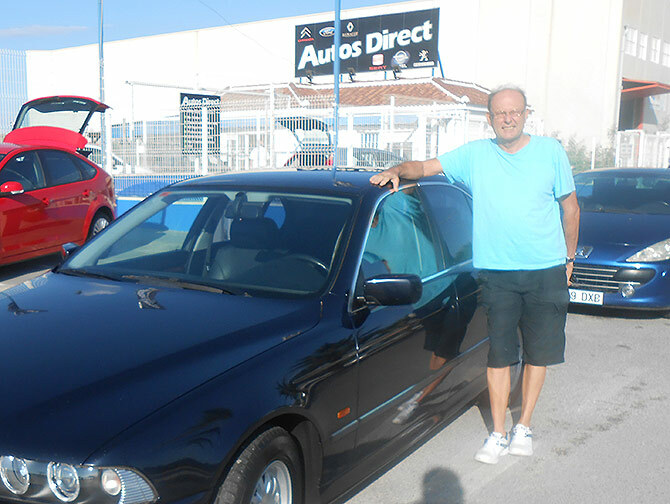 Very many thanks to Autosdirect for explaining everything clearly and for his friendly help. 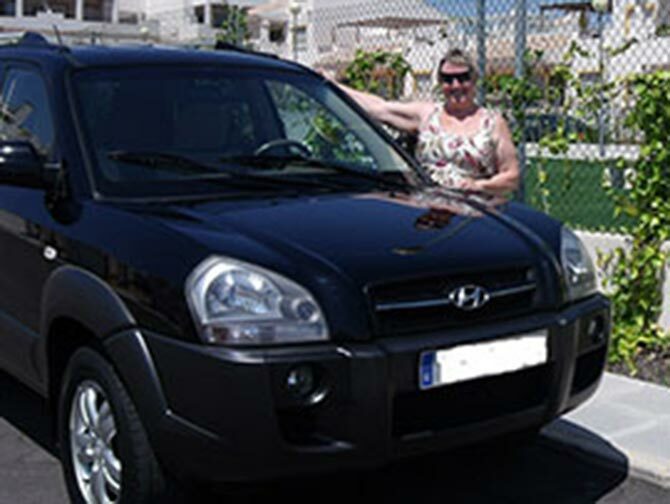 We were recommended to AutosDirect by friends, and we have not been disappointed with the excellent service that we received. 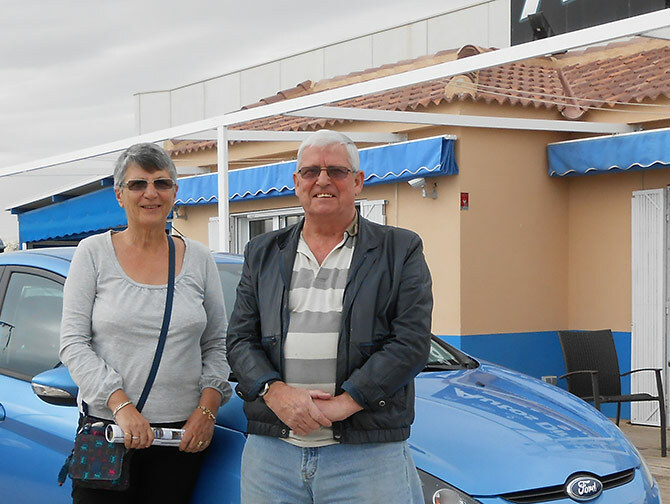 They have been most helpful, they talked us through the whole process and completed all the paperwork for us. We would recommend AutosDirect to anyone who is looking for a good car. It has been a pleasure to do business with AutosDirect. I am very happy with the condition of the car and feel I have had a good bargain. 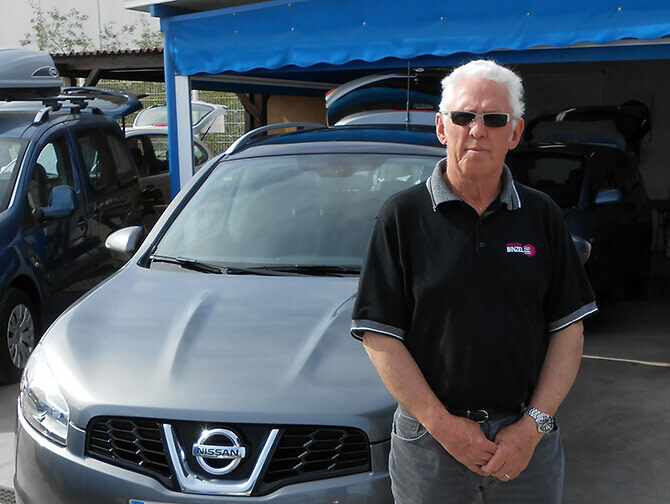 Alan Ball has been very pleasant to do business with..
Having looked at a number of cars in my price range at different garages, I have found the standard of the vehicles and the service to be extremely good. 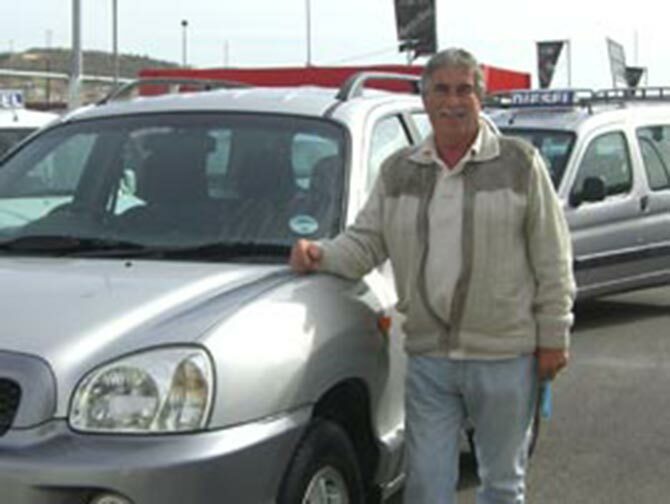 The vehicle was very well presented and the handover was very comprehensive. I would recommend AutosDirect! 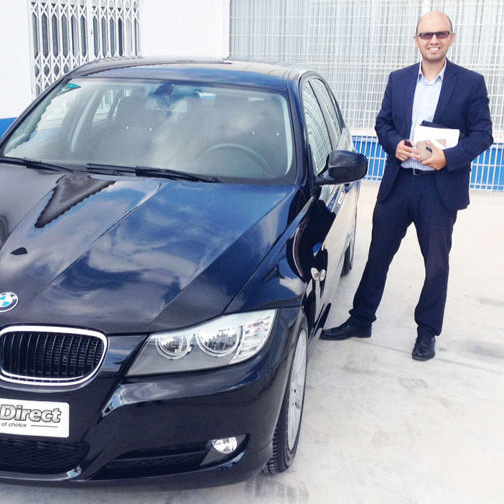 First time buying a car in Spain and it couldn´t have been easier. Alan led us through and explained everything very clearly. We are both very happy with the experience and the car. 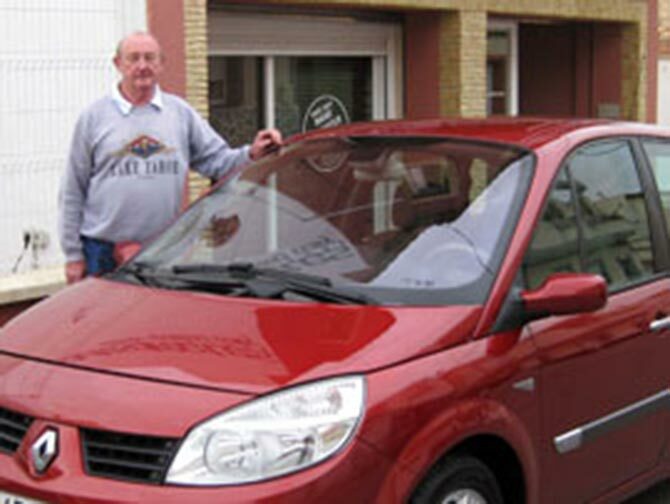 We have already recommended AutosDirect to our friends. I was amazed to find such a low mileage car at AutosDirect. It came with the full twelve months warranty. They explained everything to me and was very helpful. I have been very impressed with AutosDirect. Good service and professionalism throughout. I would recommend AutosDirect to anyone looking for a used car. Very pleased with the company in general. Great service, would definitely recommend. 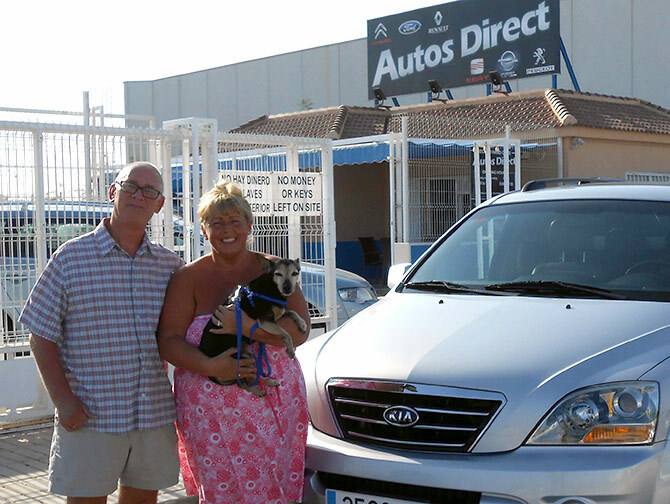 Kevin & Pete at Autosdirect were extremely polite & helpful when we exchanged our car with them. We will return when we need to replace the car. Having had such a good service first time around we had no hesitation in giving AutosDirect our business for a second time. Paul and Kevin really do go the extra mile to keep their customers happy, and we found they have continued with the very high standards they originally set themselves. When we had a problem with our insurance company they sorted it out there and then. Nothing seems to be too much trouble for them, and with such a hassle free purchase my blood pressure stayed low. Telefonica take note!! 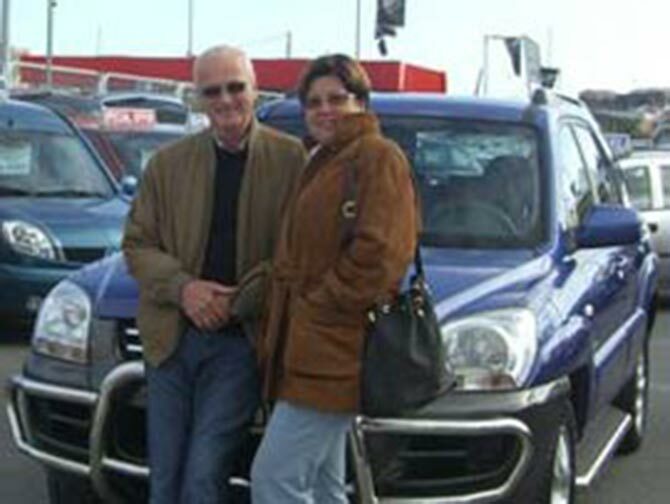 I was very happy with the friendly customer service of AutosDirect when we were looking to purchase a second hand car. 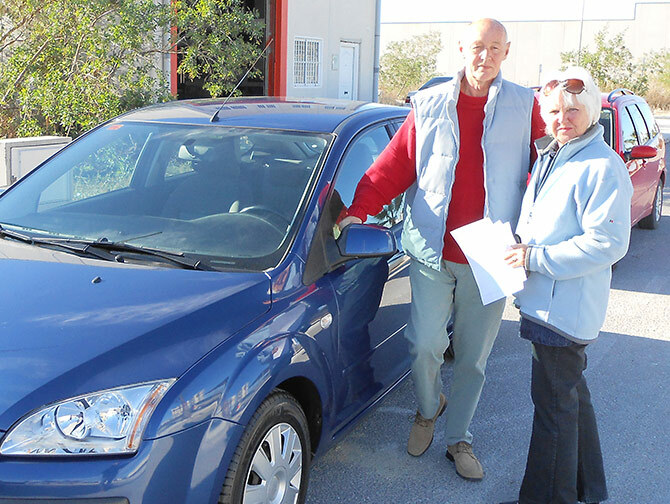 The Ford Fusion was selected after test drive and fully met our requirements. Most impressive of all has been the way the necessary documentation has been provided, with advice offered, and direct assistance as part of the service. When buying for the first time in Spain, it's nice to know that all the hassle of making sure documentation is in order is taken care of for you - If you are looking for a complete service, look no further! 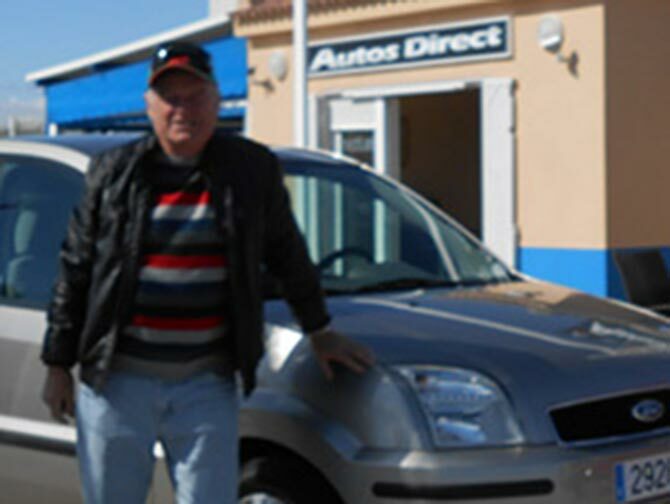 AutosDirect were recommended by a close friend. This recommendation was followed up by excellent customer service! I wanted an unusual part-ex deal for a car to go back to the UK. 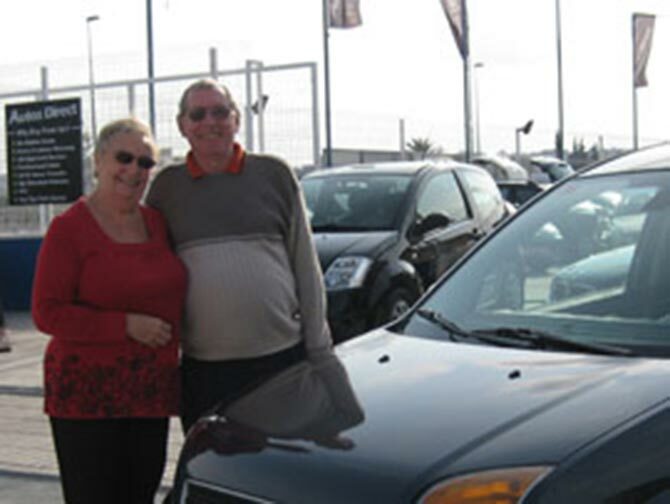 Within ten days they came up with the right car, and we were delighted! Thank you! The service we have received from AutosDirect, has been first class. We have received everything through the sale that has been promise and more. 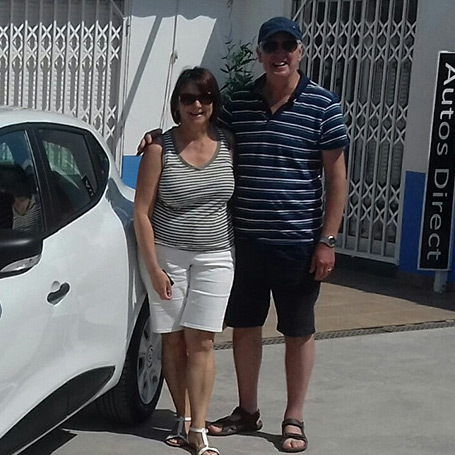 We were recommended to AutosDirect by our friends, We were dealt with by Kevin, We had an excellent service in helping to buy our first Vehicle in Spain. Would recommend them highly to others. I've never bought anything from the internet before, so the thought of buying a car was terrified me! The staff at the San Miguel office were very thoughtful and extremely efficient. They explained every step of the way, and the whole process was pain free!! I would certainly recommend AutosDirect to anyone looking for a good deal and friendly service. Well done everyone!! 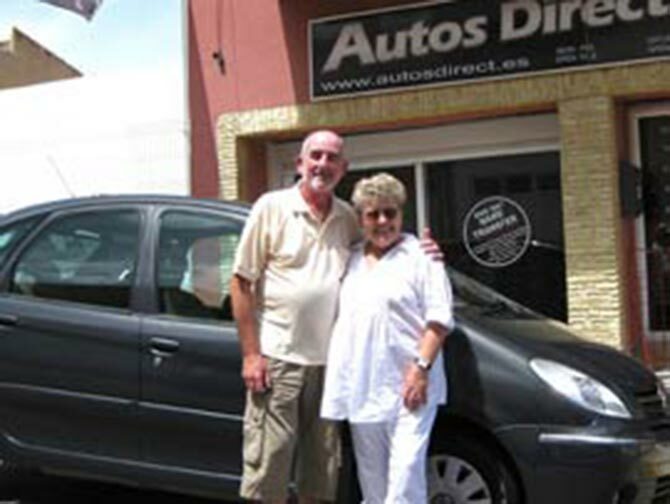 AutosDirect at Rojales are nice people to do business with. 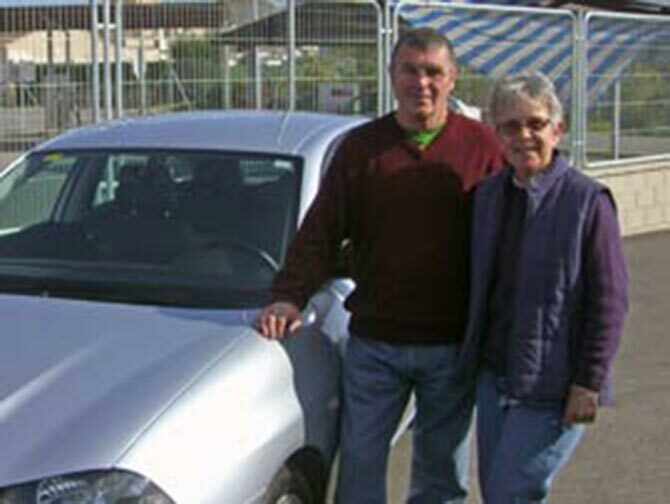 The car was received in excellent condition and on time. Nothing was too much trouble. Many thanks to AutosDirect for all the help in buying out new car. Everything went very smoothly. We would recommend AutosDirect! We were very impressed with AutosDirect! 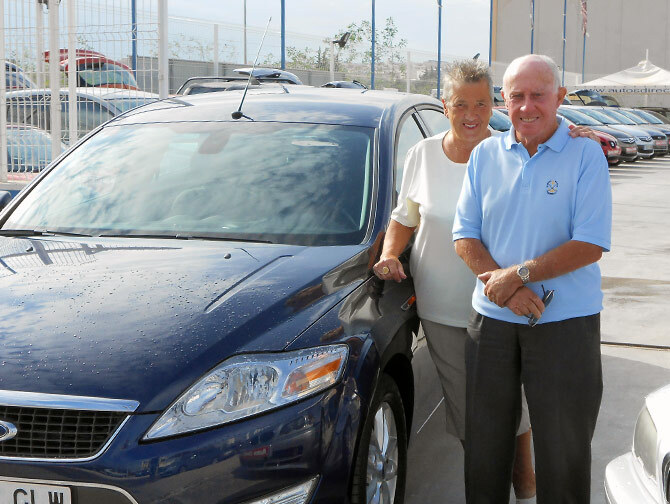 We were taken from San Miguel to their branch in Formentera to view their full selection of cars. Kevin was there to offer advice, but we were not pressured at all. 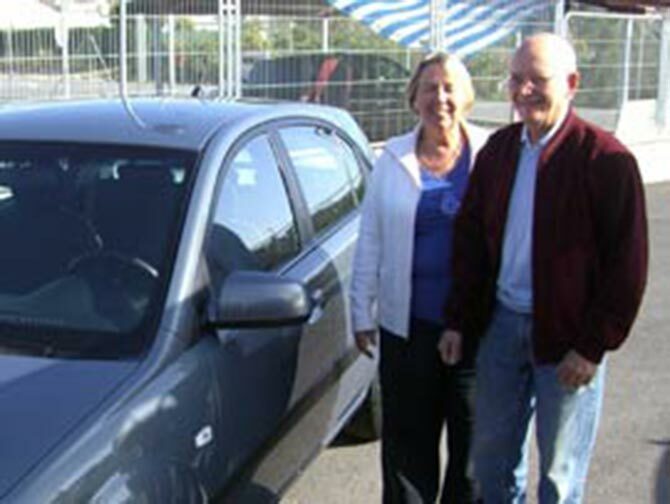 The car we chose was delivered on time and the documentation was taken care of straight away. 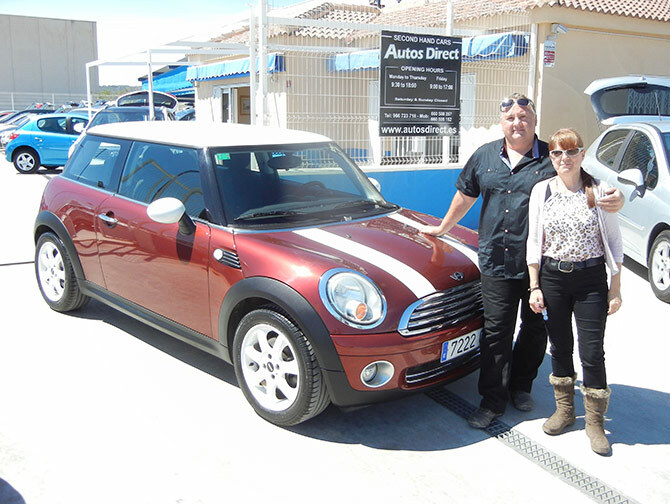 We highly recommend AutosDirect to other brits who are unsure of the pro's and con's of buying here in Spain. 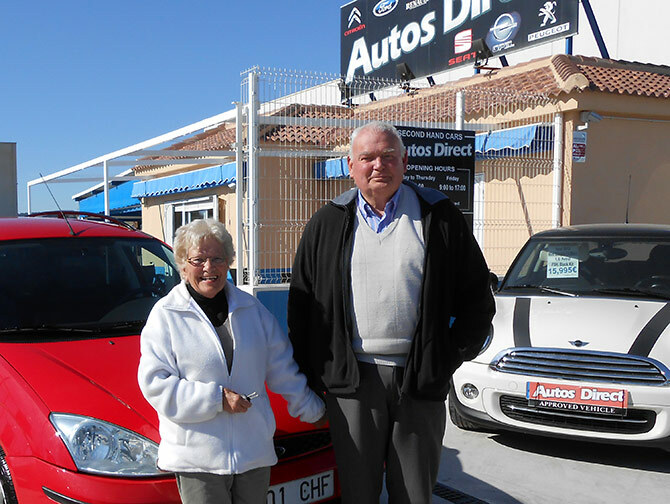 After much researching used car sales in Spain, I decided to go to AutosDirect in Rojales. I have been very impressed with the service from start to finish! I made a quick enquiry to Autosdirect from there website, within a few days I had a response with the perfect car I had been looking for! 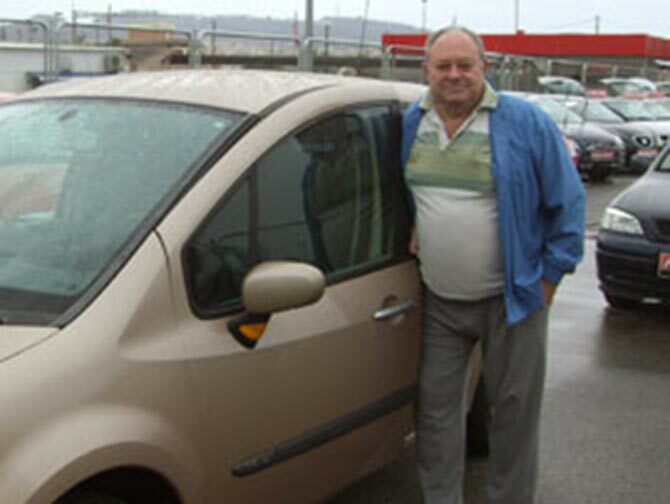 The vehicle was described to me over the phone by Kevin, and upon arrival I was very impressed and relieved to see it was exactly as put to me by telephone conversation. I had to travel some distance, so this type of business is exactly what I would expect however as we all know, is few and far between in Spain. AutosDirect made all the process easy for me and by my second trip all the paperwork, service and valet was complete. I would recommend them to future purchasers in Spain. Dealing with AutosDirect was a pleasant experience. They are polite and very helpful and went out of their way to get all things done way above our expectations! They are very helpful and we wouldn't hesitate to recommend AutosDirect to or friends. 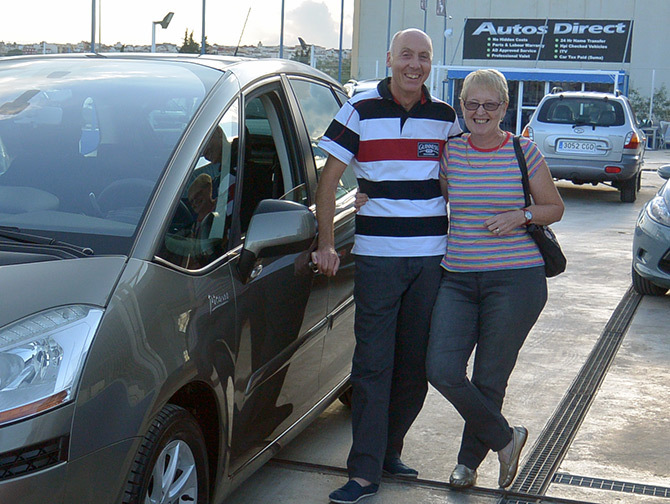 After seven years we decided to change our car and we were recommended to AutosDirect. 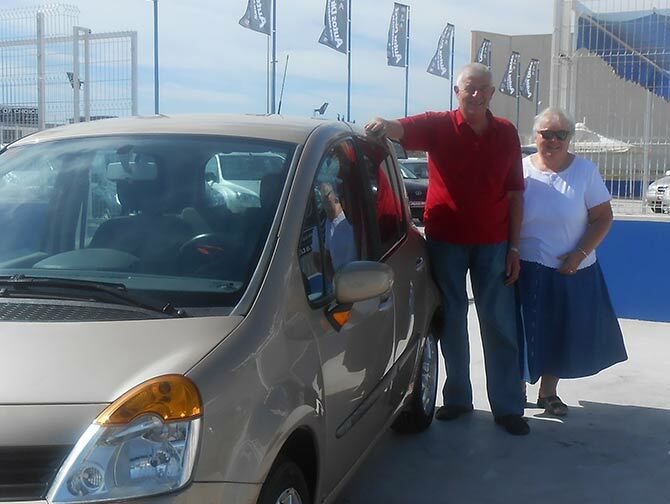 We found them to be very helpful and they found us the perfect car! I can't speak highly enough of the service we received and would not hesitate to recommend them to my friends. 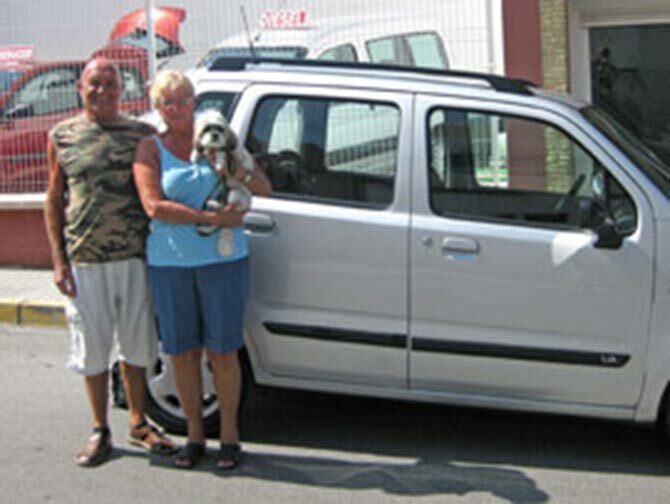 We found AutosDirect not only courteous but very helpful in purchasing a spotless second hand car. The car was fully serviced and all the presales checks were completed to the highest standard including arranging the change of ownership. Throughout the transaction we were kept updated and fully informed. We have no hesitation in recommending Autosdirect. We are looking forward to hours of happy motoring in Spain. Thanks to AutosDirect. After giving them details of the make of car I was looking for, it was only a matter of weeks before they contacted me to say they had found one. Thanks again. The service I received from AutosDirect was very good. They were so helpful, and I was very happy with their service. 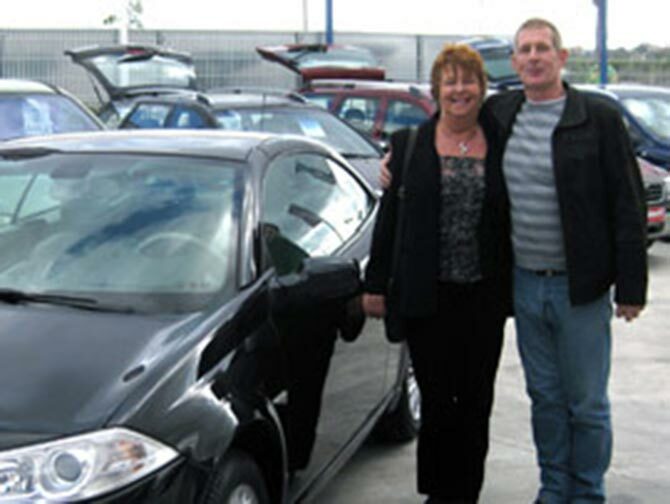 We purchased our first car from AutosDirect & were very impressed with the quality of service we received. 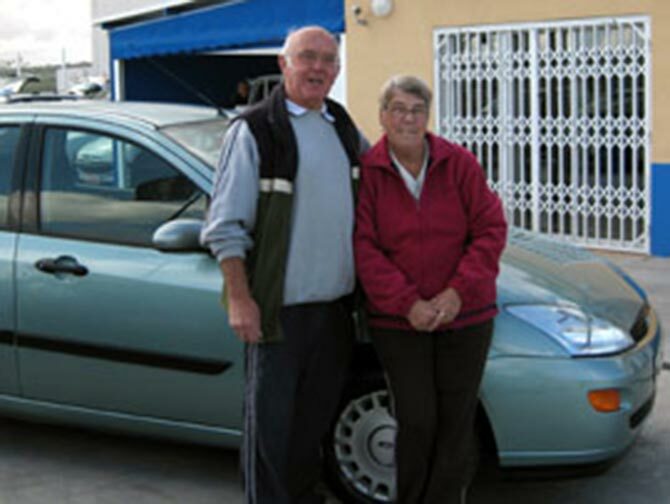 We gave them a budget & asked him to look for a Ford Fiesta for us as our second car, within a few weeks they had come up trumps & bang on budget. 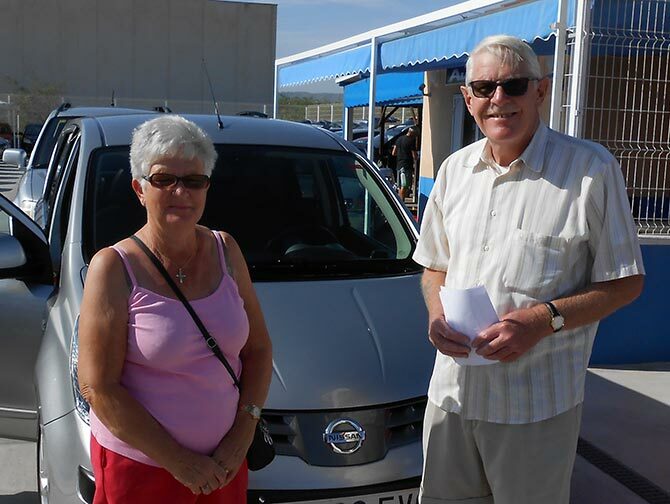 Thank you Autosdirect & your excellent team, the cars were presented lovely & we would not hesitate to recommend you to anyone wishing to purchase a vehicle. 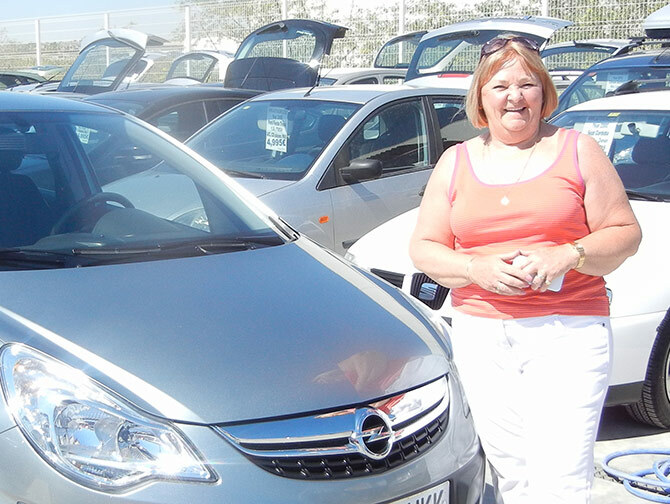 After visiting lots of car dealers I came across AutosDirect - what a difference! They made me feel like a valued customer and a friend. They dealt with all the paperwork and insurance and nothing was too much trouble. They even picked me up from the airport to collect the car! Thanks again. Great service from AutosDirect, who made the whole process so easy. The car was immaculate and well prepared. The paperwork was all in order and transfer of ownership taken care of without any fuss. Thanks again to all the team! 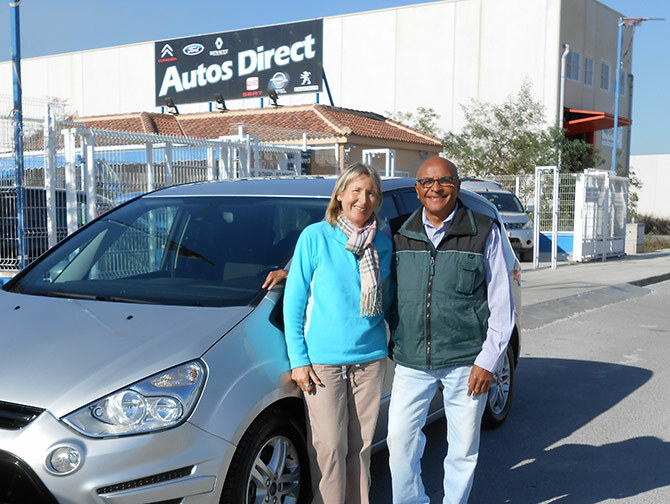 We would like to thank AutosDirect for making the purchase of our car so smooth and easy. 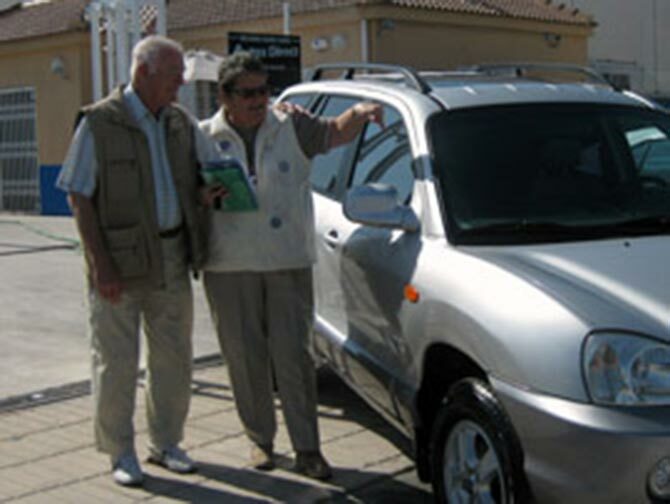 The information you gave us about the rules and regulations of driving in Spain was so helpful to us as we'd not purchased a car abroad before. We'd have no hesitation in recommending you and your company to anyone. Thanks again! 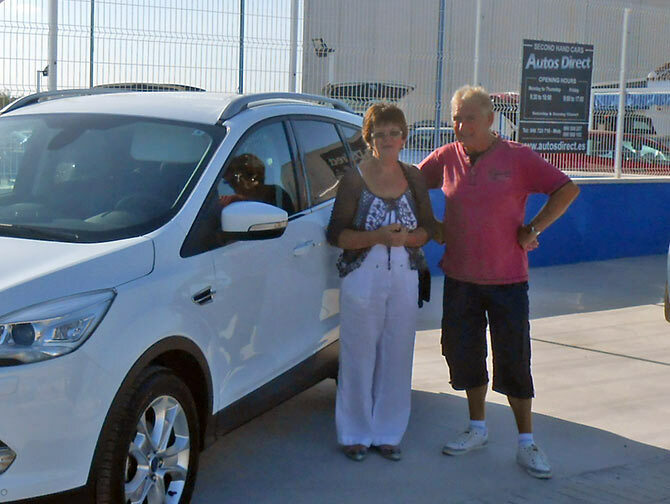 Thank you Kevin, Paul and team for making the buying of our car so simple and straightforward. 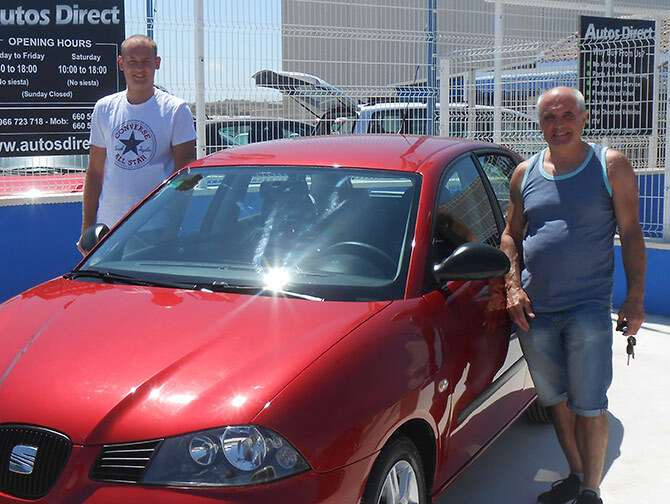 After a year of reliable motoring we still have pleasure in driving the Seat Ibiza, and we have no reservations in recommending your company to our friends and neighbours and no doubt our next purchase will be with Autosdirect. I knew exactly what I was looking for, and after many visits to dealers, I came across AutosDirect on the Internet. I left a message and the very next day they called. Once I saw the 206cc...that was it! Sold! They've done a grand job from start to finish, and I would highly recommend AutosDirect to others. Excellent service from start to finish. We contacted Autosdirect via their website and had an immediate response. 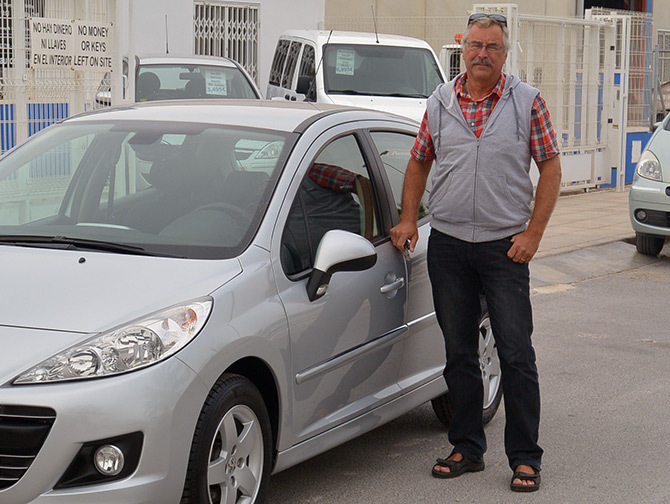 Within 1 day we had found the perfect car matching our requirements. 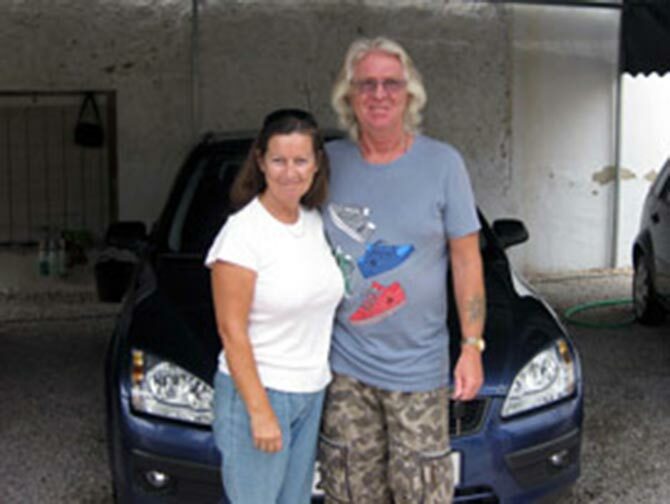 Although we were purchasing the car from the UK, and on trust, the process was made extremely simple and we were kept informed of progress at all stages. 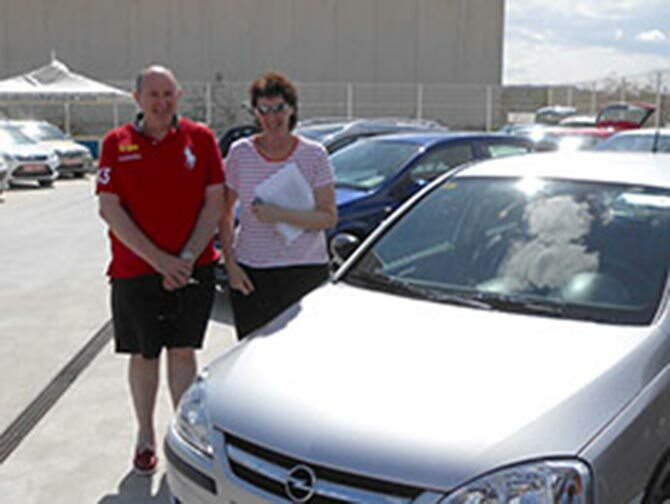 When we arrived in Spain to collect the car we were delighted to see that it matched the photos and description provided. In short we were not disappointed. They offered us lots of advice and even arranged the insurance for us. We would definitely recommend Autosdirect and would have no hesitation in using them again. I am very pleased with the purchase and the service given from test drive to buying the car. I would recommend to anyone thinking of buying a car from Autos Direct to do so with confidence. 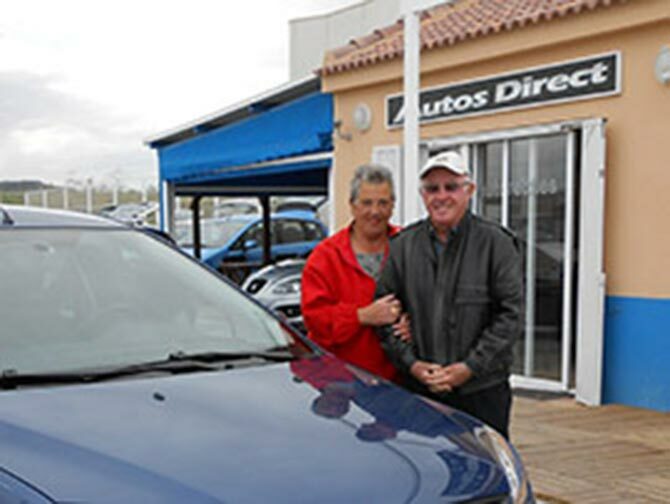 I have exchanged my car with Autos Direct at San Miguel de Salinas. The service was friendly, easy and hassle free. I am happy to recommend them to anyone. 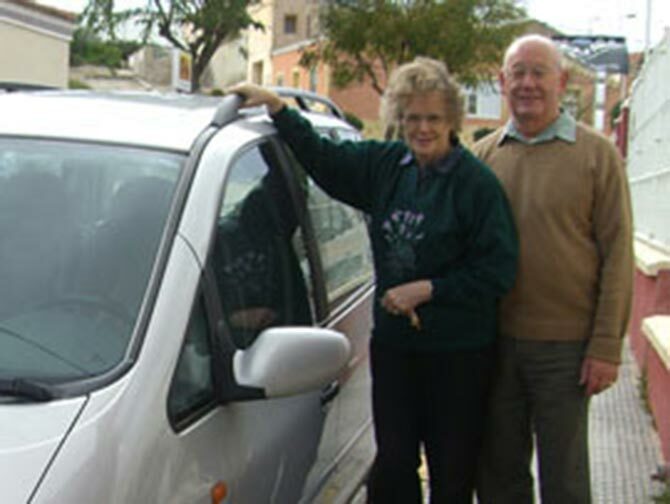 Mum & Dad took our car to Autos Direct for annual service and ITV, we were dropped off in the town, and picked up. The service was excellent. I even got a free t-shirt, the only problem is now my 199 brothers and sisters want one also. Many thanks to Gary and Adam! This was the most pleasurable car buying experience I've had! Helpful staff, no pressure and the paperwork sorted for when I collected the car. I can recommend this firm! 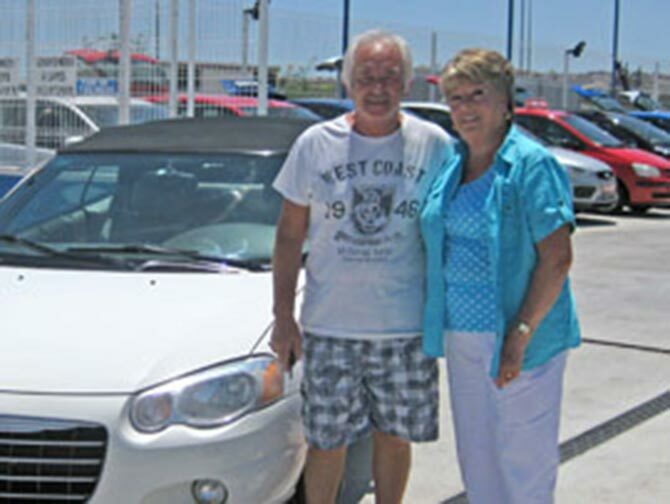 After looking for a used car for a month we were told about Autosdirect where we purchased a car, we were `pleased with the part exchange price. They fully serviced and valeted the car, a nice touch was they added a new set of triangles and H/U jackets. Paperwork was done in 24 hours, also the staff were very helpful. I would recommend them to anyone. Extremely happy with my new car and would say what a good service is given by the AutosDirect Team. Thank you all very much for a well presented car and I would not hesitate to recommend your company to any potential buyers. A hassle free procedure from start to finish! 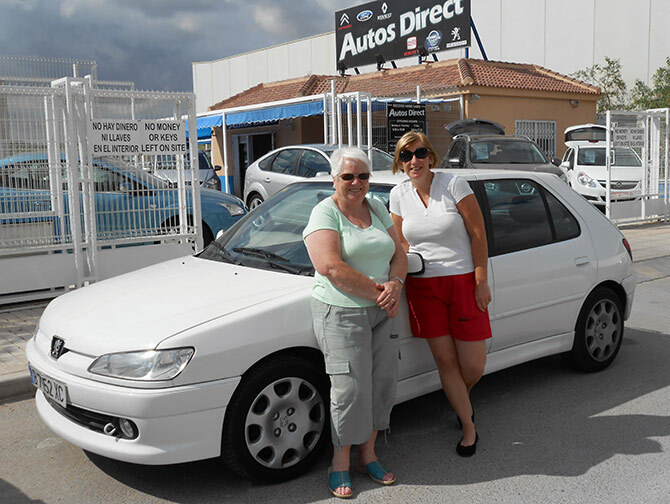 Saw the car on Wednesday and drove away with it on Friday - all paperwork and transfers done by AutosDirect! I even got a very good exchange price on my own car. 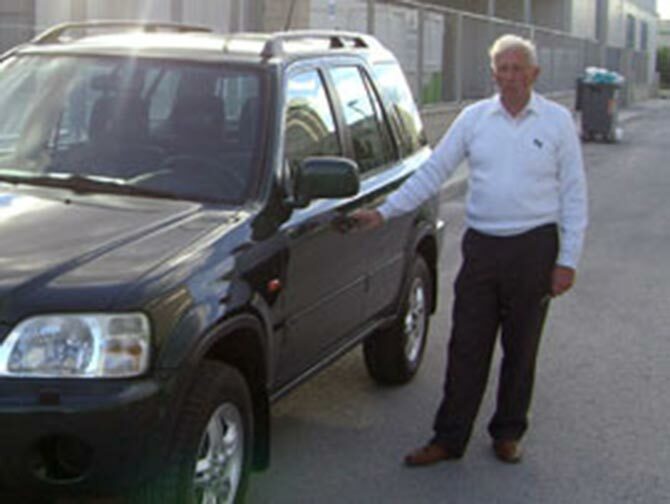 the staff provide a very good service and all the cars are fairly priced and well presented. 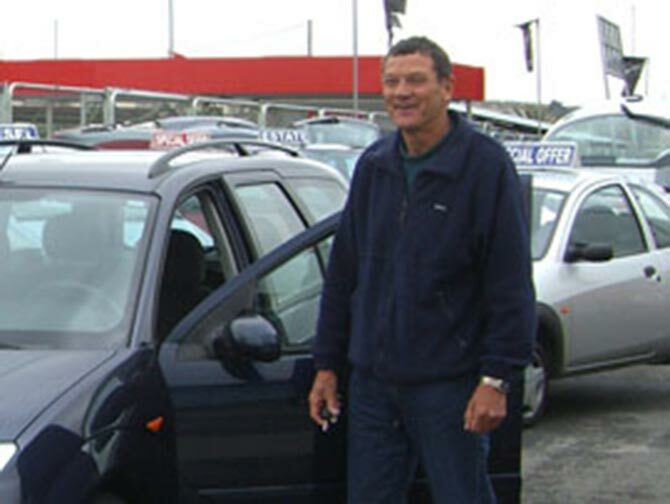 I would recommend AutosDirect to anyone looking to purchase a second hand car. Made the car purchase experience very easy, able to test cars and select the right one. Part exchange and paperwork carried out hassle free!! Excellent and friendly service, thank you. It is 6 years since I bought my first car from Autosdirect and this is now my 3rd. The service has remained the same in all that time, first class!!!. 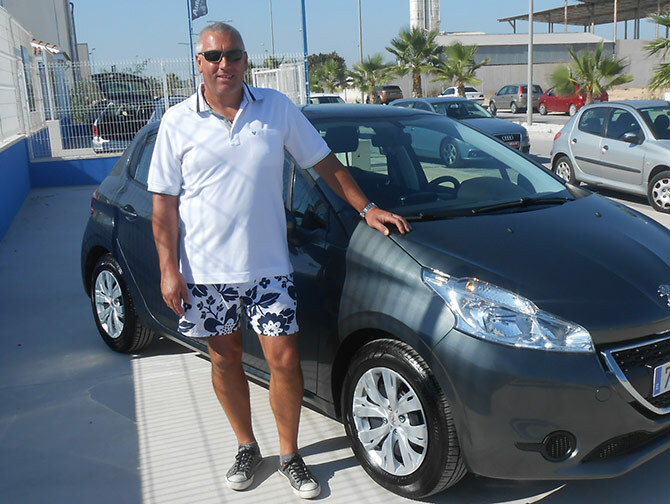 I have looked at other car dealers but they don´t match up either in price or quality. I will be back here again next time. We are loving the New Car, there was no sales pressure and the transfer of the paperwork was done quickly. Would definitely recommend. Amazing service. Purchased two cars at the same time which can't be bad. Pleased with part exchange price...perfect. Traded in my Spanish car to buy this perfect "heading home" car. Totally legal with tax and MOT. It's a shame we had to go home, but we've done many deals with the guys at AutosDirect...take care! I would like to thoroughly recommend Autos Direct. They have been professional and most helpful and I am very pleased with the vehicle. 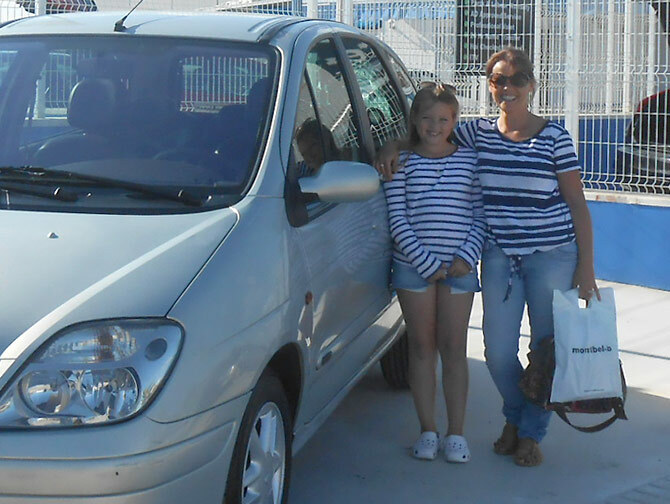 We have received excellent service in purchasing our first car in Spain. Will recommend Autosdirect and would be willing to upgrade with Autosdirect in the future. 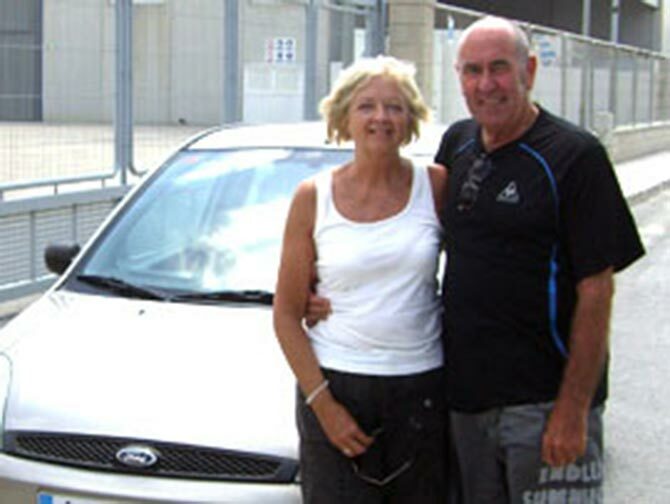 We are very satisfied with our Ford Fusion hassle free from the onset. We were treated in a warm, friendly and professional ,manner. We will definitely recommend AutosDirect. 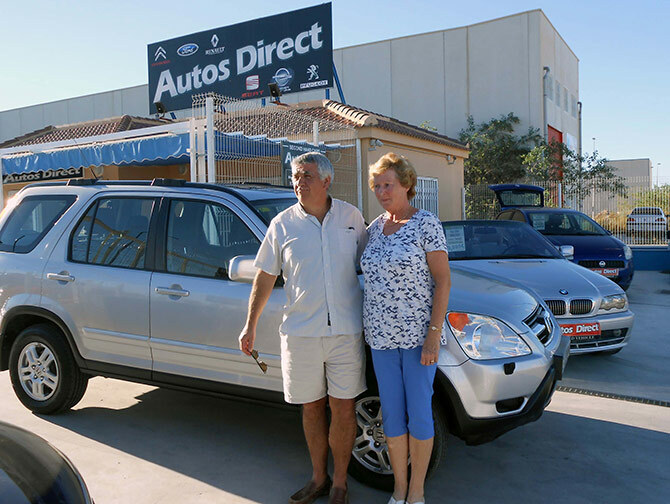 To all at Autos Direct We were very pleased with the service you gave us, and would recommend you to any one looking for a car in Spain. The service we received from you was very good. As you completed all the paperwork for us so we did not have to worry About that side of things. Very pleased with the car. I highly recommend AutosDirect. Finally nice to have air-conditioning and power steering! I am really pleased with the service I received in purchasing this car. The staff were really friendly and very professional. They made the task very simple and hassle free. When I returned to pick up the Vehicle everything was ready including the transfer of ownership. I would recommend AutosDirect to anyone!!. We browsed around the cars, had a test drive of any we thought of purchasing, then when we settled on the one to buy the process began. No pressure on selling/buying. The car was prepared to the highest quality, and all paperwork completed. ALL STAFF were like friends and very helpful. 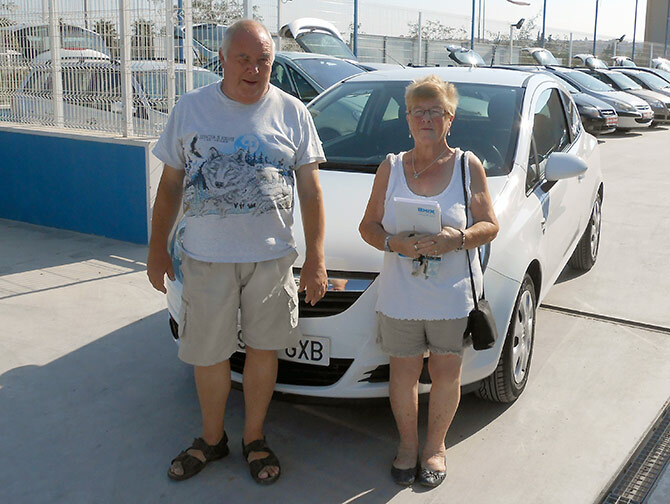 Paul and Kevin were extremely helpful in all aspects and has made our car purchase the easiest ever. All I can say is “top company”, I've done business with them twice now, and would recommend them to anyone. ( in fact, I already have) and would not hesitate to use them again. Thanks to the guys. Good people to deal with, very comfortable throughout the experience, would defo buy again!! I am thrilled with my new car. I came to look at a car that had been sold so Kevin looked for a similar one for me. Everything was completed in double quick time and with such professionalism. A gem of a Company so pleased I have found it. Being Paul's father-in-law I'd expect a good deal :) Saying that this is the sixth car I've bought from the guys and the service truly is outstanding. The service was exceptional and the staff were so helpful and friendly. Even the guy who was cleaning an polishing the cars was friendly. They informed me on the day of collection that the vehicle was all serviced and clean and I have to was in immaculate condition. If and when I need to renew my car I will definitely go back! 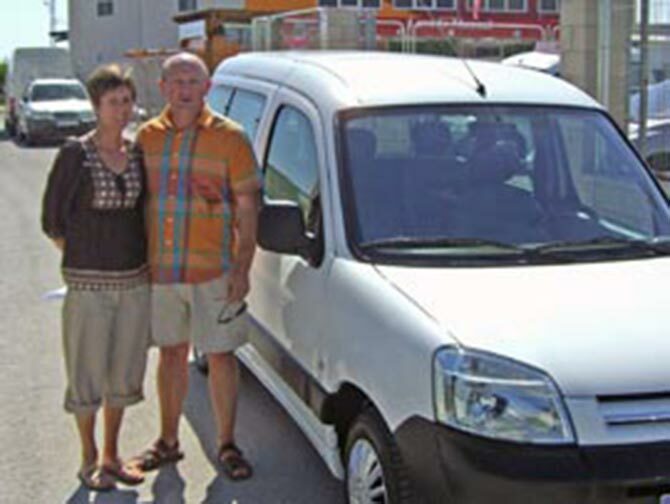 We have bought two cars since the start of the year, with complete peace of mind and nothing to fear, they say what they mean and mean what they say, complete satisfaction is the order of the day. Autosdirect are the best by far, so ring Kevin or Paul if you need a new car. The service they give is simply the best, go to Autosdirect and forget the rest. I chose Autosdirect due to their reputation, and wide selection of quality used cars. 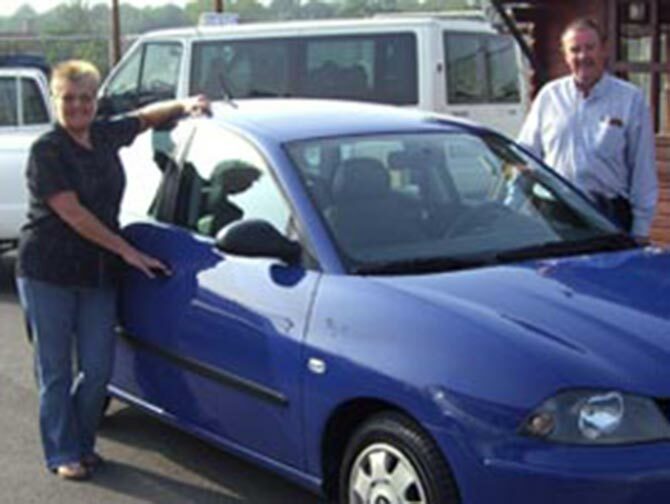 After selecting two and test driving them, I chose the Blue Altea due to its Low Kms, and one previous owner with full service history. I thought the car was a fair price and the trade in of my old car was all I needed to make my decision. The car was serviced and available for me to collect the very next day. 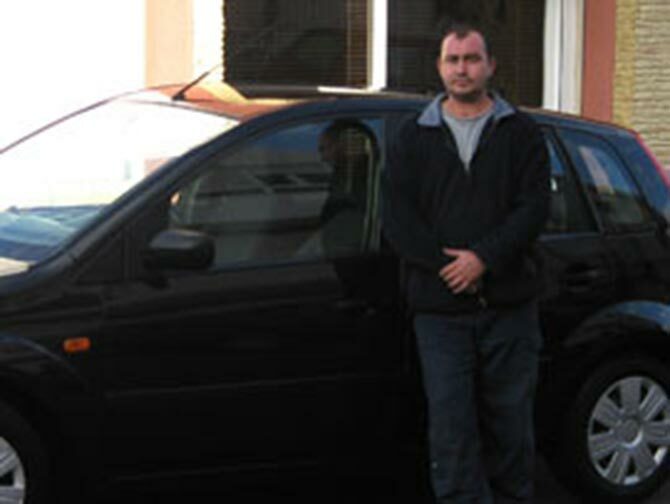 All the transfers were completed in a very professional and speedy manner. All in all a very pleasant experience. This company operates seriously and efficiently. Including suggestions fir car insurance at competitive conditions and tariffs. Cars are properly checked before delivery. Aftersales service is valuable. I give this company my very best recommendation. 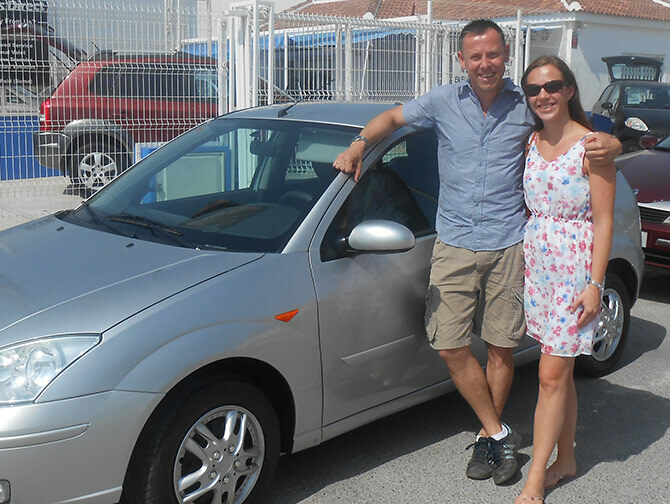 We came to live in Spain last year and the thought of trying to buy a reliable car was a bit daunting to say the least. 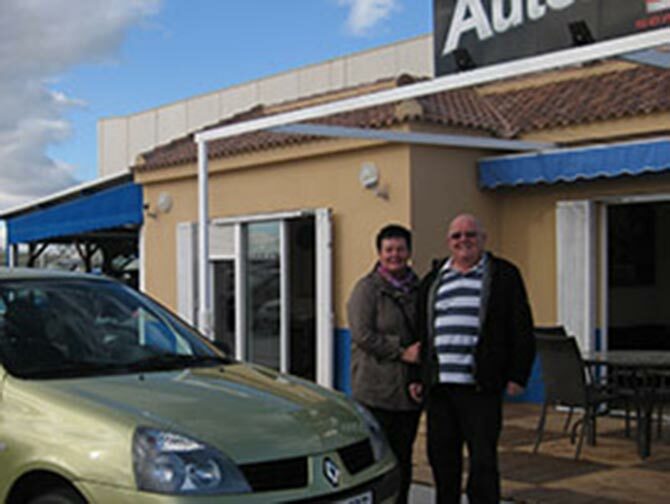 Our friends took us to AutosDirect in San Miguel where we bought our car. Low mileage, lots of extras, one owner and good price. Everything was done for us efficiently and happily. Couldn't have asked for more, which means when we need another car - guess where we'll be going back to? Couldn't recommend them enough! 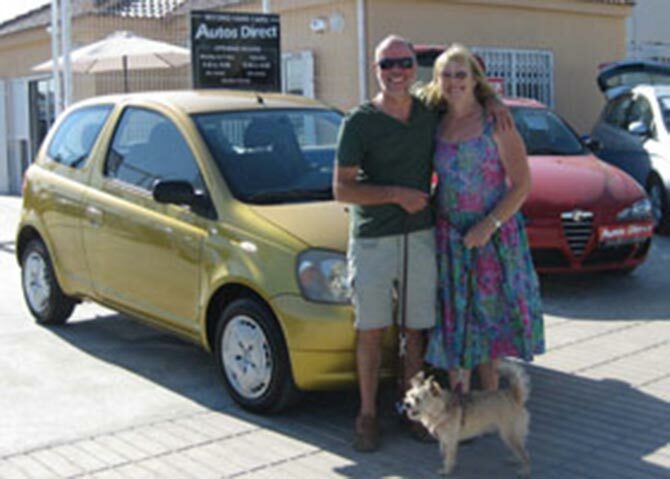 Kevin, Paul & Staff, I have lived in Spain for many years and I have been in the motor trade most of my life, a few years ago one of my customers asked me to look over a car they were purchasing through AutosDirect and this is when I first met the team, after looking over the car I noticed a few things to be done. When the car was ready to picked up I thought to myself I wonder if they had done what was asked and to my surprise they had done it all and more. Over the years my confidence has built up and I have been involved with 8 purchases with Kevin & Paul, 3 of which are my own family. I have now retired so I thought time to buy a car for myself and the better half and I were not disappointed and as expected were treated with respect and complete honesty. They do all the valeting, servicing and paperwork without any fuss, and also their Aftersales is second to none. I would recommend them to anyone that asked me where I can buy a car without being ripped off, all the staff including the Mechanic are a great bunch. Being ex motor trade myself, I can only praise the service we received from Autosdirect. 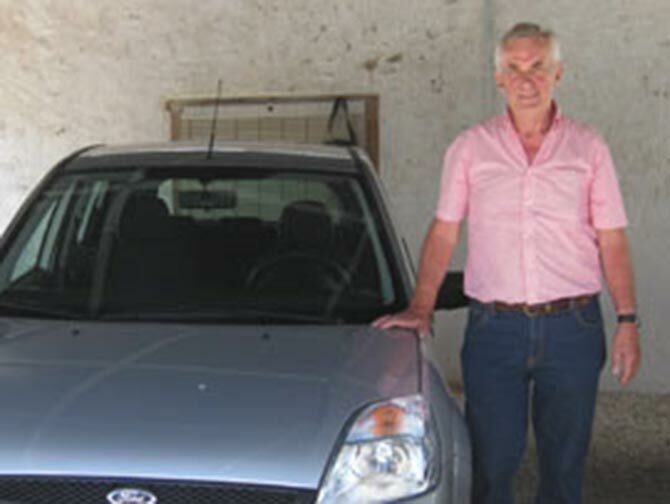 Having just arrived in Spain and unfamiliar with the district, Paul (Director) took the car I was interested in to my house, appraised my PX car (very fairly) and carried out all the Spanish procedures, ending in delivering my new car to my home. All done and dusted in 3 days! Excellent service and cordial people throughout. 10 out of 10. 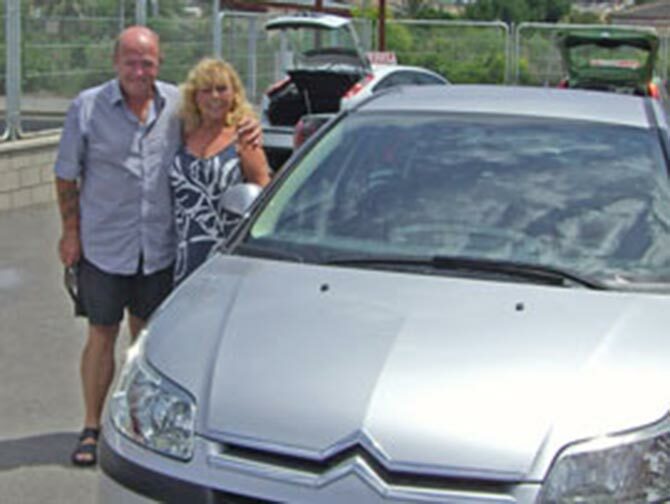 I am a returning customer to Autos Direct at San Miguel, I purchased a Citroen C3 4 years ago and was so thrilled with the service that I had received the first time ,that 2 weeks ago I returned and purchased another newer C3 and today I have taken ownership. I can not express enough how Kevin and Paul go out of their way to help you every step of the way and being on my own it gave me great personal confidence that I could actually buy a car on my own! 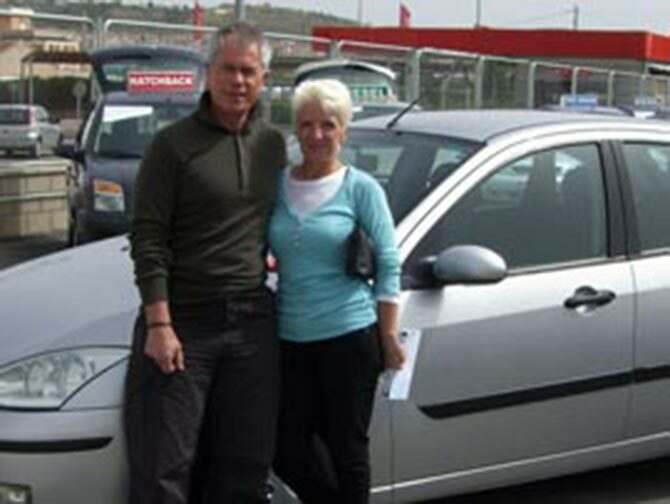 We bought a fiat Punto online. not an expensive car but even so the service we got was exceptional from start to finish. 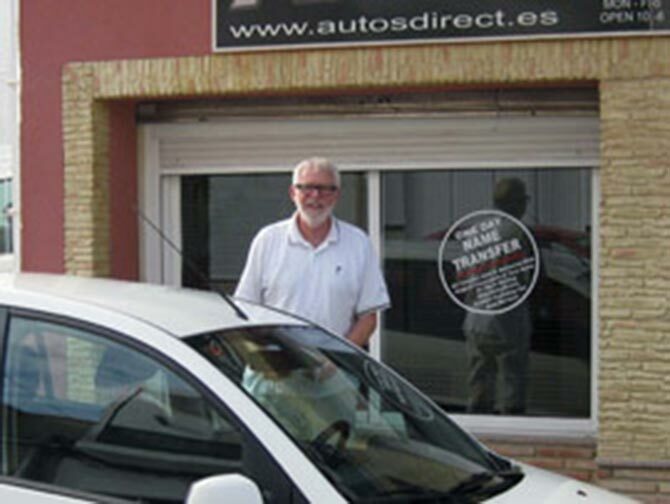 if you are going to buy a car in Spain the trip to Autosdirect even if you have to travel a distance to get there will be more than worth your effort. if all businesses were run like this Spain or UK would have no recession. take our advise give them a look. Dette er et selskap som arbeider serioest og effektivt. Ogsaa forslag på bilforsikring til konkurransedyktige betingelser og priser. Bilene blir fagmessig sjekket ved eget verksted foer levering. Aftersales-service er ogsaa verdifull. Jeg kan gi dette selskapet min aller beste anbefaling. 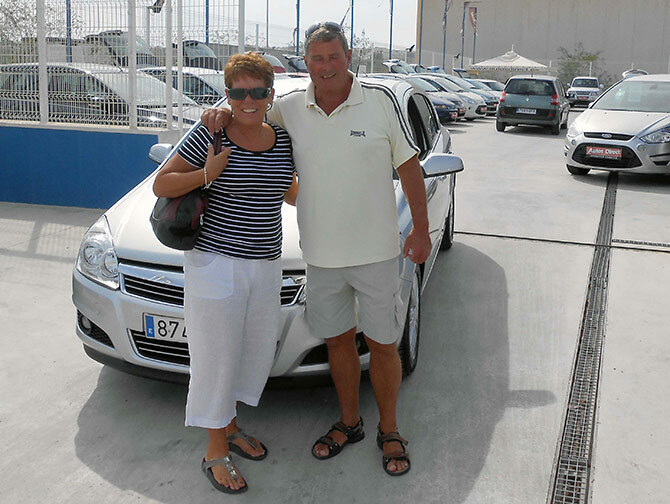 Many thanks for your help in purchasing our Astra. Two days in the country to see, buy and sort all the paperwork was effortless. Many thanks again. 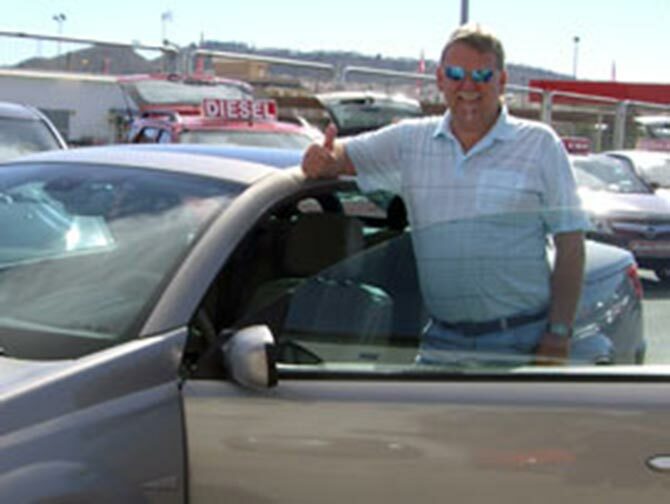 Dear Kevin, I am pleased to confirm that I am very happy with my purchase and appreciate the straight talking & dealing I experienced at AutosDirect. I will gladly recommend your Company. 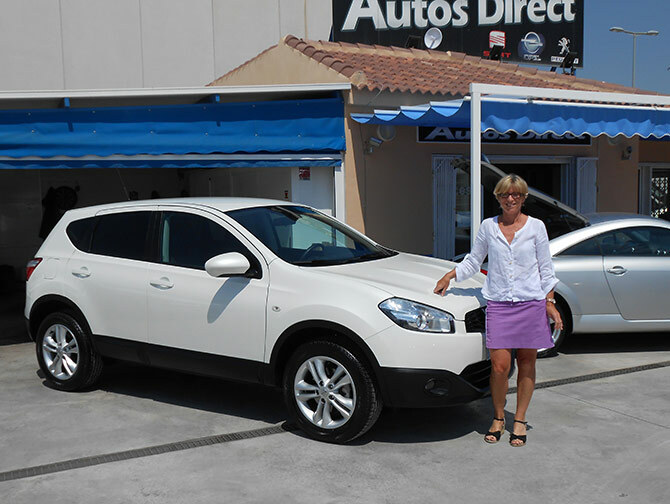 We would strongly recommend to anyone wanting to buy a car in Spain to view the wide range that AutosDirect have to offer. We saw the car on their superb website. 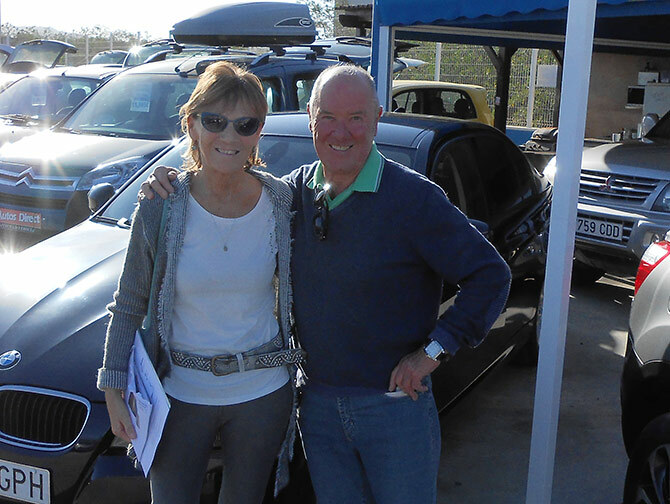 The welcome was friendly and informative, and at no time did we feel pressurised into making a purchase. 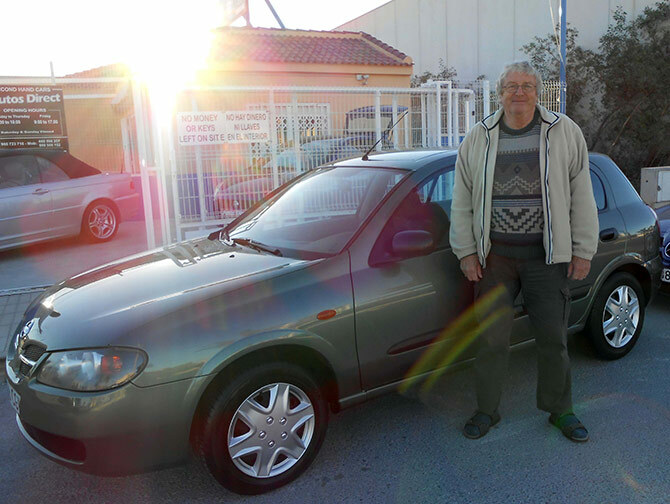 We are thoroughly happy with the new car, it's in excellent condition, and Paul made sure the whole paperwork process was straight forward, quick and painless! Thanks! From the moment we walked into AutosDirect, we were so impressed by the welcome we received from their rep, he was prepared to listen to what we required, we were shown cars available at the time, but nothing we really fancied. The rep showed no hard sell and he was prepared to look around for the vehicle we desired. After 2 weeks we received a phone call to say he had found a car that he thought would be suitable. 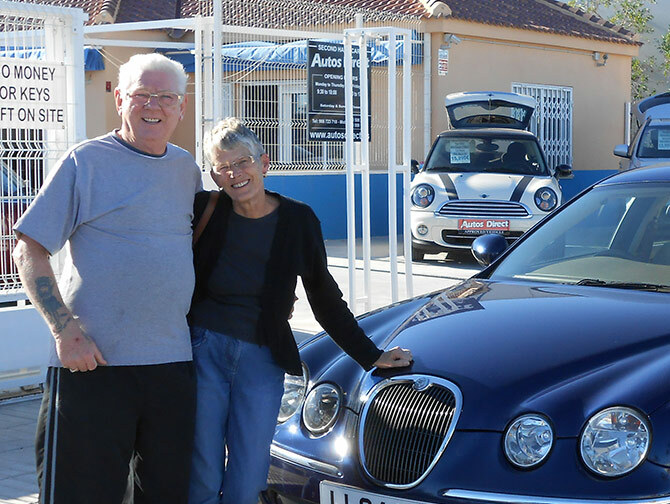 Needless to say we viewed the car and we were so happy we decided to buy then and there - The final details of the purchase were concluded in a professional way and we would have no problems recommending them. I recently purchased a car from AutosDirect, they made the process very simple and straight forward. 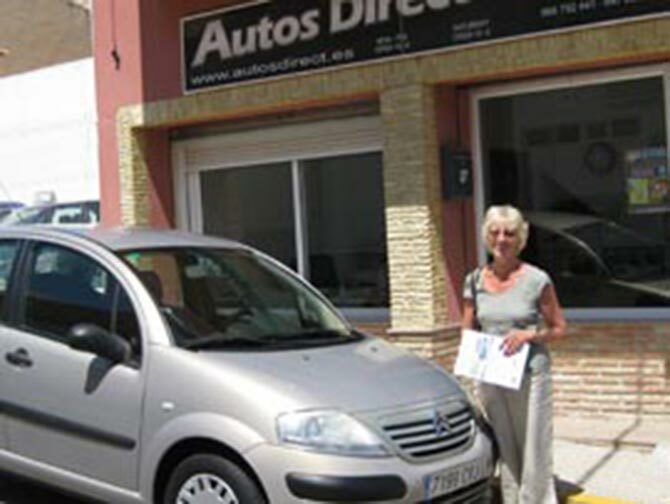 AutosDirect sorted out all the necessary paperwork including ITV & Insurance. We had a problem with our Cd unit within the first few weeks so we asked them could we have a replacement, without any hesitation the new unit was fitted without charge in an efficient way. I would strongly recommend that if you are thinking of buying a car buy from AutosDirect, the service is excellent! 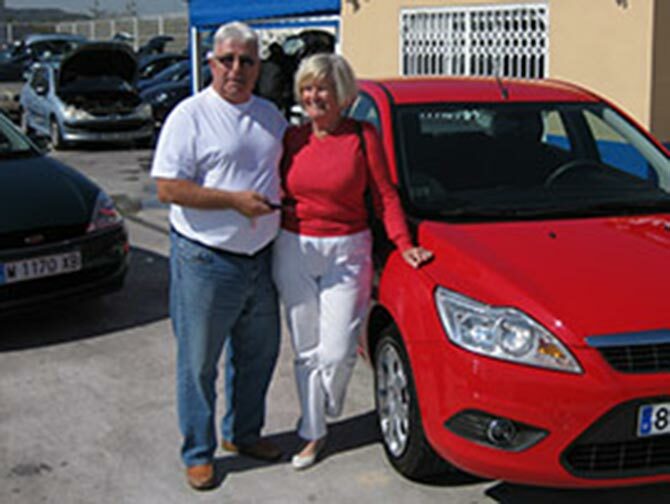 My wife and myself have recently purchased a ford fiesta and we have been treated with the utmost respect throughout the purchase by the staff at Autosdirect. 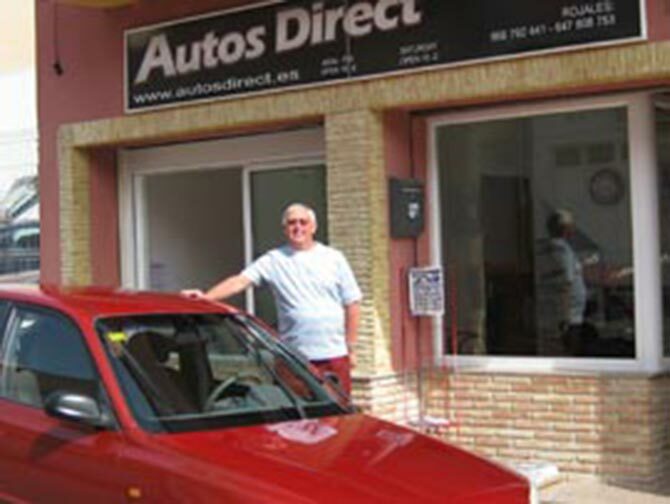 I can recommend anyone who wants to buy a car form Autosdirect that the service and staff are second to none in Spain. I saw AutosDirect start up a few years back on a small site, and saw them progress to other premises, and earmarked them for a visit when my next car was due. On that visit within half an hour, I had tested the car, and completed all the business. I can confirm all the positive complimentary comments. This is a business that is professional throughout, with a genuine, excellent team willing to help on any detail, thoroughly recommended. 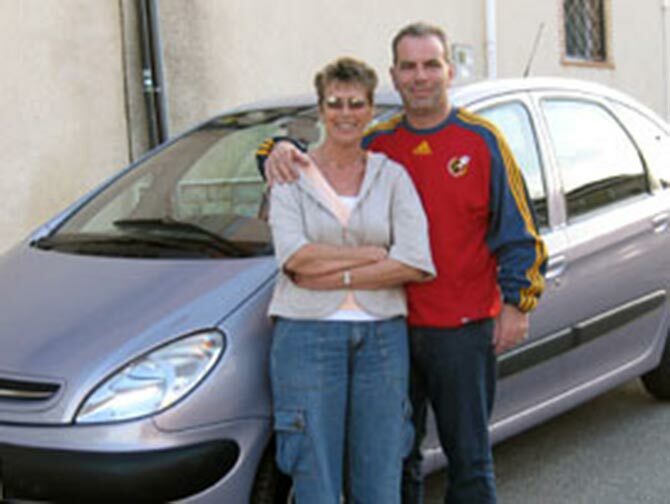 Friends had bought cars from AutosDirect before and so Auto Direct were our first choice. We were not disappointed. They were very polite, funny, with no pressure to buy and, we were left to look at the cars inside and out for as long as we liked. All/any questions were answered fully. All paperwork dealt with promptly and aftersales was exceptional. I felt at ease with the whole situation of buying a used car. I would recommend AutosDirect to everyone. So go on ...... Use Auto Direct to find your used car first ! Well, what can you say! Whatever you spend, you are guaranteed a quality and fully checked car. 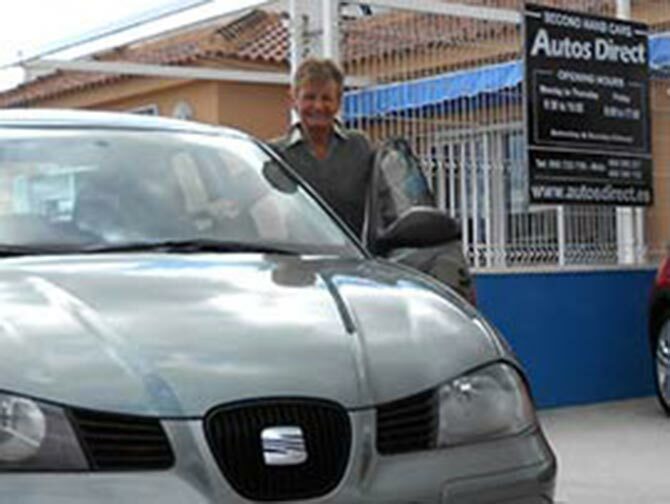 Attentive staff who fully go over all aspects of your car, paperwork done can´t ask for any more. 10/10 for this company, a place you can trust!! We would highly recommend Autos Direct to anyone who is looking for a vehicle. We searched extensively for a vehicle three years ago and found Autos Direct had what we were looking for. 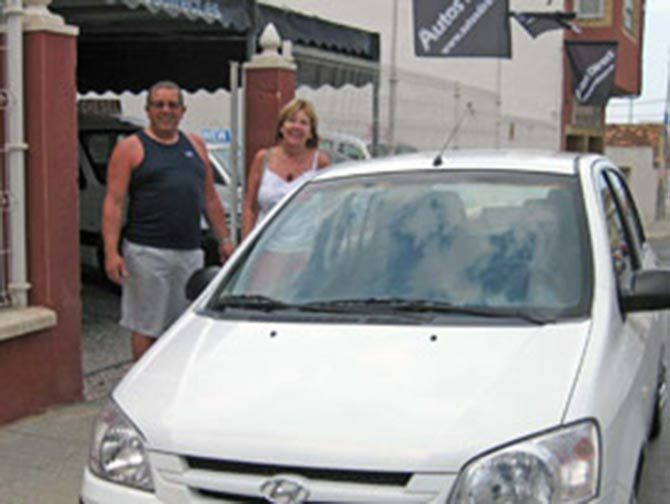 This was our first Spanish car and we were a bit unsure of what to do but Autos Direct took care of everything and we never looked back. 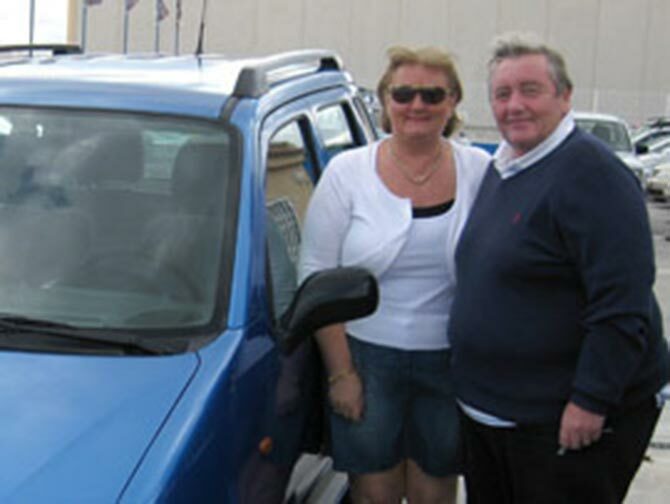 We decided to change the vehicle in 2013 and Autos Direct came up trumps again. We would not go anywhere else for a vehicle and have no doubt that when we are looking to change again we will go back to them. We cannot fault their customer service and they are always willing to help with any problem we might have. Buying a new car is always an anxious time, so we set out with trepidation to look for one. 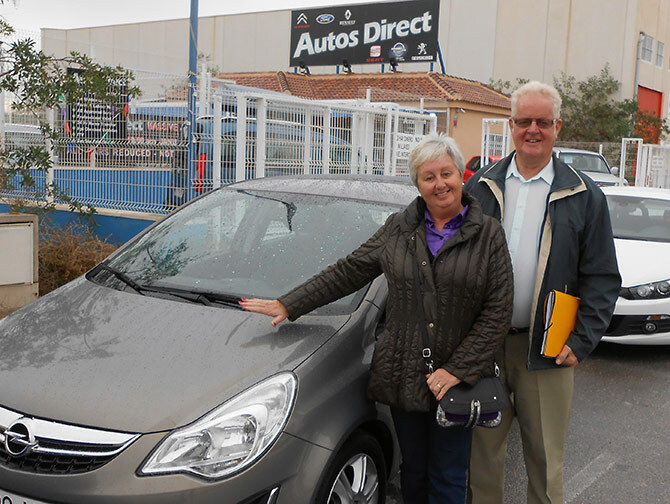 Our first port of call was Autos Direct, San Miquel. What a good choice this was, we met Kevin who showed us round and listened to what we wanted. 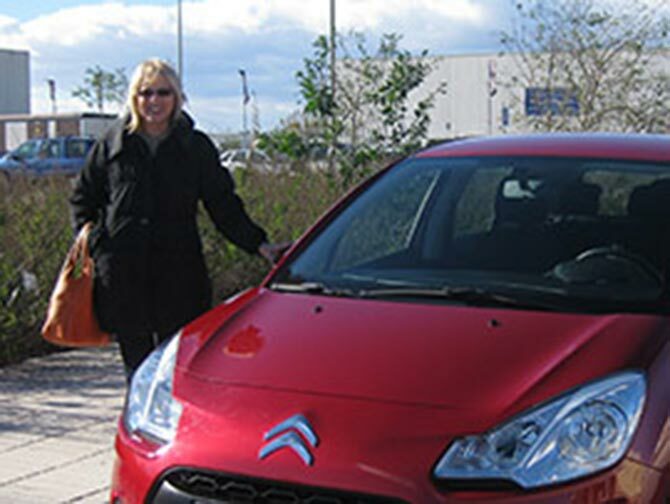 It so happened that a nearly Citroen Picasso was about to come into the showroom, so we waited a couple of weeks to see it. 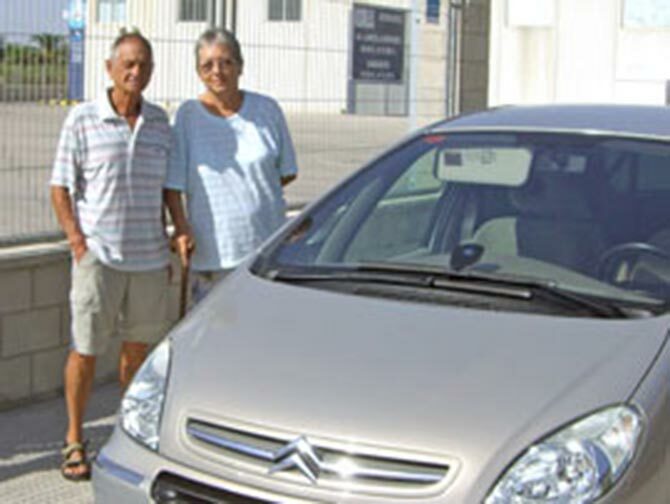 What a good decision that was, after looking round other at other cars elsewhere during this time, we were highly delighted to go back and look at the Citroen, which we bought. 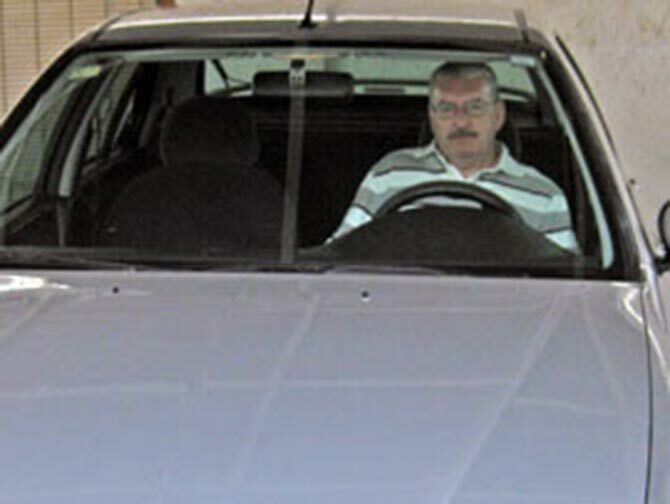 The process of buying the car was stress free, with all the paper work taken care of by Kevin. All we had to do was pay and drive the car away. I would certainly recommend anyone to use Autos Direct. To Kevin , and all the crowd at Autos Direct. 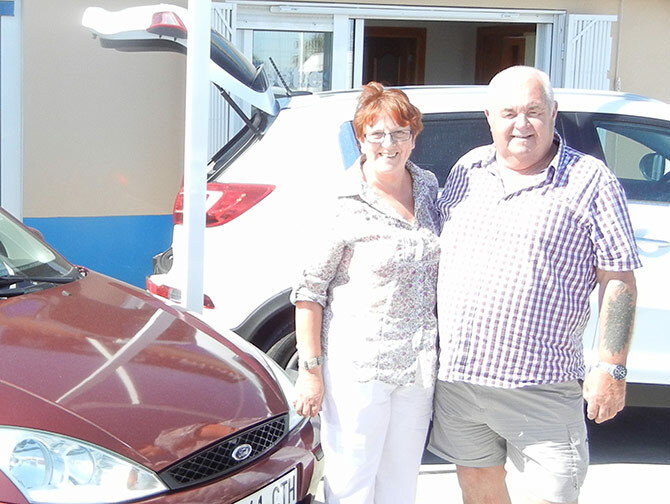 I would like to say thank you for your professional and friendly service in finding me a Ford Kuga recently. You did everything I asked for promptly , including the paperwork , and the car was beautifully prepared. I have already recommended you to a friend who is looking for a similar car. Once again , thanks for being polite and helpful in our dealings. K�ytetyn auton ostaminen Espanjassa oli helpompaa kuin olin kuvitellut.L�ysin auton netist� ja sain siit� hyv�t alkutiedot. Seuraavalla k�ynnill� auto odotti sovitusti koeajoa ja sain kaikki siihen liittyv�t tiedot helposti. Kiitos Kevinin my�s paperity�t sujuivat mallikkaasti. Kiireisest� aikataulustani johtuen Kevin k�vi jopa puolestani asianajotoimistossani hakemassa alkuper�isen N.I.E -todistuksen ja Deed-todistuksen. Koko prosessi kesti pari kolme tuntia ja auto oli nimiss�ni.Kiitos Kevin. 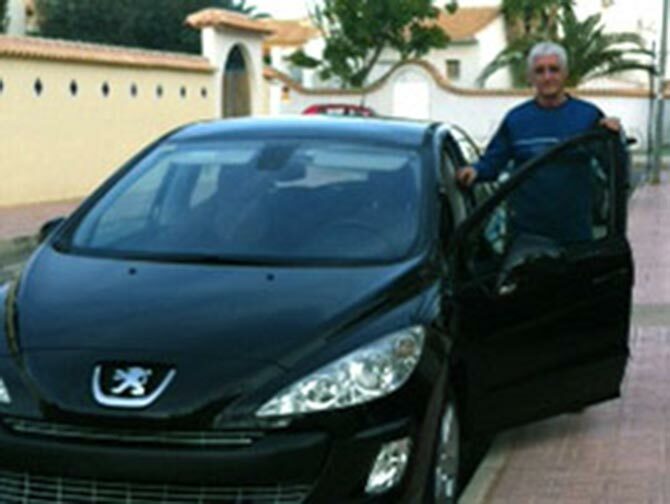 Buying a used car in Spain was easier than I had imagined.I found the car on the web and I got a good initial data. The next visit was expecting agreed test drive the car and I got all the related information easily. Thanks to Kevin also the paperwork went smoothly. Due to my busy schedule Kevin even went to solicitor looking for the original NIE certificate and deed certificate. The whole process took two to three hours and the car was in my name. Once again, thank you Kevin for very good service. 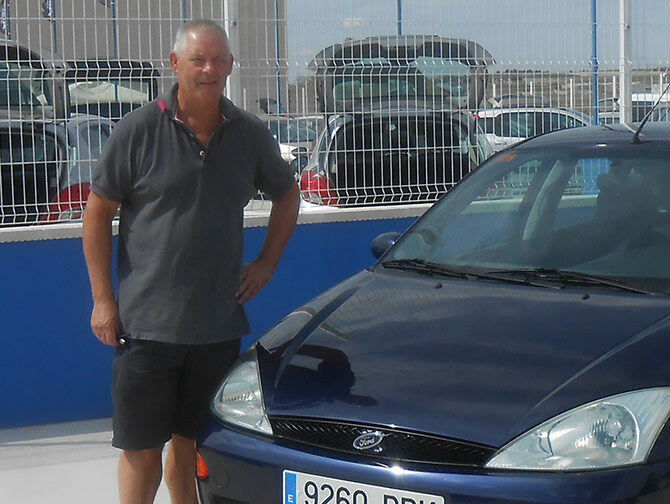 Thanks Paul for the help you gave us on the first car that we have bought in Spain,the back up and support is over and beyond what I would have expected,you and your team are to be congratulated ,it's nice to see some Brits getting on ,kind regards. 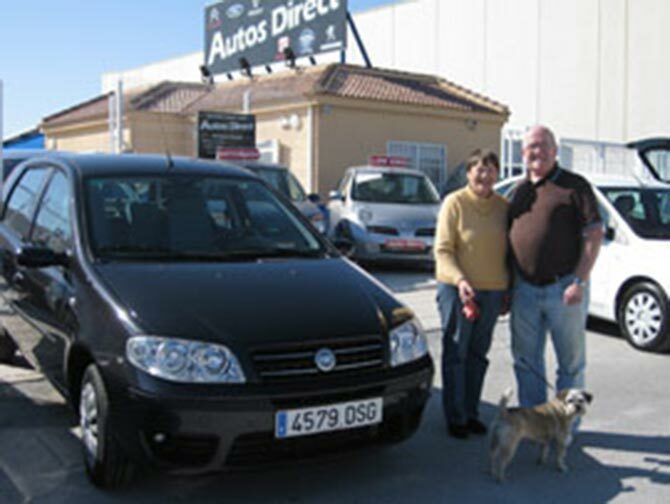 I bought my first spanish car yesterday from autosdirect and i was very happy with the whole experience.paul was very helpful when i called in to see what was on offer then only four days later i had my new car ready for me with all the necessary paperwork taken care of.it was all hassle free and i would definetly recommend Autosdirect. The car was very clean inside and out and it looked like new. The paperwork was all done for you making it so easy to buy the car, The insurance quotes were very competitive too. We negiated a great price in a friendly manner.All the staff male and female were very friendly and approachable, I would definitely recommend Autosdirect and use them again myself. Just like to say the car you sold us a few months ago is an absolute GEM!!. just got back from Sevilla trip, and it did not miss a beat, the diesel fuel consumption was amazing, I even thought that the fuel gauge was faulty!!. Thanks for a great car!!. Hi all - please add our comments to your testimonials.... great service, very professional. 2 cars bought in 3 months says it all. can't go wrong with Auto's Direct!!! 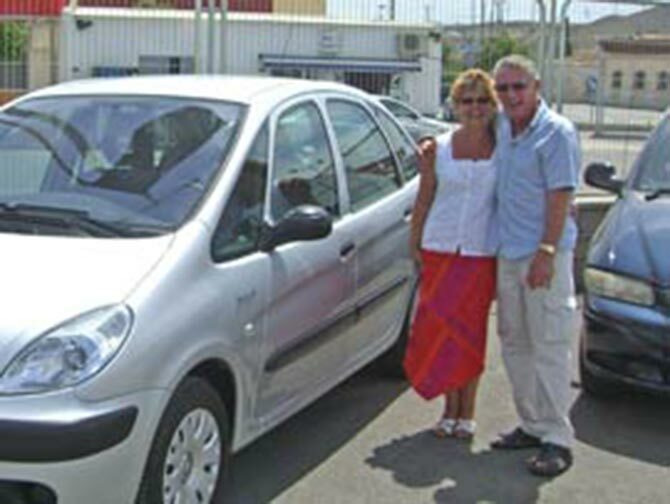 I had been considering a car purchase for some time as I have had a place in Spain for over 10 years. The cost and inconvenience of hiring a car on every trip was something I found more and more irritating. 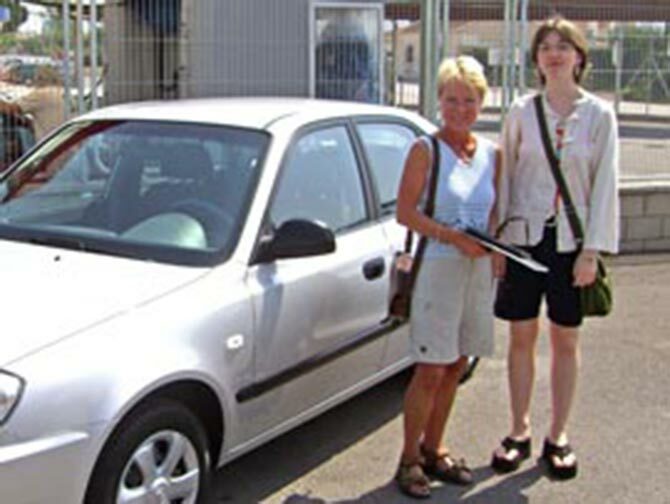 Like a lot of people I thought that the procedure for buying a car in a different country was a bit daunting. However I did my research through the internet and on a recent visit in August I went along to see Autos Direct and met Kevin and his team. 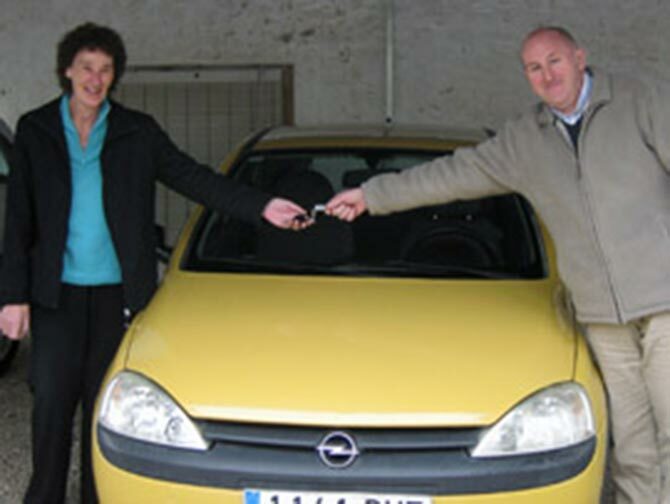 Fortunately they had just the car I was looking for, an Opel Corsa (2010). I had a couple of test drives and after a few days of considering and negotiating we agreed a deal. At that point all the necessary paperwork was taken over by Kevin and his team including sorting the car insurance. We agreed a delivery date for the car and it was delivered as agreed and with all the appropriate paperwork. The car was fully serviced and looked great. 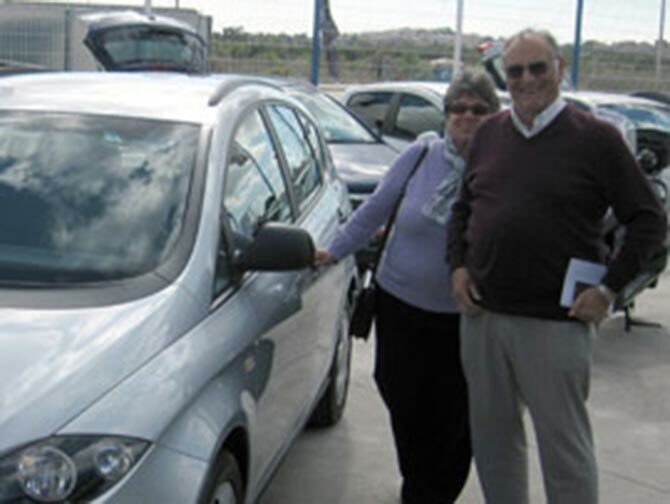 I haven�t driven it much but my daughter and son in law came out in September and apart from being very pleased to cancel their car hire they were also very pleased with the car ! 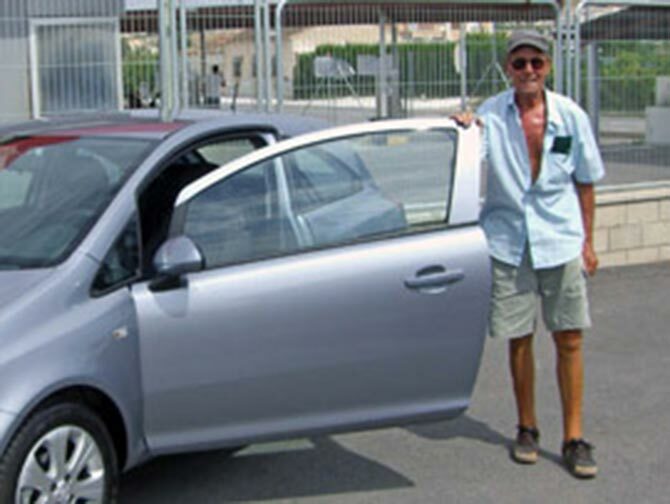 I am positive that given the excellent service received in purchasing the car that anything required in the future will be dealt with again to the very highest standards. Thanks to Kevin and his efficient team. 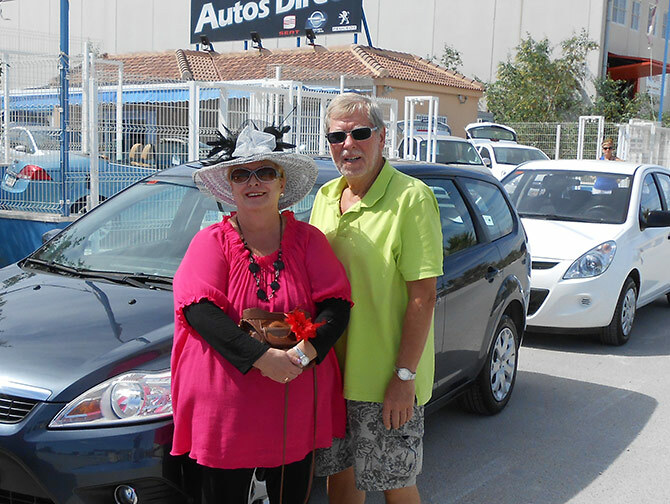 My wife Joan And I found Autos Direct on the web site and had a long way to travel from Aguilas Murcia to see the cars displayed on the site and with apprehension we made a day out, but make no mistake it was worth it as we picked our car done a deal and got home put down a deposit with no pressure to buy paper work was done documents transferred and the return we picked up the car, with minor faults rectified by mutual agreement all in all very pleased thank you. A first class service provided at autos direct Kevin does what he says, car valeted to high standard easy to deal with. Please check out these guys if your looking to buy a car. Thanks again. 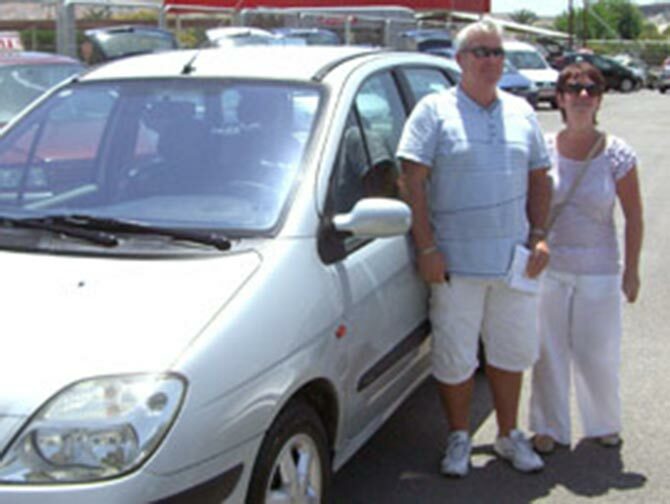 Having had no success in our search for a quality used car at a reasonable price Autos Direct were recommended to us by our property management company. Kevin talked us through our requirements and made a couple of suggestions from their good selection, then allowed us to test drive to our hearts' content. 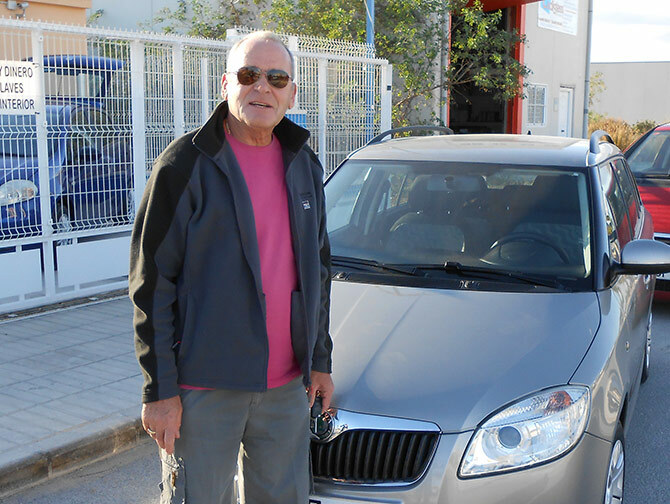 He found us the perfect car -which came in below our budget -and made the whole process incredibly easy by taking care of all the necessary transfer documentation,gave us valuable tips and advice on car ownership in Spain,and all done with good humour! We are very happy with our purchase and the service we received at Autos Direct- and would happily recommend the company to anyone. 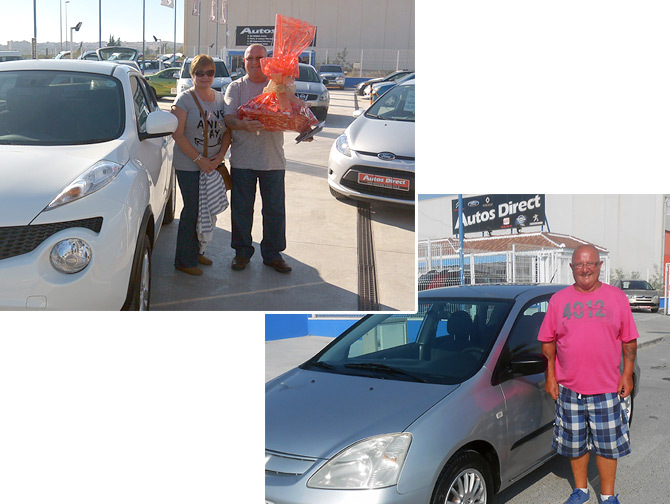 We have recently bought our second used car from Autosdirect. And we are pleased again! We reserved the car via e-mail, same as last time. Friends of us did first not understand how you can buy a CAR over internet, a CD maybe - but not a car. We started back home in Norway. It is much more convenient to sit at home, studying pictures and all the information you can obtain. You can take your time, go back the next day and look again � decide what kind of car you want, what year model, km, colour, etc. � and wait till you find what you are looking for. 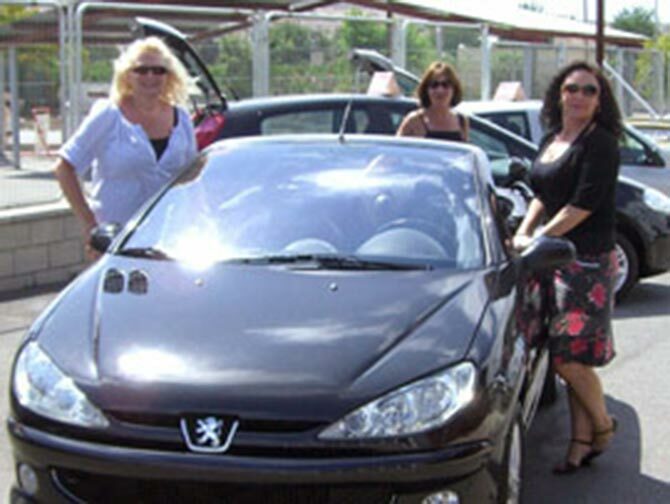 If you find the car � reserve it, pay a deposit, and go looking when you have arrived Spain and try the car. The deposit will be paid back if you decide not to go for the car. We are very pleased with the service from Autosdirect, very kind, polite and efficient with paper work � and we had the keys for our "new" car 3 days after we decided to go for it. We trust them, and can recommend them. Vi har nylig kj�pt v�r andre bruktbil fra Autosdirect. Vi er forn�yde igjen. Vi reserverte bilen via e-mail, slik vi ogs� gjorde forrige gang. Venner av oss kunne f�rst ikke forst� at vi turde kj�pe BIL over internett, en CD kanskje � men ikke en bil. Vi startet hjemme i Norge. Det er mye mere behagelig � sitte hjemme, studere bilder og all tilgjengelig informasjon. Du kan bruke all tid du trenger, og se igjen dagen etter � ta en beslutning om hva slags bil, hvilken �rsmodell, km-stand, farge osv. � og s� vente til bilen du ser etter dukker opp. Dersom du finner bilen � reserver den, betal et deposit, og dra for � se bilen n�r du har kommet til Spania. Depositet f�r du tilbake om du ikke velger � ta bilen.Vi er veldig forn�yde med service vi har f�tt av Autosdirect, hyggelig, h�flig og effektiv mht papirarbeidet � vi hadde n�klene til bilen 3 dager etter vi hadde bestemt oss. Vi stoler p� dem, og kan anbefale dem. 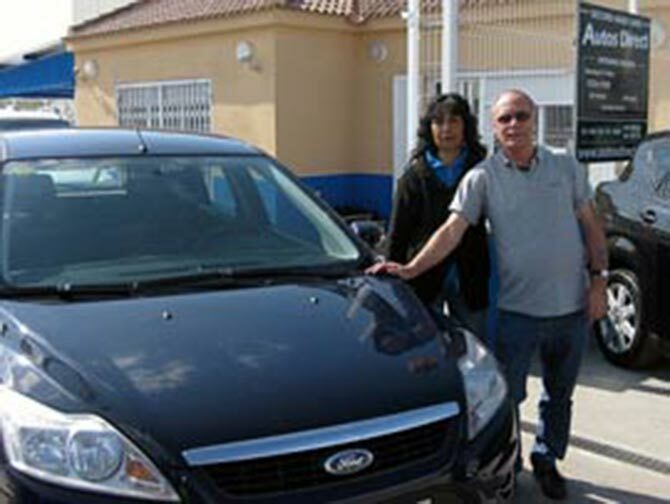 We have just moved to Santiago De Ribera to work and we needed to buy a car. In a new country it is difficult to get contacts and sort out all the details and problems linked to a purchase, especially when we do not speak Spanish. 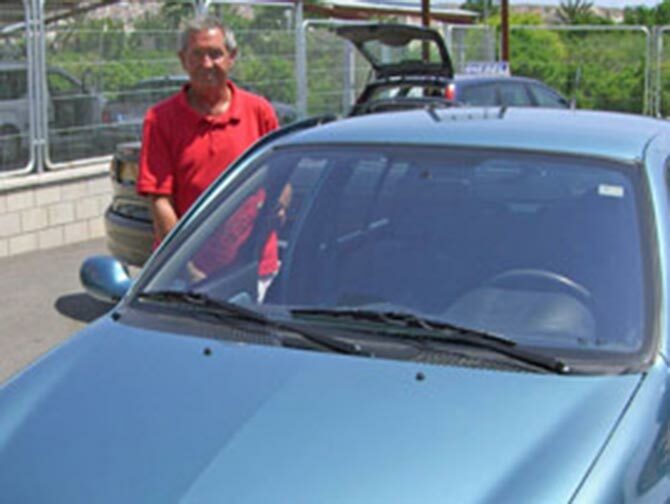 Auto Direct was recommended to us and we were not disappointed. 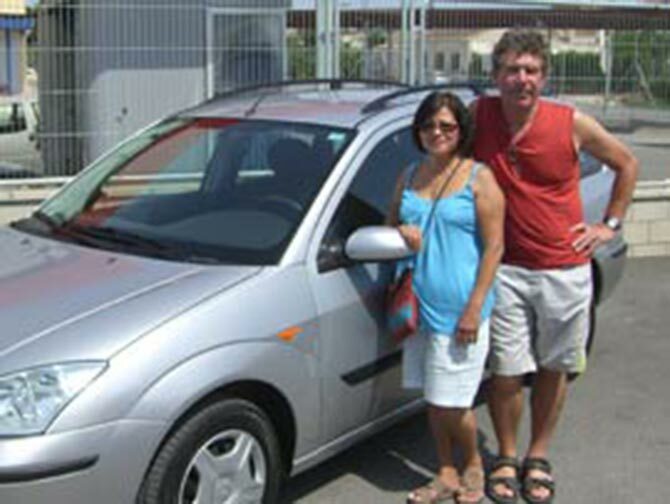 The service was efficient and courteous and within a short time we had a car. They looked after all the paper work and sorted insurance and provided support where necessary. We would highly recommend this company for their personal and professional service. Very pleased throughout the car purchase process. The new car was well presented when I picked it up � a stress free handover. All documentation prepared ready for handover in a professional manner by Paul and the Autosdirect team. I have just taken delivery of my second car from Autosdirect having traded in with them my original vehicle for a newer model. Why have I used Autosdirect? Because they are a company in whom I have confidence from sales through to servicing and ITV inspection they have been efficient and staff friendly. 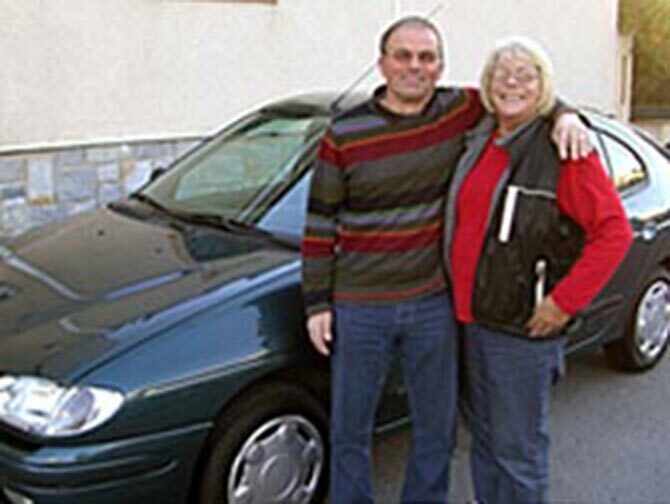 Used Car sales companies do not have the best of reputations but Autosdirect are excellent. I have no hesitation in recommending Autosdirect to anybody seeking to but a car. 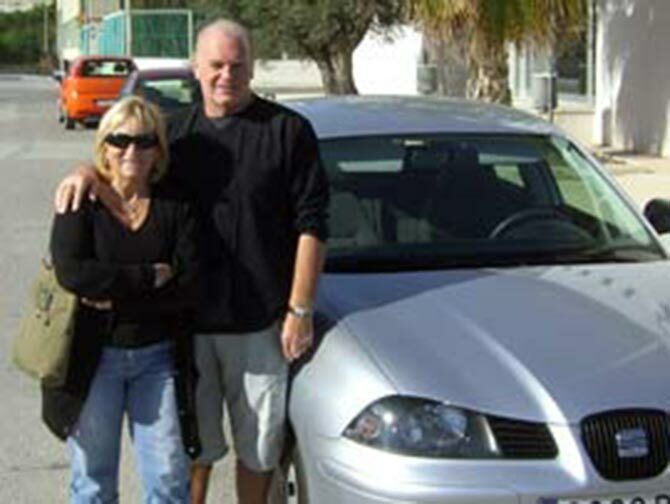 We was very pleased with the help that Autosdirect gave us with no pushing us to buy anything, just to look around in our own time and even gave us some refreshments while we decided which car we would like our friends took us there as they had purchase a car a couple of years ago and said they was very pleased with the alter care as well as there car will be telling friends where we bought our car as you could recommend them to everyone. The service was very professional and friendly. Reliable and trustworthy company would recommend them to anyone looking to change their car - Thank you. It can always seem a little daunting - intimidating, even - when buying a car. Unless one can be absolutely sure of the marque, price, colour of car that one is seriously interested in buying, the fears of being swayed by unscrupulous salespeople are always at the front of one's mind. However, not so with Autos Direct where I really have to say, the procedure was one of the most pleasurable and straightforward ones I have ever had. Although my mind was firmly held on buying another Mercedes-Benz, the style of car was more debatable. I had originally seen a shiny blue SLK on the company's Web site and this appealed to me, even though I thought my days of boy-racing over & done with. But when Paul at Autos Direct told me that they were about to take delivery of a Spanish-registered estate from the Stuttgart-based motor manufacturer, I had to remove my 'wild and woolly' head and in place firmly affix my more pragmatic one. Of course I had to view it first; but the idea of a larger car (I had never owned an estate car before) made more sense. I have a house in France and a roomier estate car - over and above all other types of vehicle - would make my life easier in transporting belongings there. I was in no rush to obtain the car (my days of getting overly-excited over the delivery of new vehicles have long-since passed). 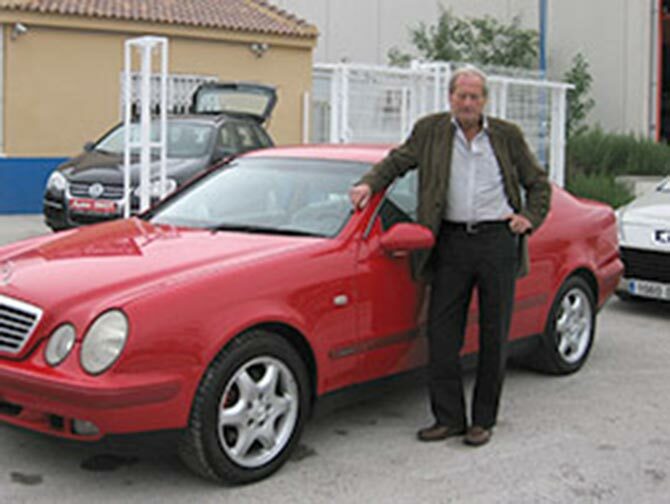 Besides, the car I was trading in - a Mercedes-Benz CLK 230, which had owned for almost six years - had been the pride & joy of my life and had never, ever let me down. So I was actually quite loathed in giving up the old one for the new one. But the day finally came when one vehicle was exchanged for the other (for a little additional money, of course!). It's early days yet, but I am so-far happy with my purchase. I only hope that it can give me a long-lasting relationship in the same way as my former Coup�. 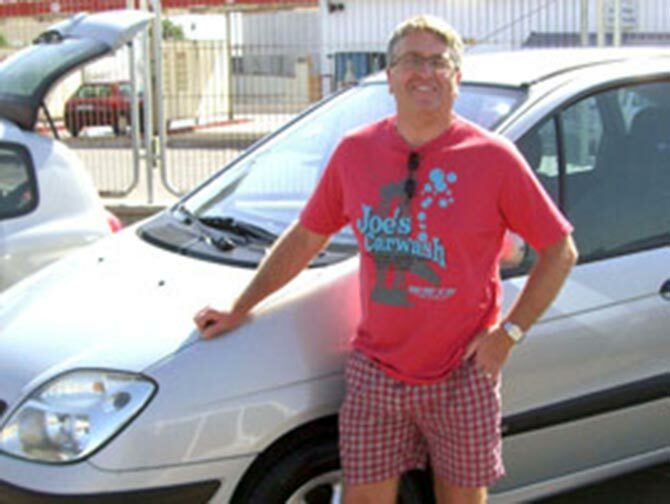 In my experience of buying the car I can only recommend Paul, Kevin and their professional staff in their proficient and painless service. Who knows what the future might bring for all of us, but knowing what I know now, it would be my pleasure in dealing with Autos Direct once more, and to recommend their slick and competent services to others who may have the same, original reservations as me. 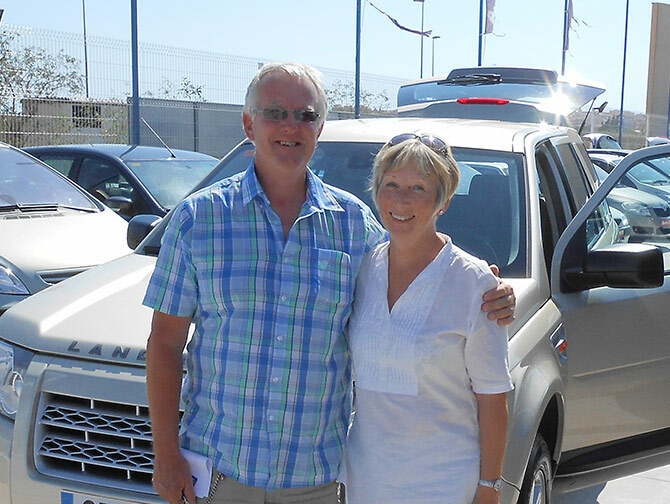 We purchased our Land Rover Freelander from Autos Direct in September 2013. 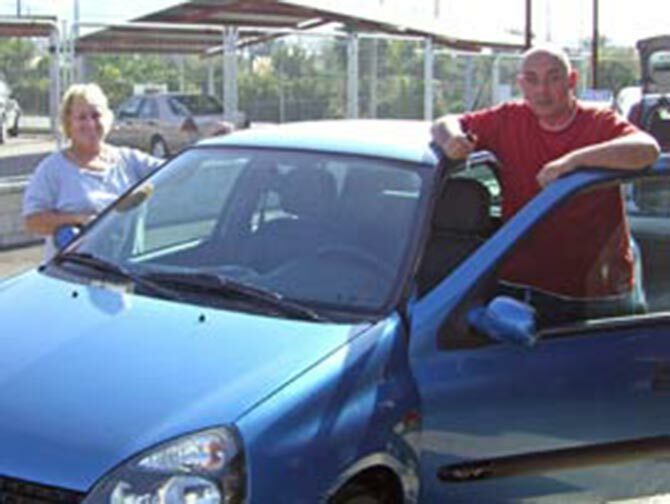 We were very impressed with the car and even more impressed that we able to take the car for an unsupervised test drive. 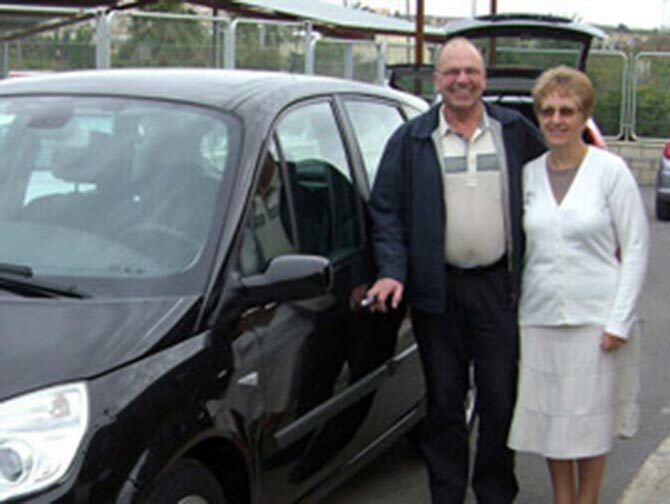 The buying process was painless and Autos Direct made sure all the paperwork was correctly transferred before we collected the car. Once home there was an issue with the car key fobs which required attention. Without hesitation we were directed by Autos Direct to our local Land Rover dealership for replacement keys to be programmed to the car at the expense of Autos Direct. We don't think you can ask for more. Its nice to buy a car without feeling you have been ripped off and having the knowledge that the after sales service to date has been faultless. We would recommend others to give them a try. 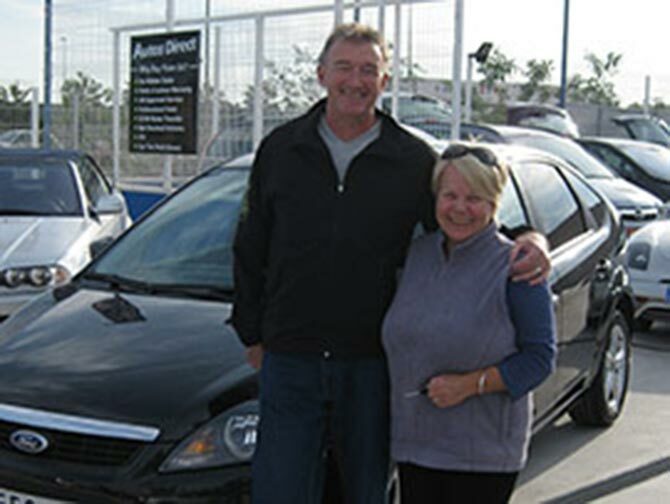 We recently purchased our Honda CRV from Autos Direct and the team couldn�t have been more helpful. 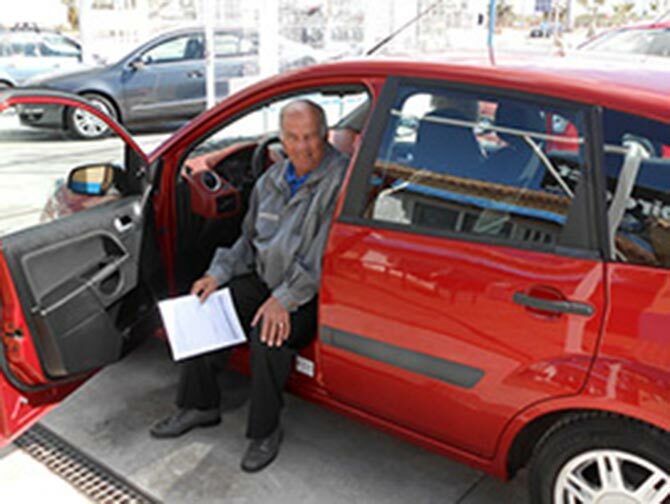 Paul and his friendly staff made the process so easy and definitely went the extra mile to ensure our purchase was hassle free. They even sorted out the insurance on our behalf. I would highly recommend Autos Direct and will definitely use them again when we need another vehicle. 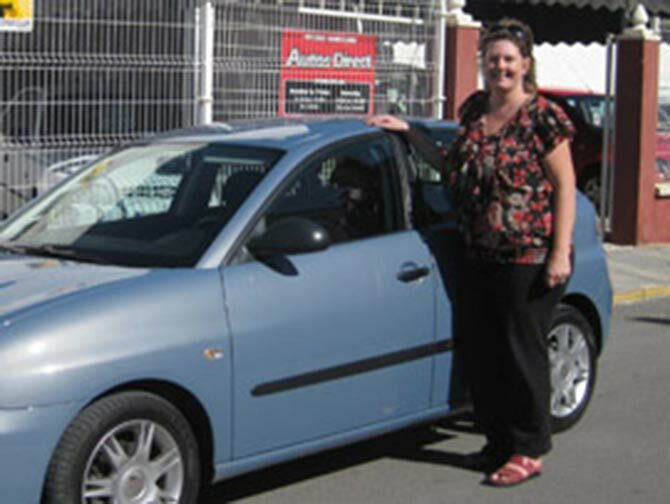 After both my husband and I exchanged both of our cars with Autosdirect there was no other choice when Maureen said she wanted a new car. We received nothing but good service, with all the paperwork completed the same day which was a bonus!! Without a doubt we would recommend Autosdirect to anyone wishing to sell or buy a car. 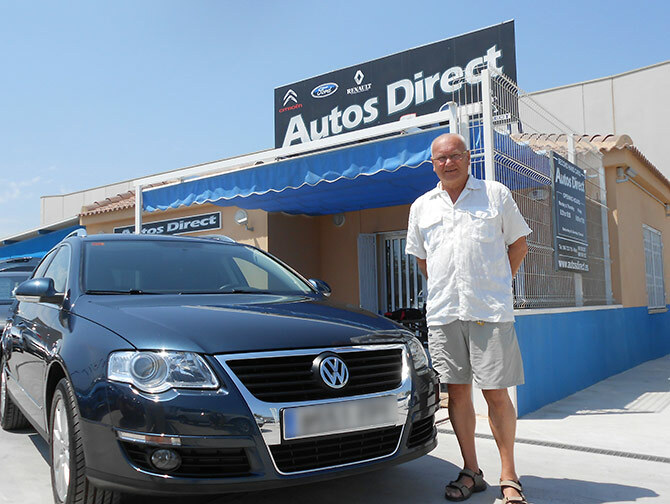 After recommendation from friends, we visited Autosdirect with specific requirements. At the time there wasn�t anything suitable but left things in the capable hands of Kevin � a very approachable friendly and helpful gentleman. During our time in England he sourced and informed us of several vehicles which he had coming in. 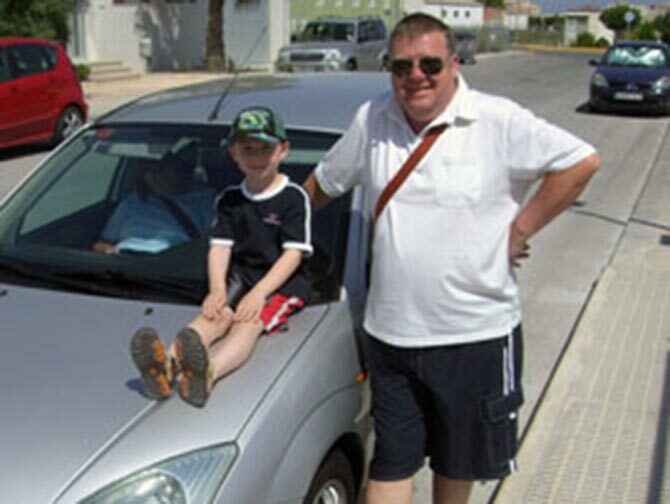 As soon as we arrived back in Spain he had the perfect vehicle which ticked all the boxes. 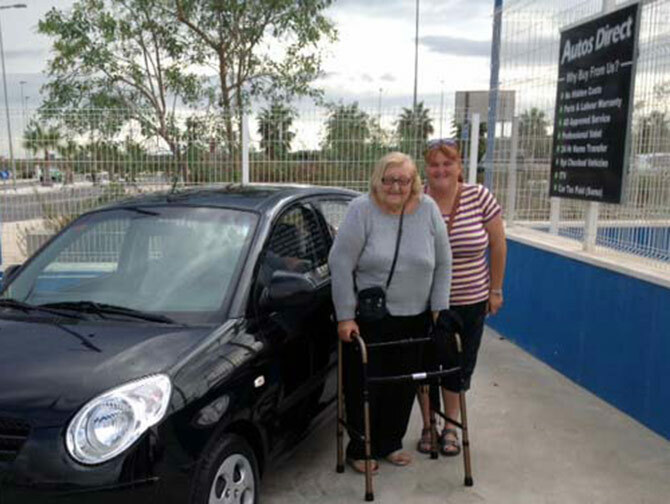 We need an adaption to the car due to disability, Kevin again made several enquiries in the UK to purchase the required parts. He has now made plans to add a new service to the company which will help us immensely making it possible for both of us to drive in Spain. Autosdirect went that extra mile to provide satisfaction. WELL DONE!!! We would recommend Autosdirect every time! A completely hassle free transaction. 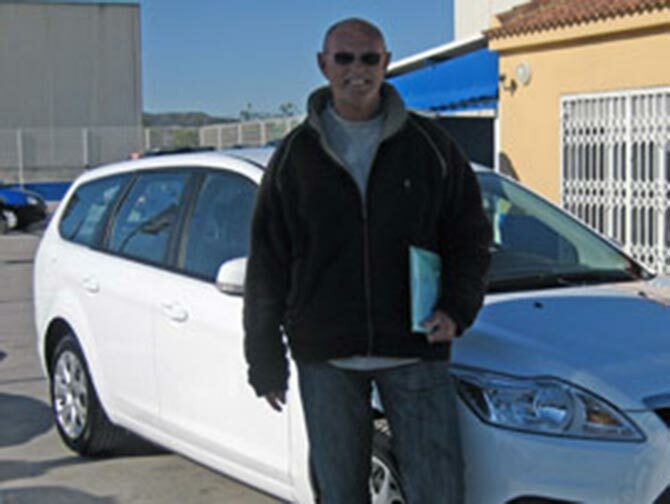 Buying a car with Autosdirect was easy, quick and a pleasure. All the staff are very helpful, friendly and will answer your questions very honestly. We highly recommend them to everyone!! 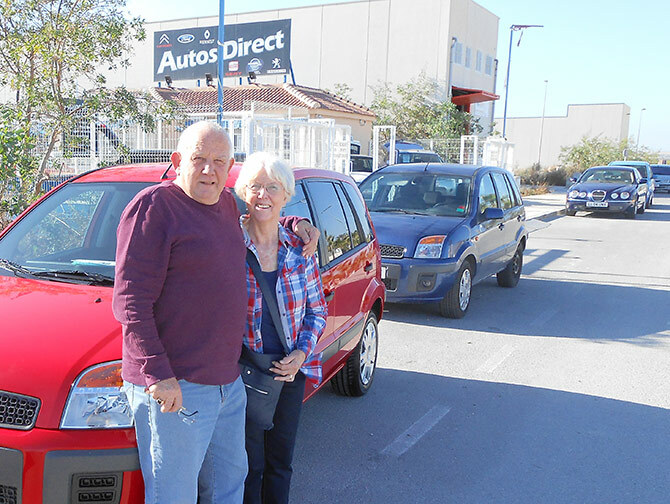 My wife and I have been out in Spain for 7 years and have just bought our 4th car form Autosdirect. 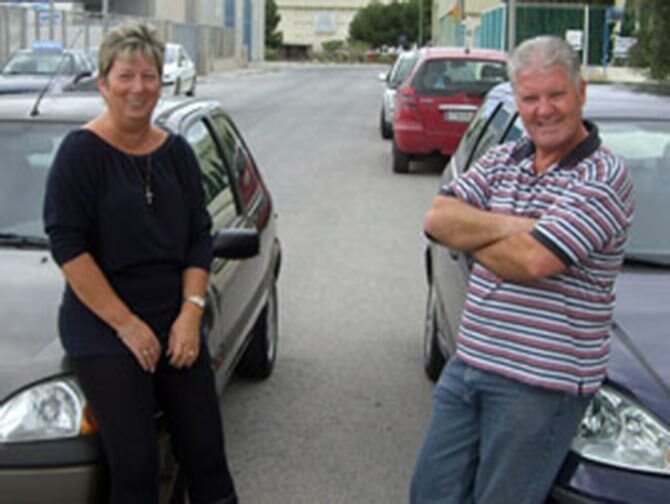 We have always found Paul and Kevin to be very helpful with any of our motoring problems (not that we have many !) We have recommended Autos Direct to many of our friends and neighbours who have all been very happy with their service and have gone on to be repeat customers also. 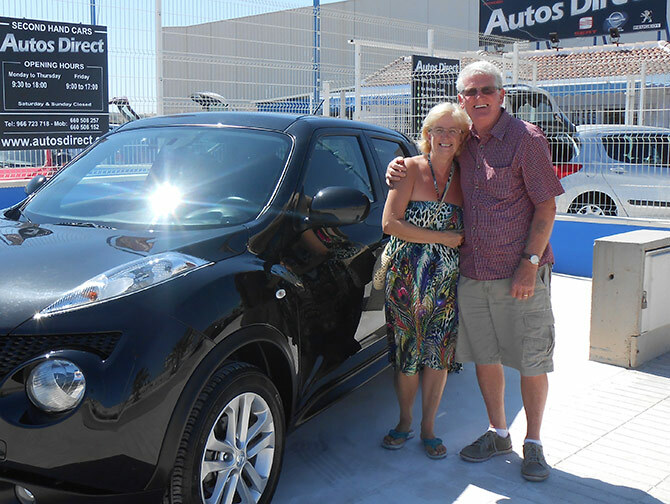 My wife and myself would like to take this opportunity to thank the management and staff at Autos Direct San Miguel for being so very polite and courteous and utterly professional when selling us our car. There was no task too little for them and were fully committed to completing all. Thank you to them. We would like to thank Kevin & Paul and all the staff on a very good transaction on the purchase of our Chevrolet Karlos,and the excellent service we received and hassle free paper work, I would highly recommend Auto Direct as a company to deal with, and will return in the future. 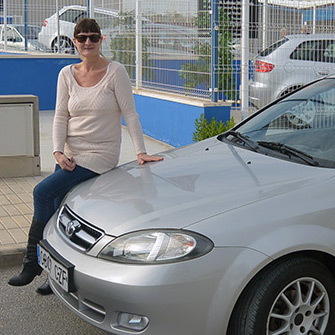 After purchasing a Ford Focus in February 2013, where I found the service offered by Autosdirect to be excellent I decided to upgrade to a Ford Mondeo. 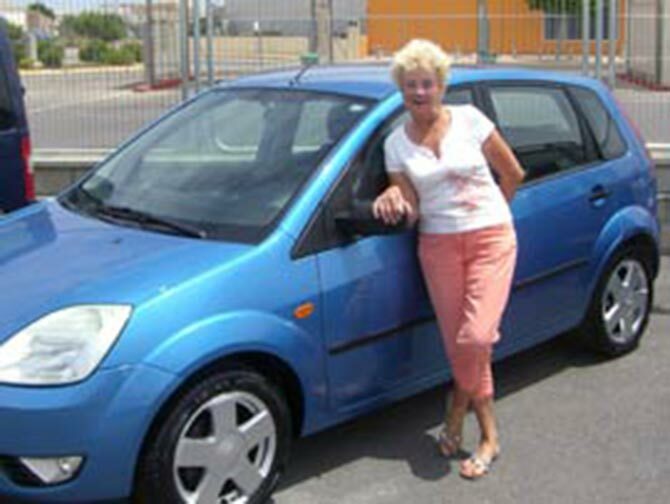 I found the offer I received for the Focus to be very good and I was happy to pay the extra for the Mondeo. 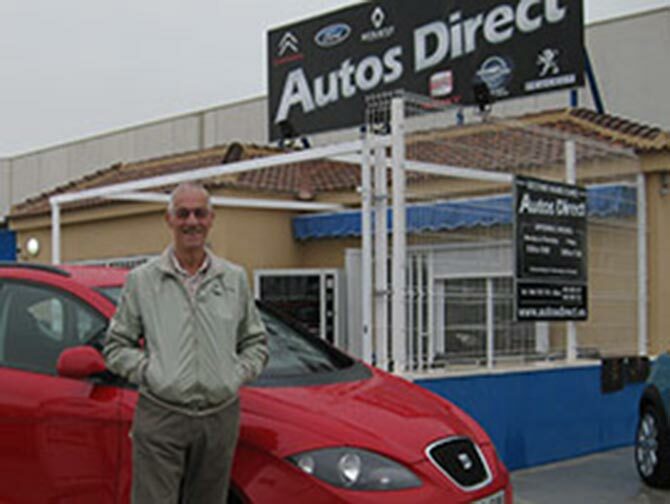 I have recommended Autosdirect to my friends and I am sure they will receive the same excellent service I have received. This is our second purchase from Autos Direct. 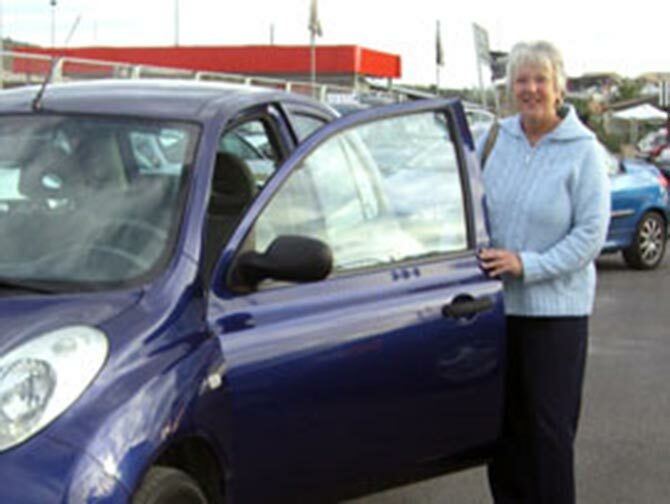 We did look at several other local car sale venues before returning to Autos Direct who offered us the best deal and gave good service without any sales pressure. We have just purchased our third car from AutosDirect and as always we have been very satisfied with their fast and efficient service. The paperwork was all done for us so there was very little for us to do. 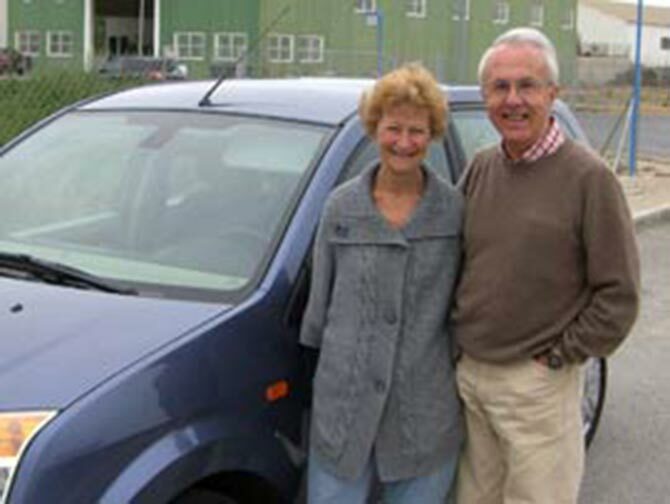 We would not hesitate in recommending AutosDirect to anyone needing a good reliable car. We had good pre sale info from Autosdirect about the car we were looking for and our part exchange. In January this year we returned to see the car we were looking at and bought it.Everybody was very helpful, they handled all the paper work promptly, before we collected the car they explained to us all the controls on the car and what paperwork was needed to be legal. 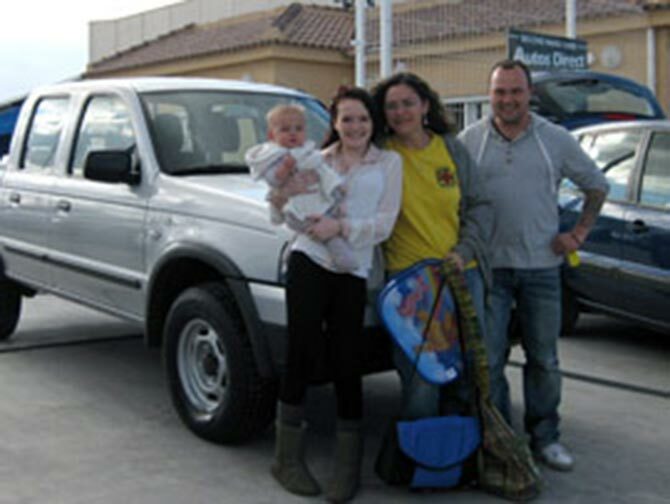 From start to finish we are very happy with Autosdirect and we would recommend them to all! Great service. Very pleasant people to deal with. Very happy with my new car! Thanks again! 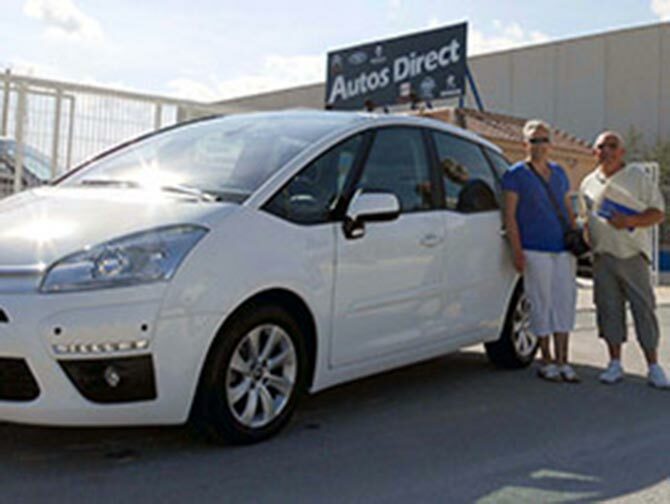 Approached Autosdirect with instruction for our perfect car. Within a short time they came up with the right car for us. Great service and very friendly staff. Very happy with our purchase, Highly recommended. I would just like to say how pleased we are with our new car and the service we received at Autos direct. The customer service was second to none and we would recommend them to anyone - we got the best trade in price for our car after trying other garages in the area. 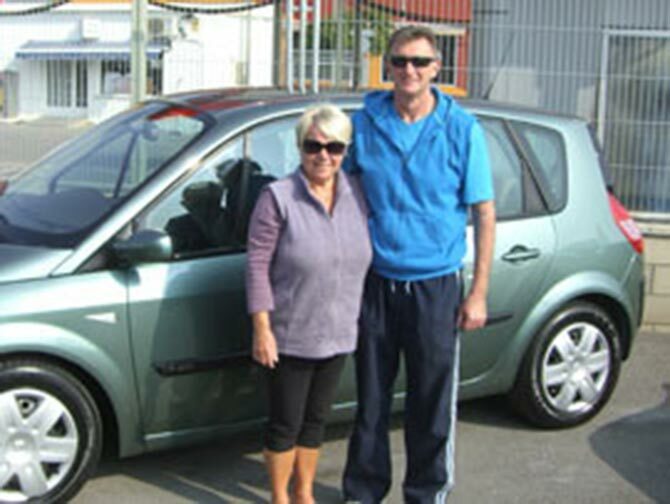 My Second car purchased here at Autosdirect, I knew from past experience it would be hassle free and a brilliant bargain. No regrets whatsoever and I would definitely choose Autosdirect again. Hi Paul - A few words for the photo. - Many thanks for taking the worry out of the purchase process. The whole team were very helpful and we are very happy with the car. Very pleased with the complete package! 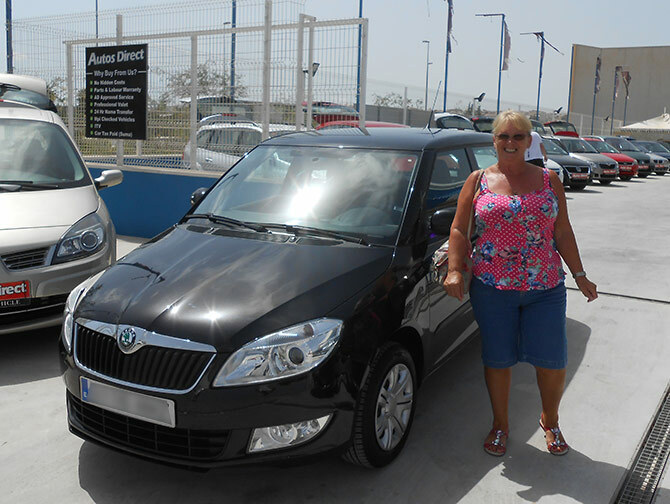 Pleasant sales staff, good trade-in, cars for sale shown at their best, and good aftersales service. I would recommend this company to everyone! I am very pleased with my car, I wish I have gone to Autosdirect straight away instead. 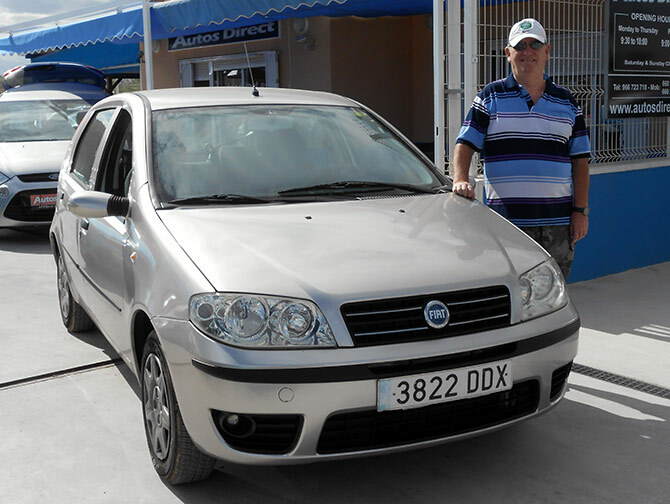 I bought a car from a man who knows a man and it turned out to be a right disaster , lots of wasted euros and lots of headaches we finally found Kevin at Autosdirect. Now we have a decent car to be proud of. Thanks Autosdirect! A big THANKYOU TO Autosdirect. 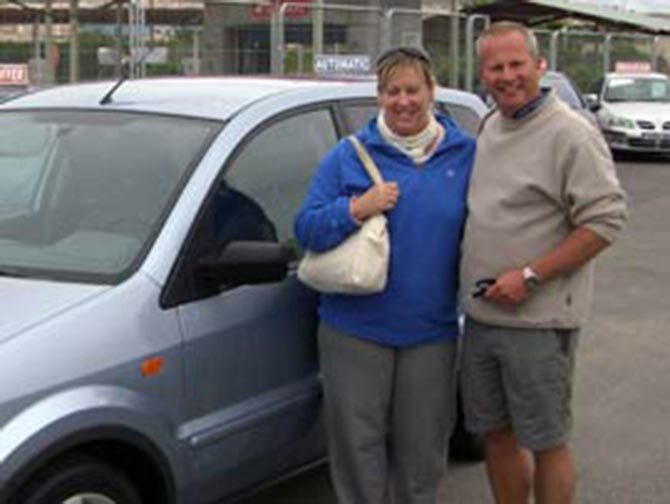 I bought a UK car off them as we were heading back home (UK)! The car went through its MOT with flying colours no problem and drove back from Spain like a dream. My husband and I are very pleased by the professionalism of your staff. The vehicle was in perfect condition and was immaculate inside and outside. Care and attention had been given to the engine and all other safety aspects of the vehicle including a warranty. 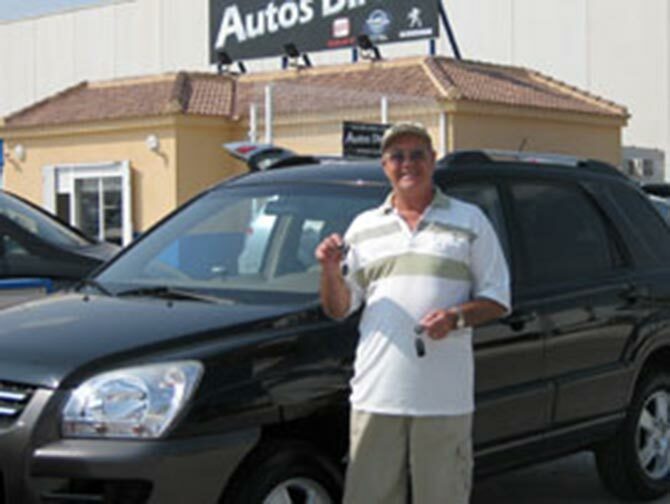 I wish to post my review in GREATLY thanking Kevin, Paul & all the staff of Autos Direct. 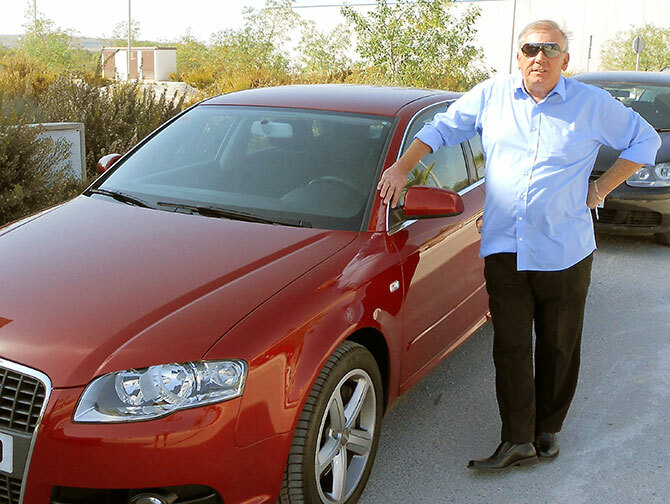 I am TOTALLY happy & satisfied with my car purchase, never the less the FANTASTIC service and assistance of everyone. They have helped me in every way possible in collecting me from the bus station, hotel accommodation over night & in less than 24 hours I was on my way with everything signed, sealed & delivered. You guys are great and outstanding! See you again soon in buying my 2nd car ALSO from you. BRAVO !!! 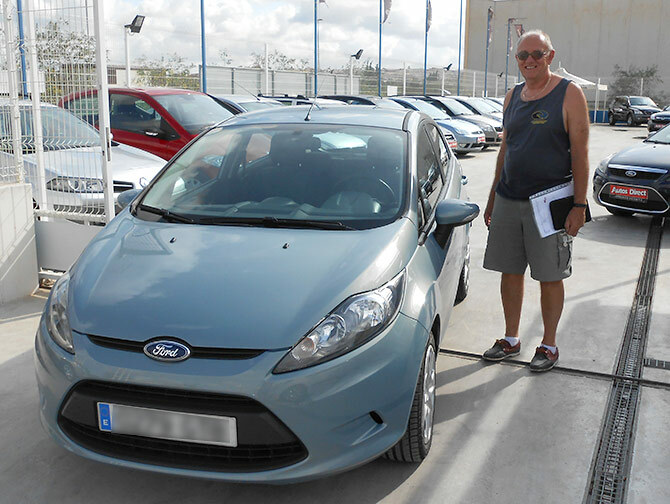 Hi Paul, I would like to say thank you for the exceptional service we received from you and Kevin during our recent purchase of a Ford Focus. Its rare these days to find a company that cares if their customers are happy or not as you have done. Anything that I felt needed attention prior to purchase was done without question plus a service, valet and a six months warranty. I would not hesitate in using Autos Direct again or recommending you to anyone. Autos Direct were highly recommended to us and we were not disappointed! 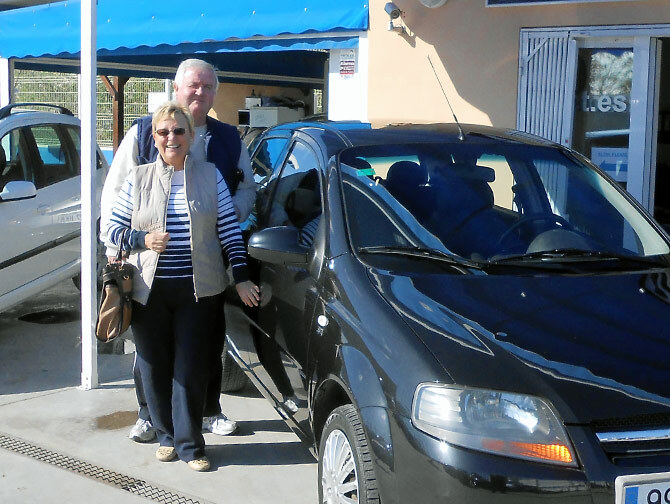 From start to finish, we were treated like valued customers - the service was friendly and efficient; communication about various aspects of the transfer was excellent; they did everything they promised; and the car was in immaculate condition when we collected it. We also have the comfort of knowing that we are covered by their 12 months' warranty should anything go wrong - buy a car with complete confidence from Autos Direct! This is my second purchase from Autos Direct and once again extremely happy with my new car the brilliant service from Kevin and his team. Have recommended this company to many of my friends who in turn have also been very happy with their purchases and will continue to introduce Autos Direct! 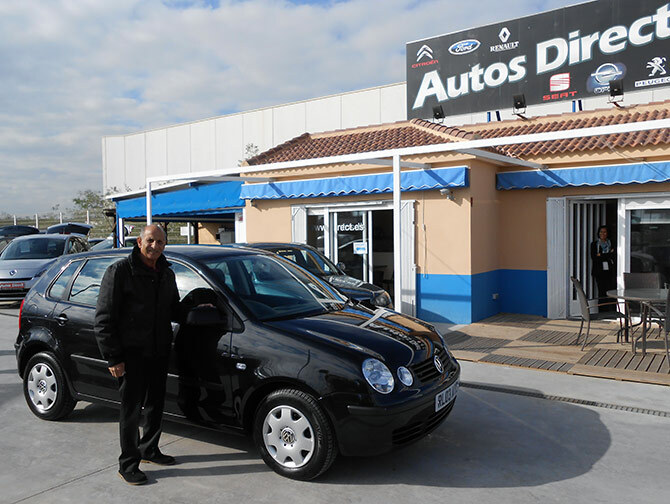 I would like to take this opportunity to thank Paul and the team at Autos Direct for the first class service I received with the purchase my first car in Spain. From the moment I requested them to hold the car over the phone, I received personal attention that put me at ease. They are friendly, polite, highly professional and offer a one to one service that makes the whole experience seamless and most of all....enjoyable. 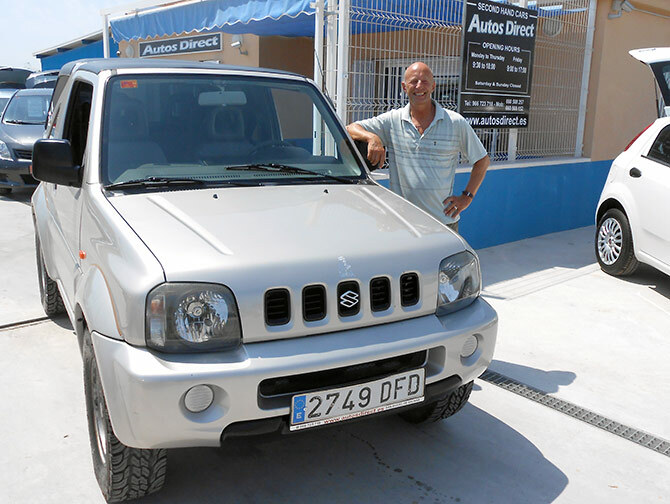 I will continue to be customer going forward and would not hesitate in recommending Autos Direct to anyone looking to buy a car in Spain. 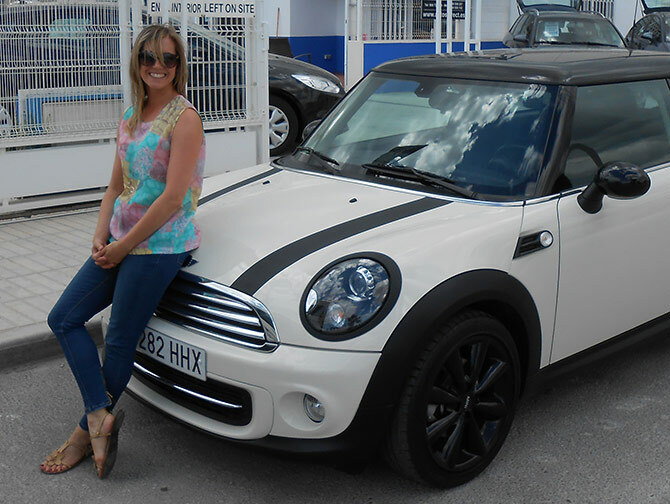 Absolutely love my Mini Cooper!! So happy that my wife and I Visited AutosDirect when choosing our new car. They had a wide variety of vehicles to suite any budget. 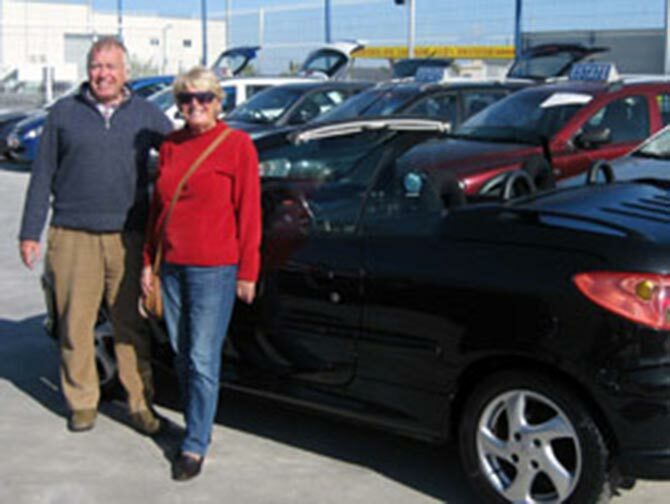 All the team made us feel like special customers and the whole process of buying a car from start to finish was dealt with in a professional manner at all times. We will be back to AutosDirect when we need new car again. I found Autos Direct on the internet after many hours of searching. I really liked what people say about them that they care for their customers and they are service minded. Autos Direct didn't disappointed me at all. 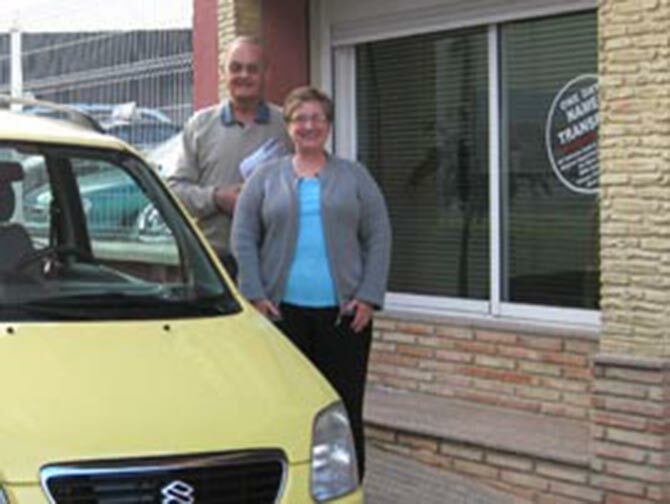 They were really helpful in any matters, paperwork, insurance...etc, and all I can do is to thank them to make the whole car buying process in Spain so easy! 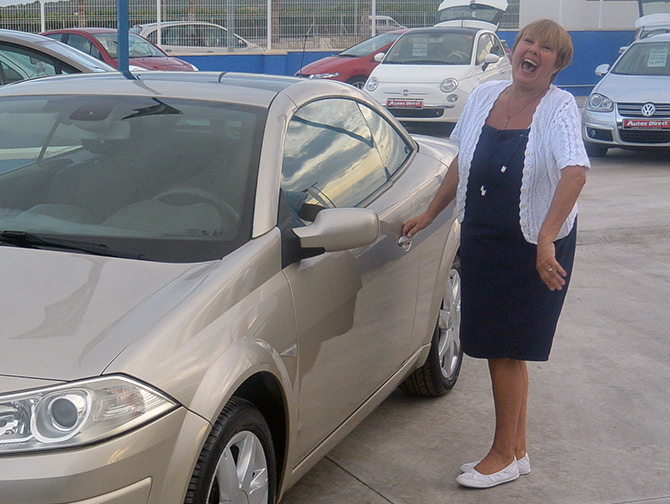 A special thanks to Gordana at Autos Direct AS, whose helpfulness and kindness blew me away!!! I can highly recommend them! Thank you again! 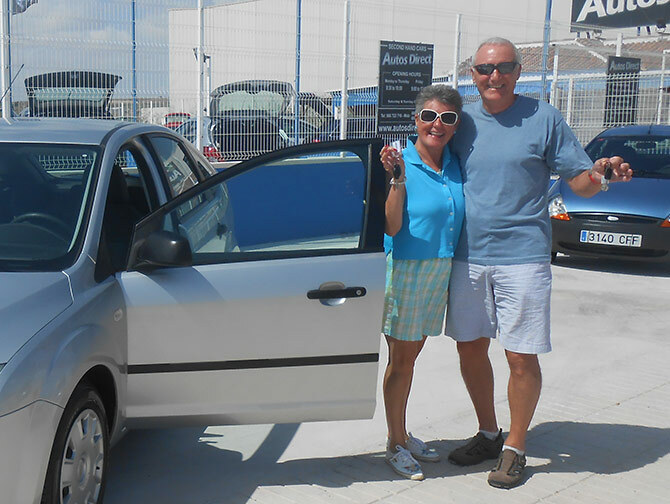 We have just moved to Spain and were recommended to Autos Direct and we were not disappointed. The service was excellent, we were allowed to test drive by ourselves so no pressure from sales. We would have no problem recommending Kevin and his team. 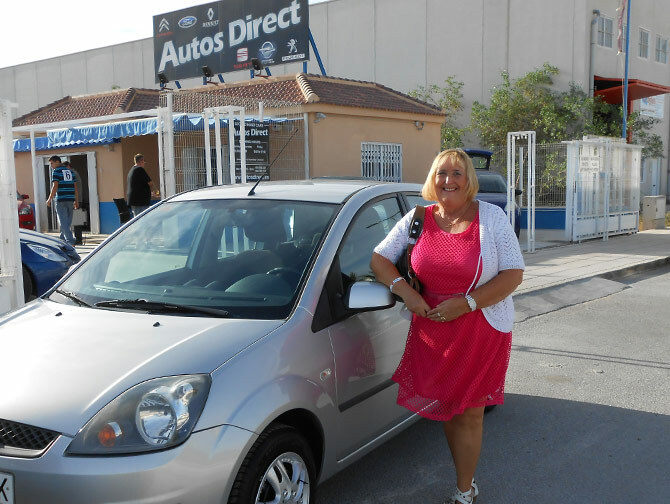 I would like to thank Kevin, Paul and all the staff at Autos Direct for the wonderful help and service they have given me since I purchased my car from them in January. 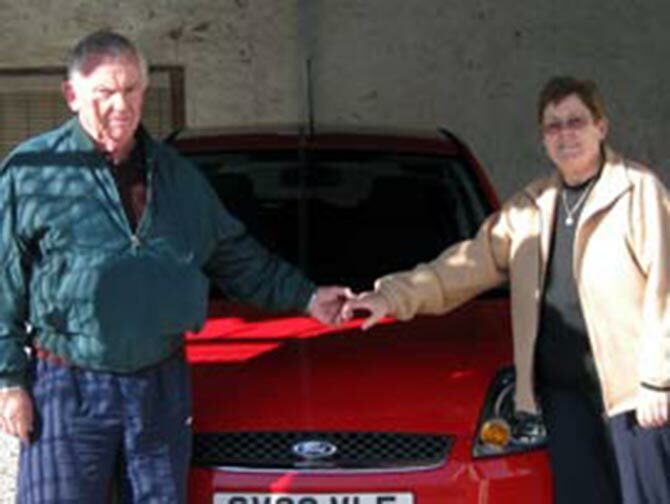 Sadly my husband passed away not long after we bought the car and there were a few teething problems that could not be sorted immediately due to my husband�s illness but I was told not to worry and take my time and when I was ready the things would be done which, they are now to my complete satisfaction. I would recommend Autos Direct to anyone. I love my car. 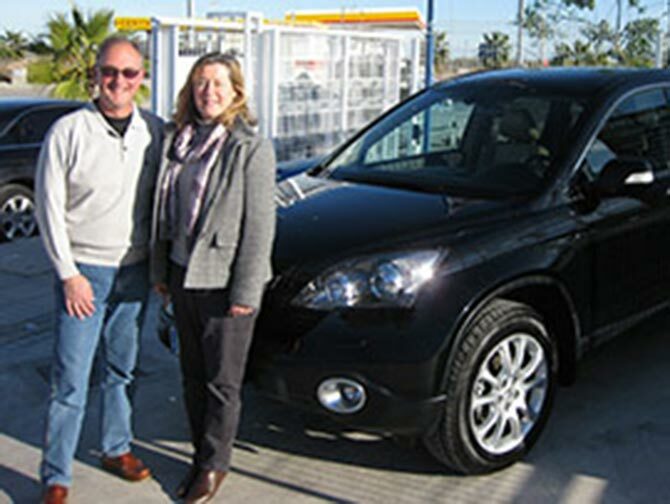 Thank you making the process of buying a car in Spain so easy! You were cool, calm, and good humoured throughout. 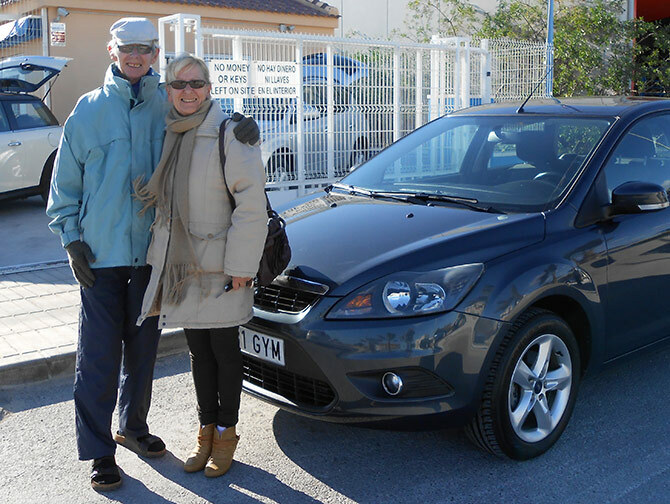 The Focus drove really well when I took it to Alicante and I am very pleased with it. I really appreciate how well it was serviced, cleaned and presented. The testimonials on your website are well deserved. You provided exemplary customer service and I would be pleased if you use any of these comments on your testimonials' page. 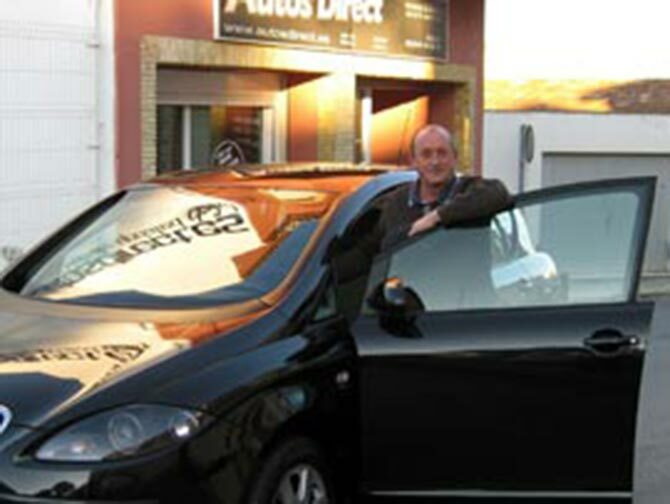 We would like to put on record the excellent service from Autosdirect with the purchase of our Modus. Should have gone to them 8 years ago instead of using numerous car hire companies. Autosdirect attention to detail is amazing and have absolutely no hesitation in recommending them. Many thanks to ALL the team at Autosdirect and collecting us from the airport. We are delighted with both cars, appreciate the service you have given us, but above all, it's nice to do business with nice people. Our thanks to you and all the people we have come into contact with on your team. Look forward to hearing from you. Thanks for the very pleasant transaction when buying the 208. Car is great and the service provided was first class, I will be back and will not hesitate to recommend Autos Direct. I just wanted to drop you a line to say how happy we were with the service you provided. We never felt as though we were under any form of pressure if anything you helped to alleviate many of our concerns. You gave us time to discuss in private if we wished to proceed with the purchase. For this we were really grateful as it provided us with the opportunity to discuss our finances without any form of sales pressure. If we were to rate your service out of 10 then you will definitely get full marks from Grahame and myself. I would highly recommend you to our friends. Sincere thanks and looking forward to dealing with you again. ( hopefully not too soon ). This is my third car from Autos Direct in as many years - Why?? Because I get the professional sale and aftersales service that guarantees you get the car you are paying for without hassle over paperwork. 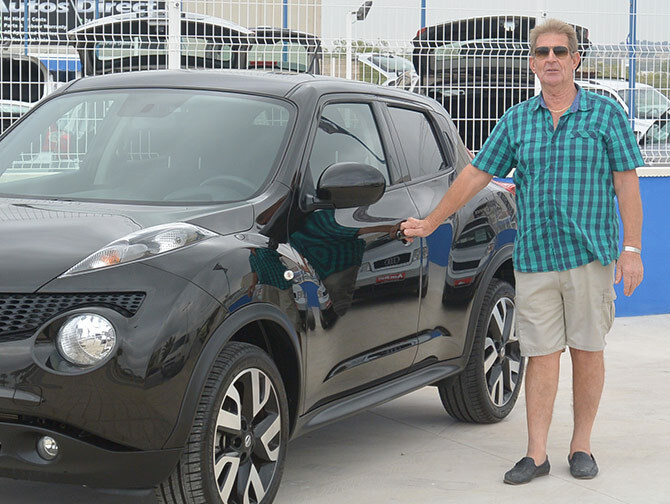 Very pleased with the Juke all going well. 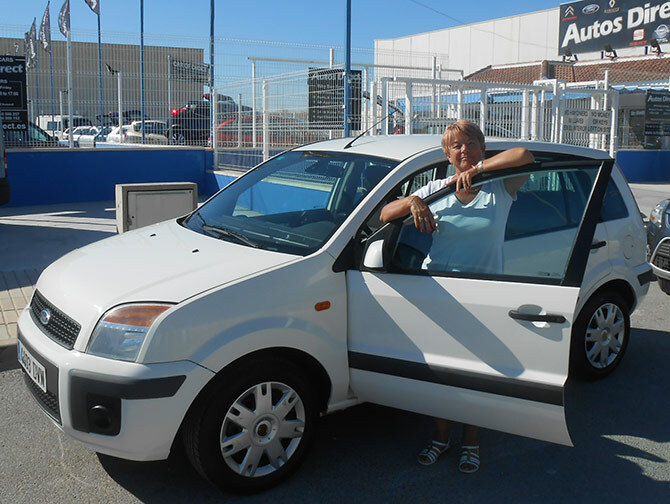 When my wife went out to buy a car on her own 3 weeks after we moved to Spain, whilst I was working away, I was a little nervous of what she might be sold. 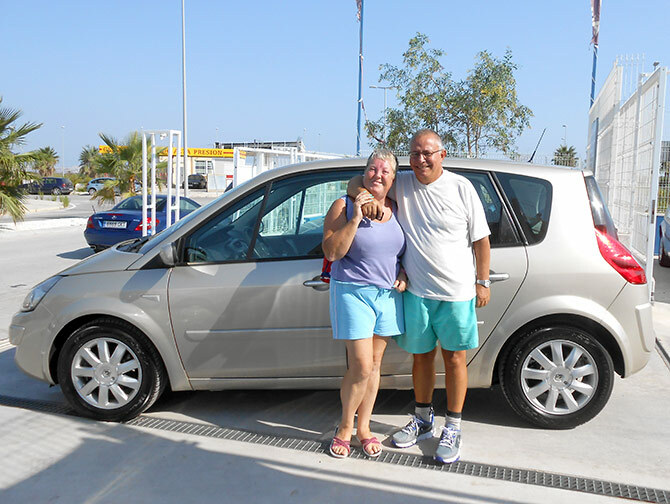 I needn't have worried, Paul sold Annita the perfect family car and went above and beyond making sure everything was just right for her and she would have some trouble free motoring. 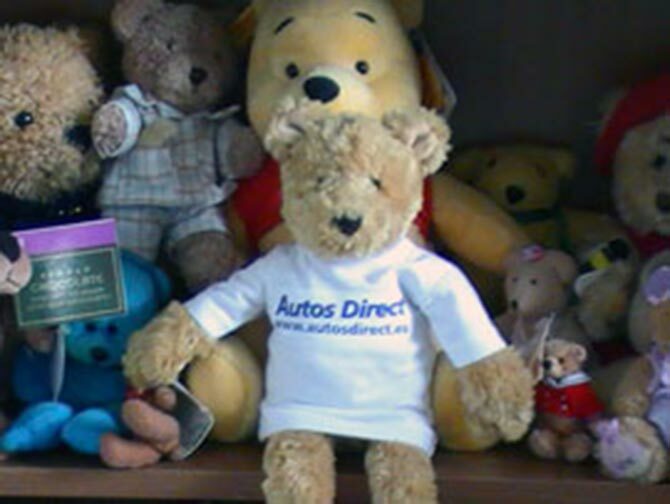 When we're due to trade up, we'll be going straight back to Autos Direct, a superb service and peace of mind. 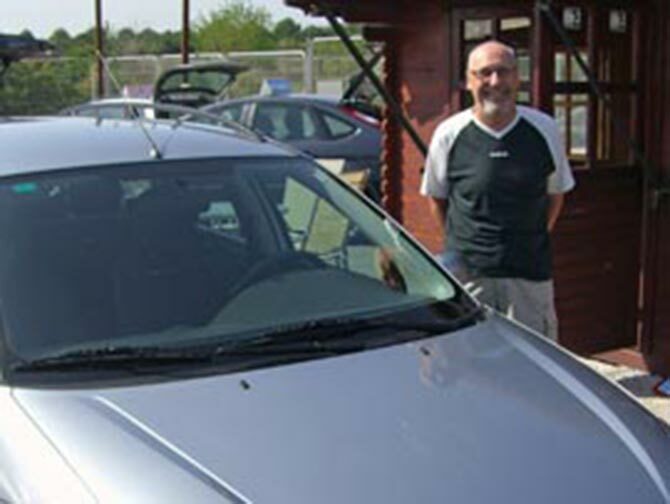 Hi Paul - Just to say thank you to you and the team for our third buy from Autos Direct. Great service - and would not go anywhere else. I have just bought my new car from Autos Direct and the standard of service and customer care was second to none, no pressure whatsoever and Paul was so helpful in every possible way, making my decision to buy from them an easy one. I would definitely have no hesitation in recommending Autos Direct and can foresee a long and happy future with this Company....well done! 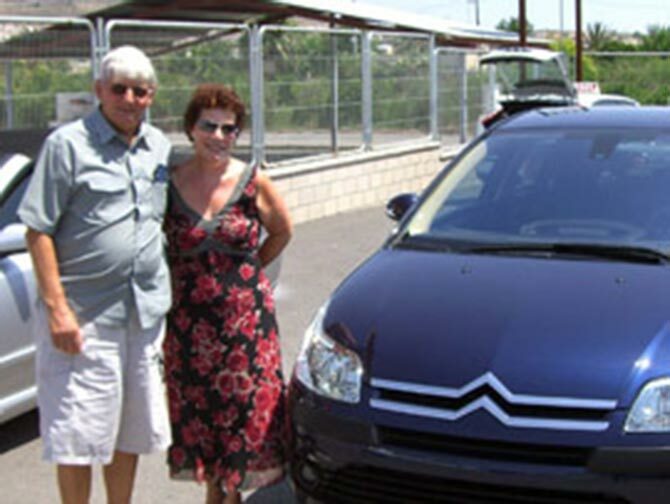 Just to say many thanks for your attentiveness when we came to look around your car lot, of all the cars we were interested in you explained everything we wanted to know about them we eventually bought a C4 Citroen and we are very pleased with it, I am sure when the time comes we will visit you again. 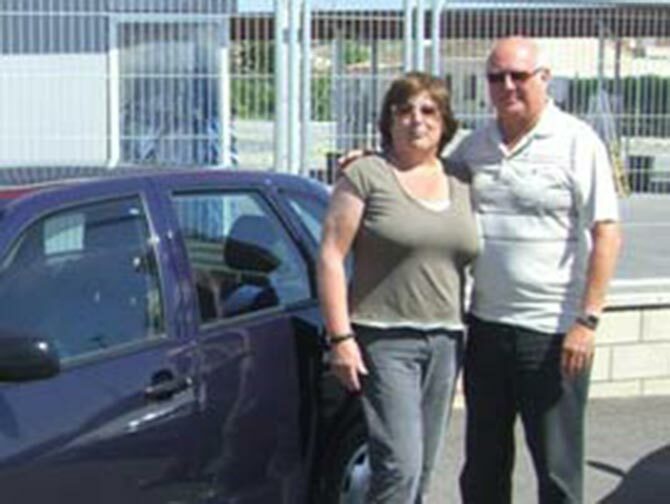 We have now bought our second Car from Autos Direct and are happy to say that we are very pleased with everything. Excellent service and very helpful staff. Also after sales have helped us in a perfect way. 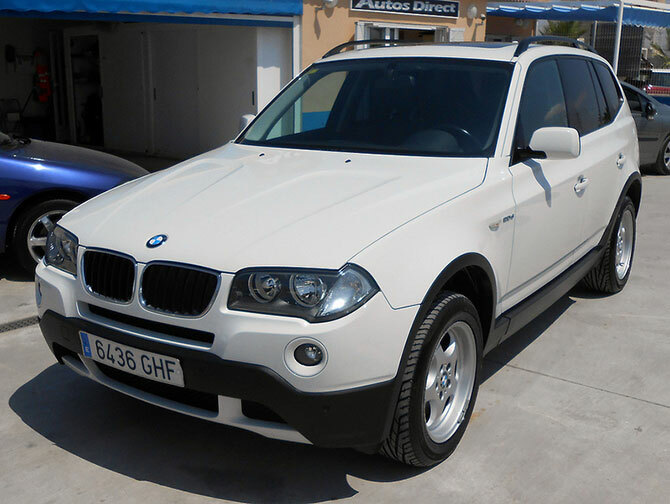 We can and will recommend this dealer to all friends in Spain. 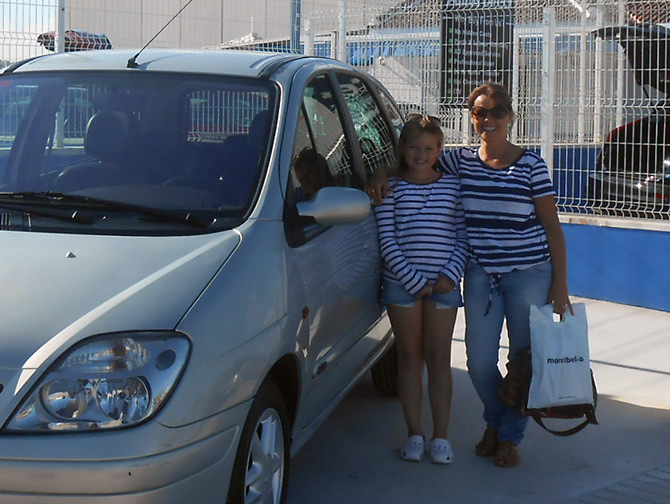 Thanks for all your help with the purchase of our second car, as usual excellent service. Very helpful and professional, always at the end of the phone for advice if needed. I would recommend Autosdirect if buying a car we wouldn�t go anywhere else, once again thanks very much from one very happy motorist many thanks ! We have brought 4 cars form Paul at AutosDirect the most recent for our business! Little Bits! Maintenance and Property key holding company, we as business people know how to look after the client and put them first every time!, so when looking to buy cars we expect the same service in return, form Paul to the owners and all the other staff their get it right, we would never get a car anywhere else and we recommended them to everyone looking for a car. 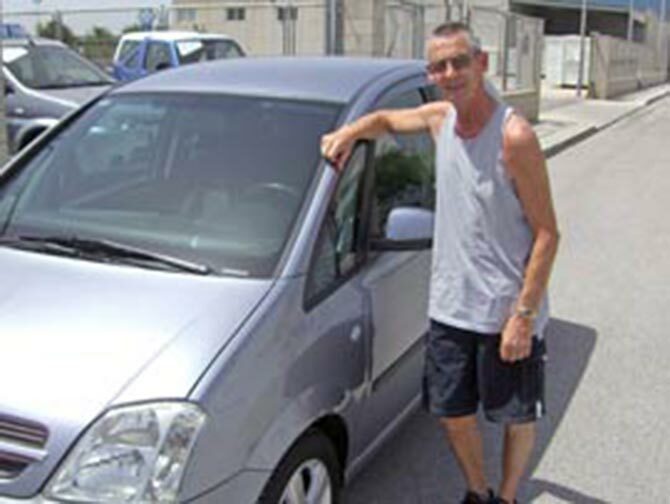 Hi Paul just wanted to say a BIG THANK YOU, for all you did for me to get a car so quickly, you helped me so much. You made it so easy and stress free. The car fits my so well my friend's say I have to name her so she is called Paula in your honour. Paula is handling really well, just have to remember not put my foot down too hard with her. Hope I won't see you for a while, but when I do need a new car I will not hesitate to call you! Just a quick message to say a big thank you to the whole team at AutosDirect for fantastic service and a great car. As you know it was a surprise for my wife's birthday. She is over the moon from the BMW . Highly recommend you guys to everyone both cash buyers and people who need some financing. Keep it that way. Top class! 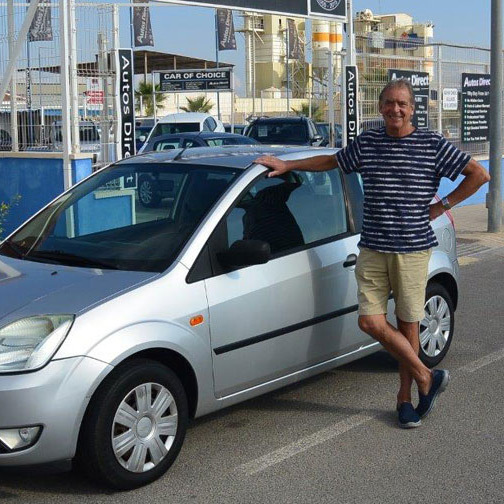 After purchasing a property close to Torrevieja at the end of 2015, it soon became apparent that it would be more economic and far easier to purchase a small run-around car rather than rent when staying in my newly purchased holiday home. 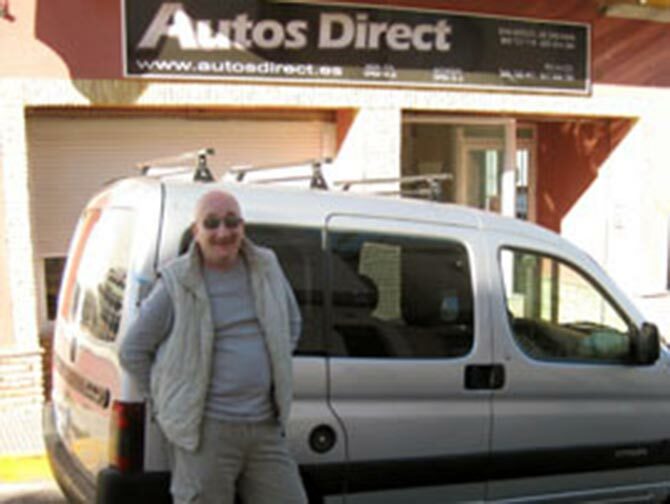 After making tentative inquires, a friend who also owns a place in Spain recommended Autos Direct. I was at the time in the UK so looked on the Auto Direct website and saw a wide variety of vehicles of various prices one of which was of particular interest to me. I was, at this point due to the fact I was in the UK, very reluctant to proceed further however I �Registered My Interest� on the website. I was soon contacted by Kevin (one of the co-owners) who basically talked me through the cars history, condition and also enlightened me on the process of buying the car online, something I had not even thought about. Not only did they offer a full refund if I was not happy but also offered a slight reduction on the price. I was also assured that the car would be fully serviced at the newly built �Bosch Service Centre� prior to me picking it up. I therefore agreed over the phone to the purchase and paid via bank transfer which was a very simple process. 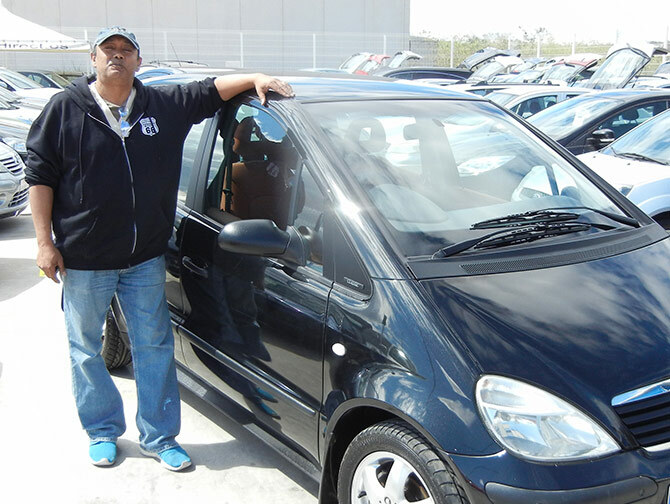 I was kept fully informed by Kevin both of the transaction and also the preparation process of the car and was also offered the option of being met at the airports to go and pick up the car which I declined and chose the following day for collection. When arriving at Auto Direct I was totally impresses by the appearance of the establishment which may I add would put a lot of UK car lots to shame. The car was on full display and was exactly as described on the website. The handover by Kevin was seamless, done in a lovely plush air conditioned office with Kevin assuring me that he would deal with all the Spanish transfers etc. something I had not even thought about. I left a very happy customer. 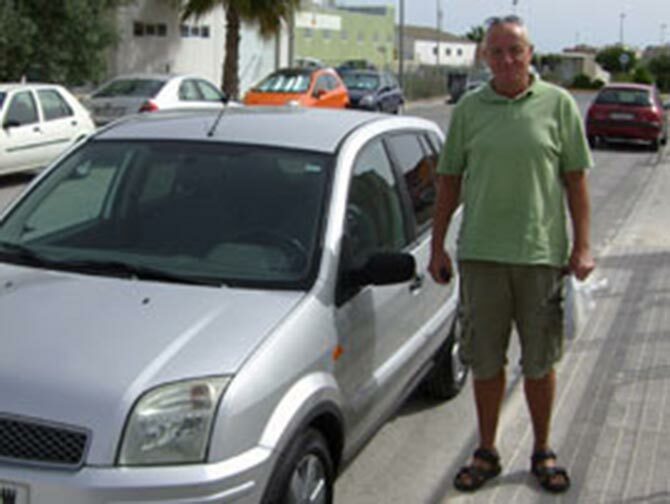 Unfortunately the car did developed a minor fault therefore I contacted Kevin and without any hesitation the car was booked in for a preliminary inspection where it was established the car was required for a day to make the necessary repair and for this I was given a Courtesy Car for the duration. 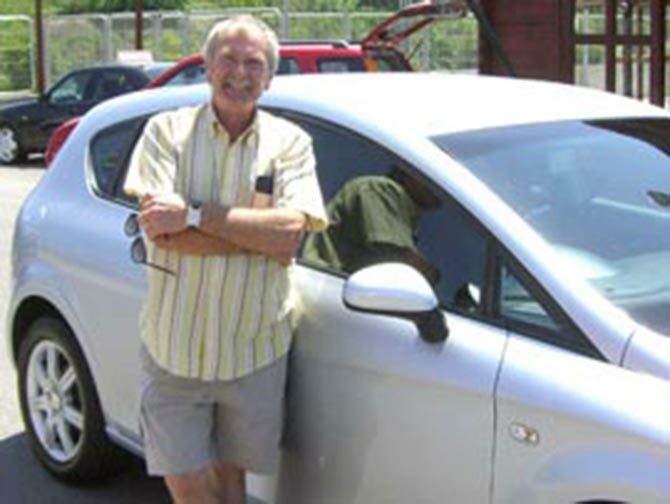 The car was duly returned fully repaired and the problem gone and a full apology from Kevin as he was totally unaware that the car had the fault prior to selling it. 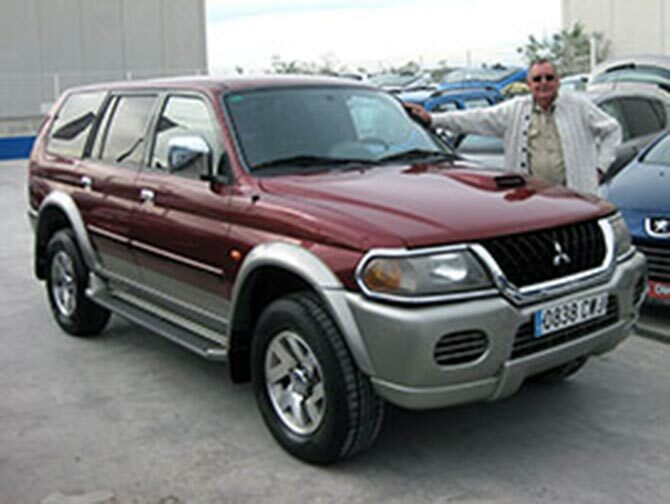 I can therefore, from my experience, totally and honestly recommend Autos Direct to anybody looking to buy a used car in Spain either whilst they are there or even if they are based in the UK. Their professionalism is second to none, their establishment as I have previously stated, knocks spots of most UK used car lots and there Service Centre as I have found out from experience provides a 1st class service. 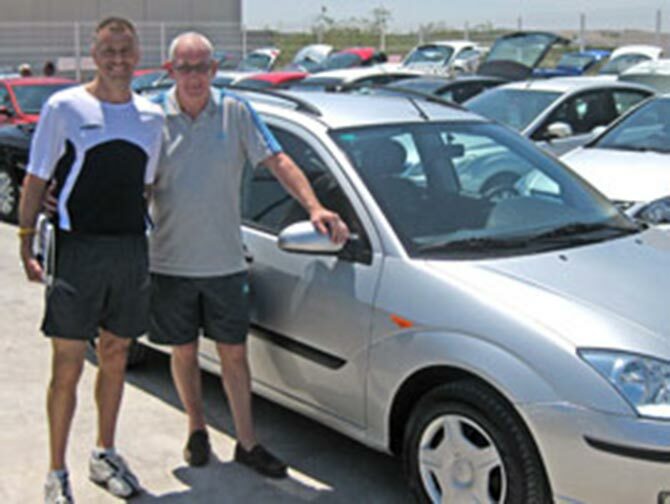 Both Paul and myself would like to take this opportunity in thanking you and everyone at Autos direct in helping us chose our first car in Spain. Once we decided what car to purchase you made the whole process stress free. We would definitely come back when thinking of changing our car in the future and would recommend AutosDirect to any of our friends. Thanks again.